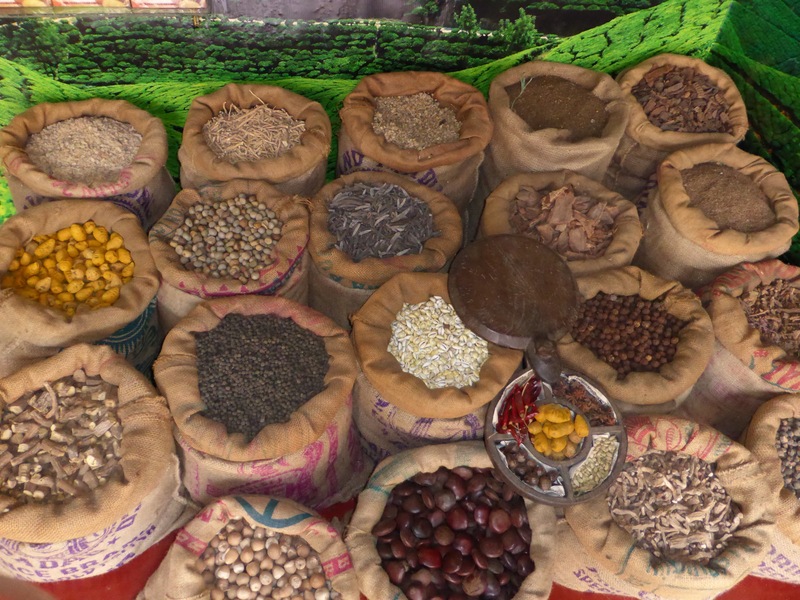 Having hungrily hoovered up the highlights of the golden triangle and holy Varanasi we head south, like a flock of migrating birds, away from north India’s unexpected cold snap towards Kerala’s sprawling port city of Kochi. The wall of heat that hits us when we land is most welcome, and I will admit to feeling smug as I finally slip into flip flops with months of time in India stretched out in front of me. 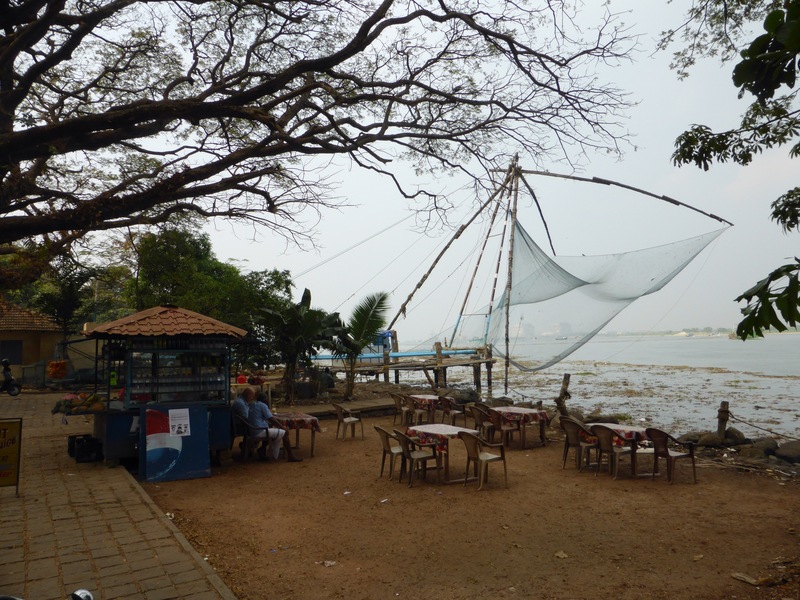 The city is a real masala of influences, from the gigantic mechanical fishing nets bestowed by China, the colourful Portuguese churches to the deteriorating British Raj architecture. And it’s not just the temperature that we feel changing, there is a real change of pace here too. 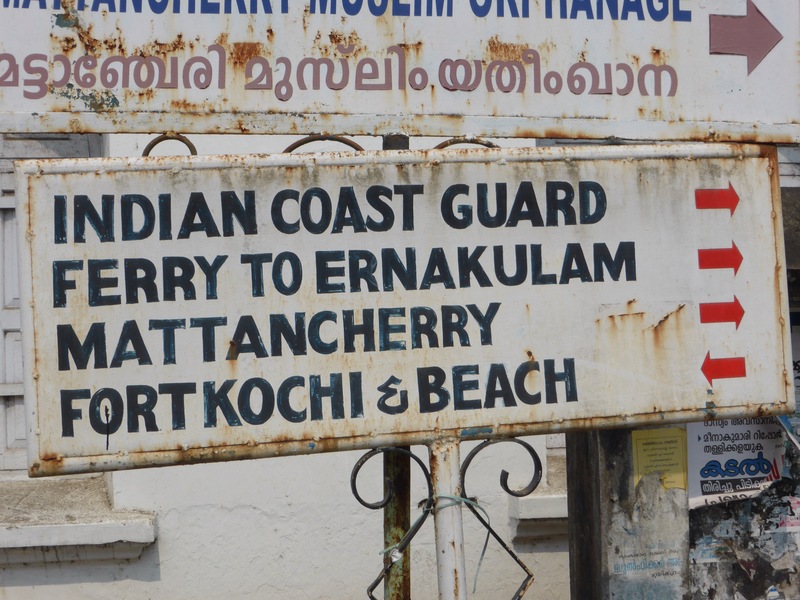 The frenetic transport hub of Ernakulem is straight forward enough, but it’s the intriguing villages of Fort Cochin and Mattancherry where this mix bubbles up and thus it’s the biggest attraction for travellers. 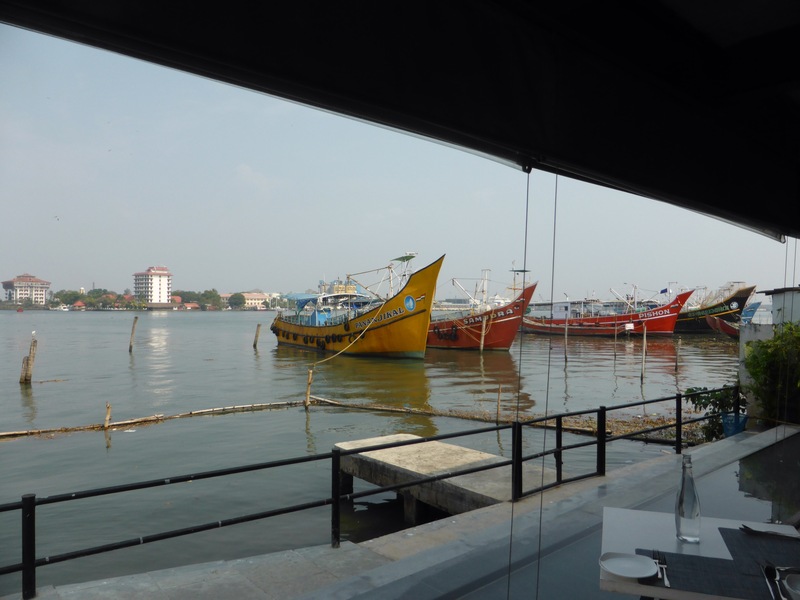 We’re staying across the water in Bolgatty Island and arrive by boat into the main port of Fort Cochin for our first glimpse of the Chinese fishing nets which punctuate the curved bay. Watching the cantilevered nets being dropped and raised in line with the tide is a right of passage here, it’s all hands on deck when the time comes. 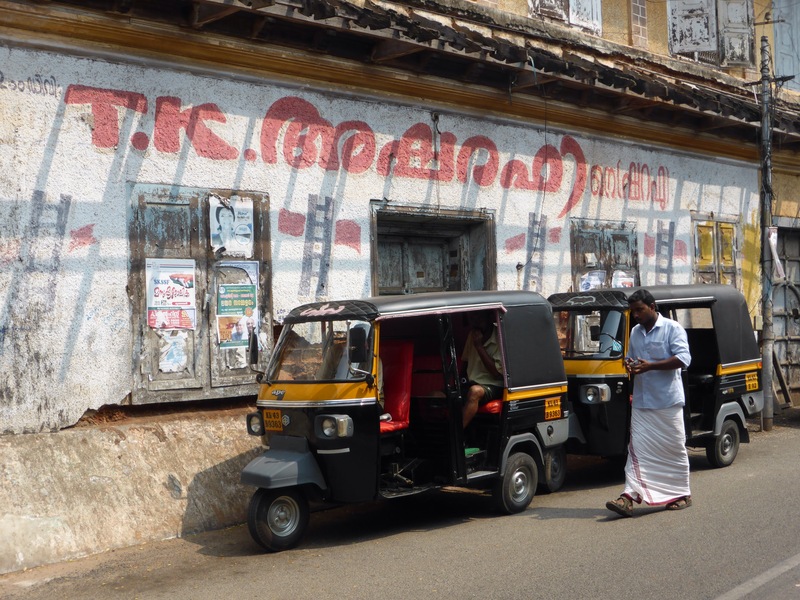 From here, we amble through Fort Cochin’s sleepy streets which are a collage of handicraft stores, bookshops and cafés. St. Francis Church stands at the end of the strip. 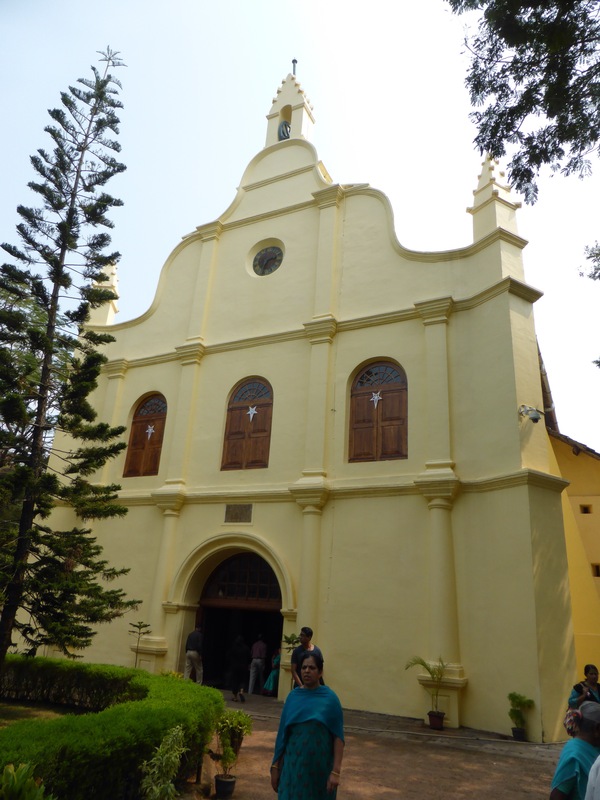 It’s thought to be India’s oldest European built church dating back to 1503. Portuguese explorer Vasco de Gama died in the city in 1524 and he was originally buried here until his remains were sent back to Portugal. His tomb still lies signposted in a macabre ‘here’s what you could have won’ kind of way. Doubling back on ourselves, we round the northern peninsula through a colourful little trinket bazaar specialising in paper lanterns. 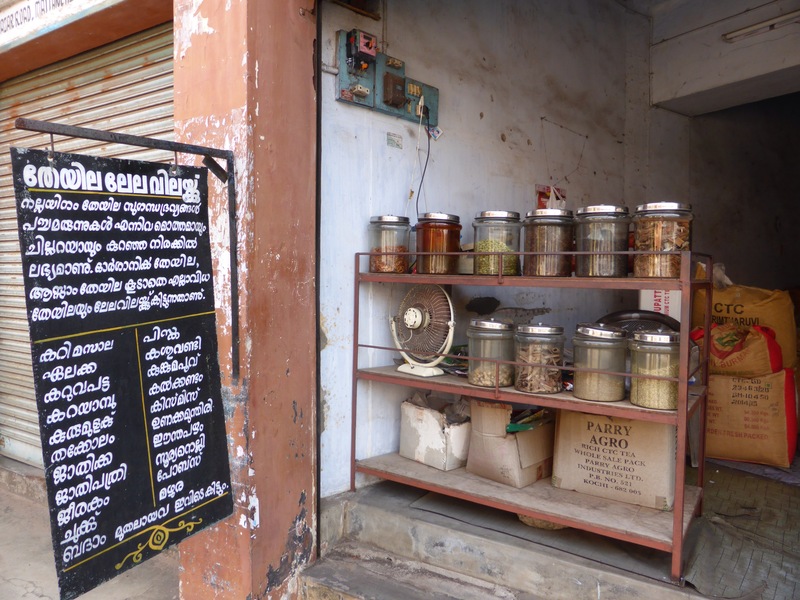 As we walk towards Matancherry, things start to get a little more interesting. 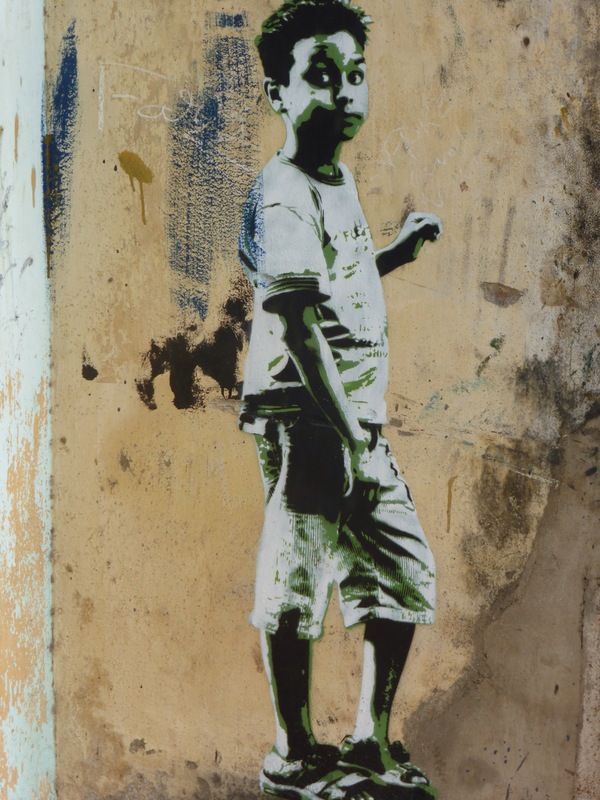 The streets narrow, and the walls are no longer blank canvases as street art meets our eye on each twist and turn we take. 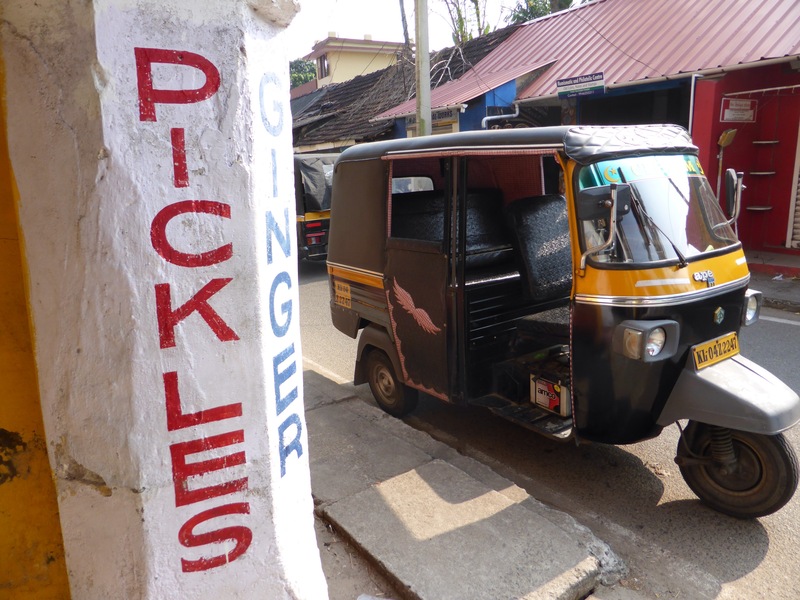 Unabashed by the narrow streets, industry ploughs on around us, together with the symphony of car and tuk tuk horns forming the street opera we’ve grown to love, or at least accept, in India. 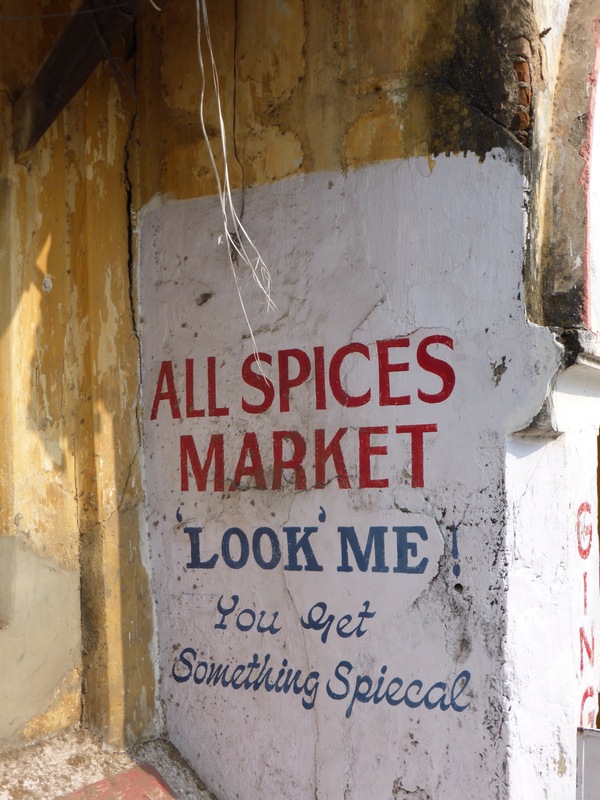 Spice markets now line our route. 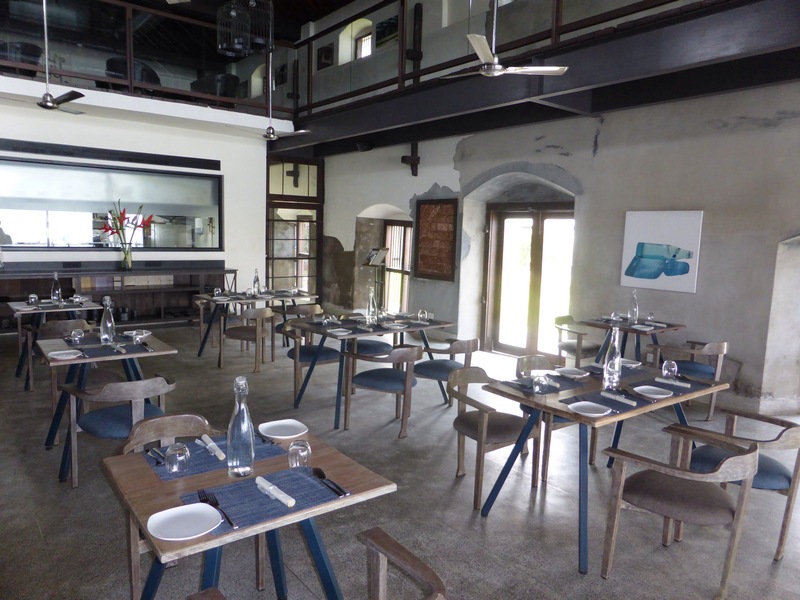 When it’s time to refuel, suave new restaurant 51 ticks a lot of boxes with vistas across the ocean and contemporary distressed steel inside. It’s more contemporary middle eastern and Mexican than it is Indian, but the food is exquisitely seasoned and beautifully presented. 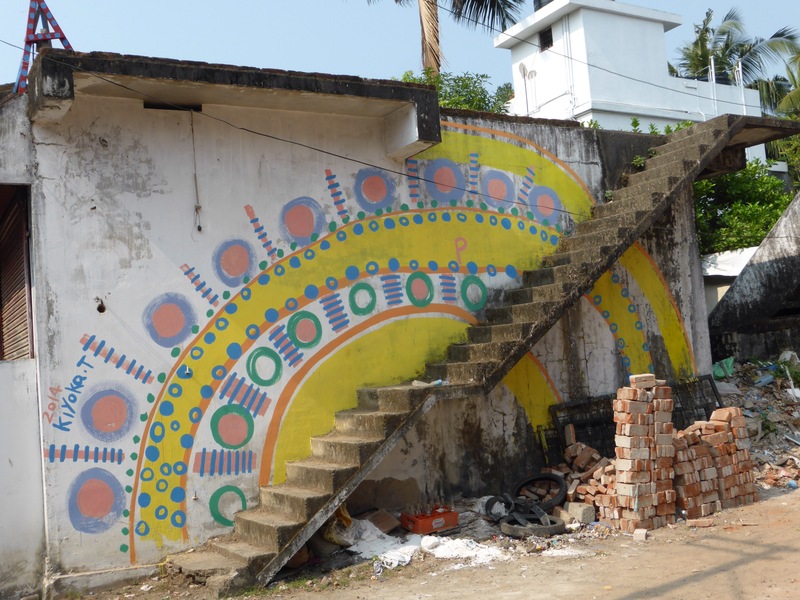 We soak up the last of the sun ambling back to the port through the colourful streets. Back at the hotel a tantalising signpost greets us. After a long day walking in the serious sun, it doesn’t take long to make our decision. Naturally we turned left. And after one too many (or one too few depending on which way you look at it) ran into this Kathakali dance artist who had just finished a performance of the Keralan traditional classical dance. This is not a face we will forget in a hurry. 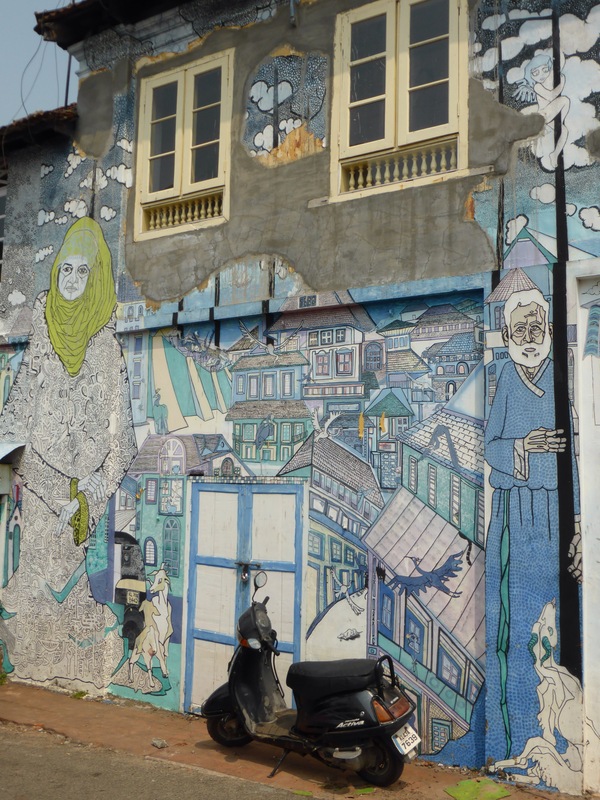 The next day, with dreams of sand between our toes, we board a four-hour train south to the backpacker hangout of Varkala, set precariously on steep cliffs overlooking sandy beaches that gaze out at the Arabian Sea. 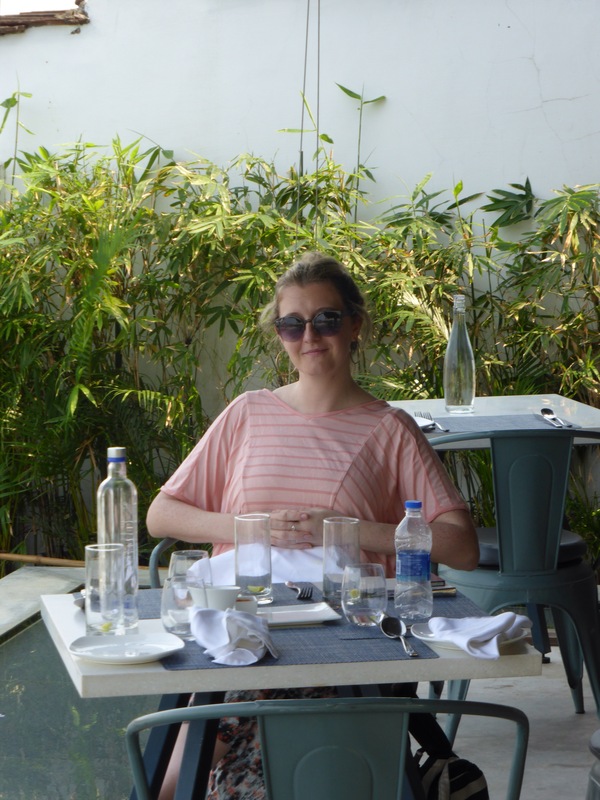 This is where Jess, Laura and I will spend our final few days together before they hightail it back to London and I let the breeze steer me through the rest of India. And what a way to go. Many who’ve gone before warned me that they ended up staying way longer than planned here in Varkala…which is exactly what happened to me. In my defence, just look at the place. It is principally a temple town flanked by the busy little strips of North Cliff and South Cliff (Heathcliff?) 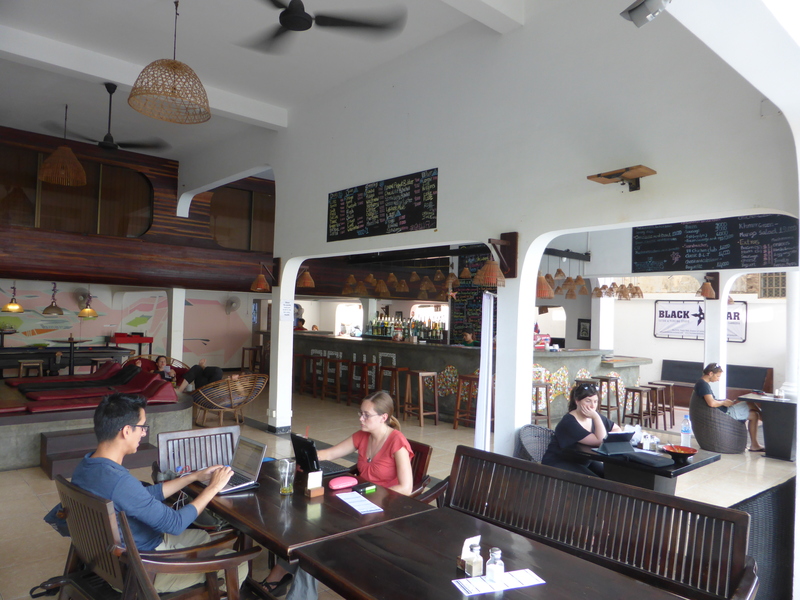 and we settle into Soul & Surf on the latter and are quickly sucked into the Varkala vortex. Here, in the pristinely painted and comfortable well-finished rooms, the focus is on yoga, pranayama and massage for the soul, and the frothy swell of the Arabian Sea currents for the surf. They get the balance just right and it’s a fantastic place to spend some time. then we’re larking about (or asleep) on the beach. Despite this hectic schedule, we valiantly manage to s.queeze in some massages and Ayurveda treatments. Those of you who have holidayed with me will know that Primal Scream’s ‘Screamadelica’ album is my absolute favourite to listen too on a beach. 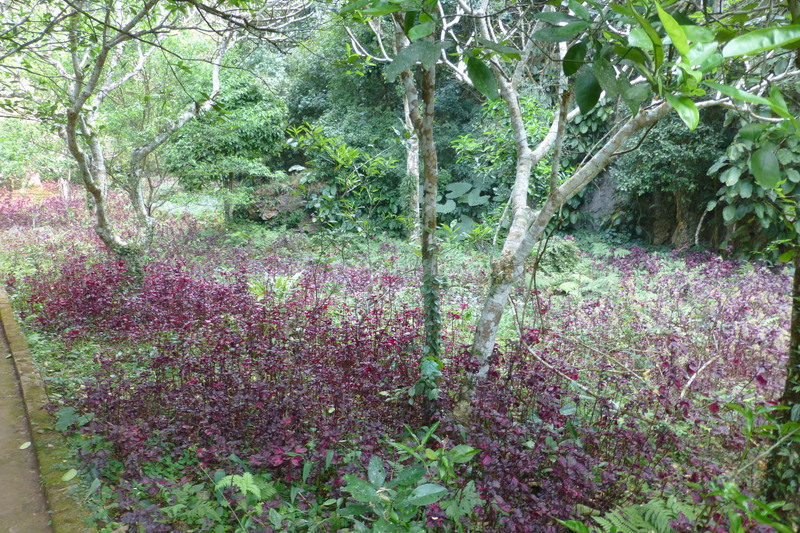 I discovered in Varkala that Beck’s ‘Morning Phase’ is an incredibly close second. In the evenings both South and North Cliff keep us amused. Being a temple town, getting an alcohol license isn’t possible, but the various bars and restaurants along the strip flaunt this wildly by serving beer wrapped in newspaper and poured into mugs under the table. Not that we’re complaining. Nor are the police. Each time they catch a restaurant in the act, a tasty little baksheesh goes into their back pocket. Standard. They even advertise the cocktails on their drinks list with secret ingredients; Gimlets with ‘G Juice’ and Piña Coladas with ‘R Juice.’ Stealthy. ..the unenviable task of entertaining me falls to Ben, Abi and Steve and a sterling job they do too. As luck would have it, they all live in North London too and I’m already looking forward to the reunion dinner at Rasa in Stokey. Sooner than I’d like it is time to say goodbye to this view. …but hello to this one! The next stop is the quintessential Kerala experience, a leisurely cruise along the backwaters setting sail from bustling travel hub Alleppey (also known as Alappuzha) in a wee bread basket of a boat. The crew of able-bodied seamen consisted of Captain Babu, first assistance Raj plus chefs Subaj and Fijo. 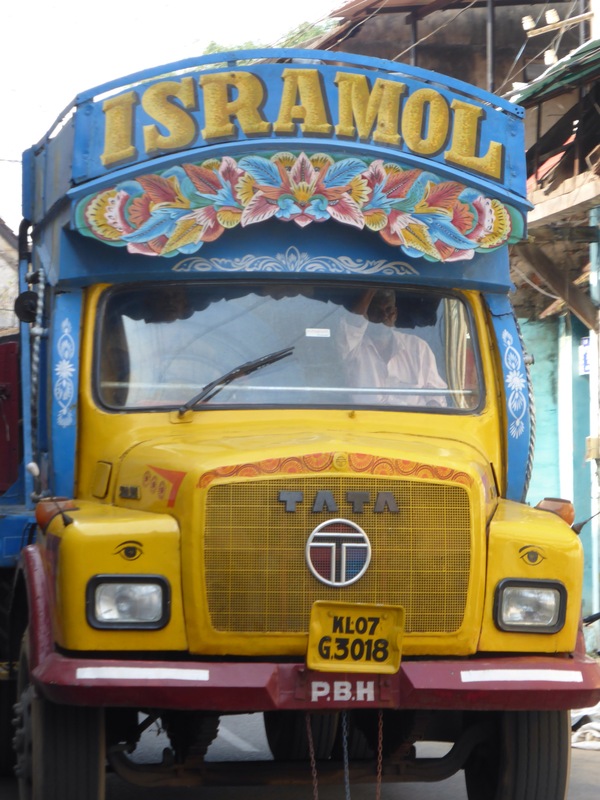 These fine fellows steer us through some of the most stunning scenery I have ever seen. Palm-fringed waters lead onto a patchwork of rice paddy fields as far as the eye can see. Meanwhile, vibrant and colourful village life carries on around us for those who live by the water’s edge, for whom the river is their playground, their laundry, their bathroom and their fortune. We anchor up for the night to watch the sun drop into the paddy fields behind us. 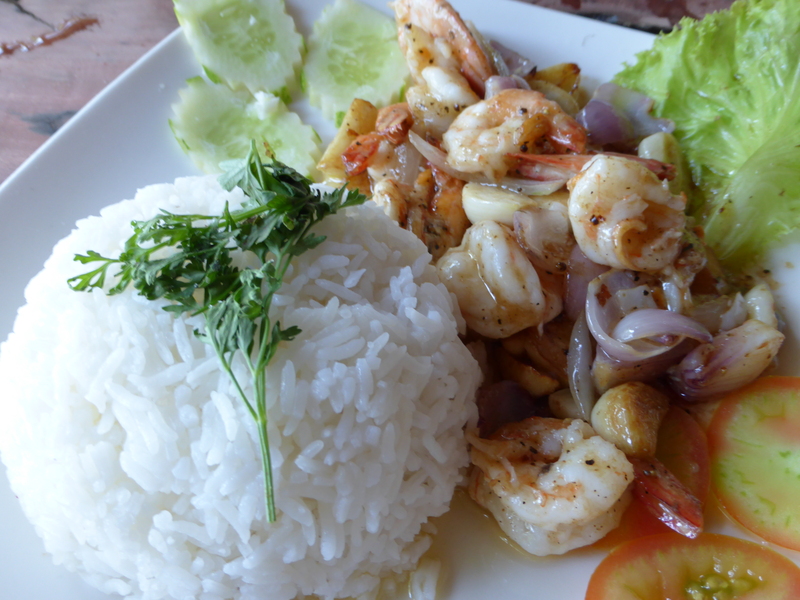 Then we turn our attention to preparing the catch of the day; tiger prawns and tilapia. 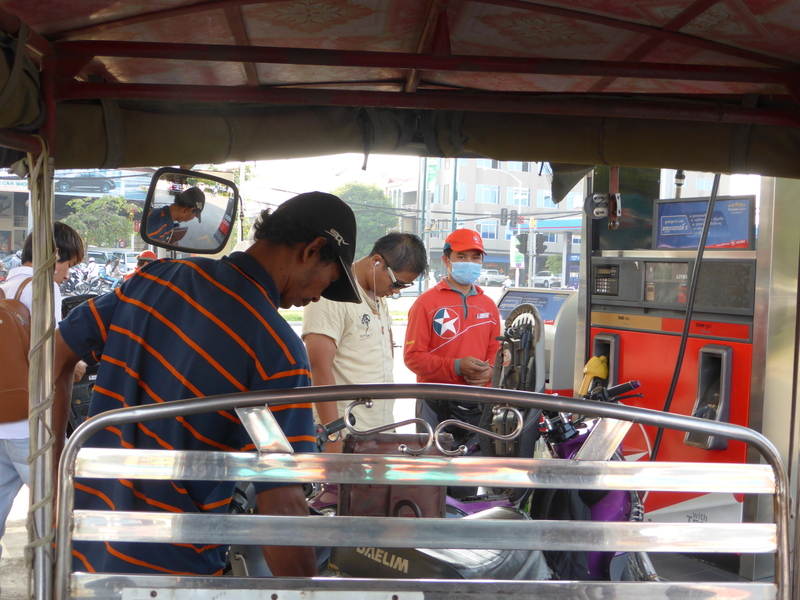 My introduction to the city of Phnom Penh is much like every other introduction has been during my time in South East Asia, whizzing by in a clapped out old bus…followed by a clapped out old shoddily-negotiated tuk tuk. 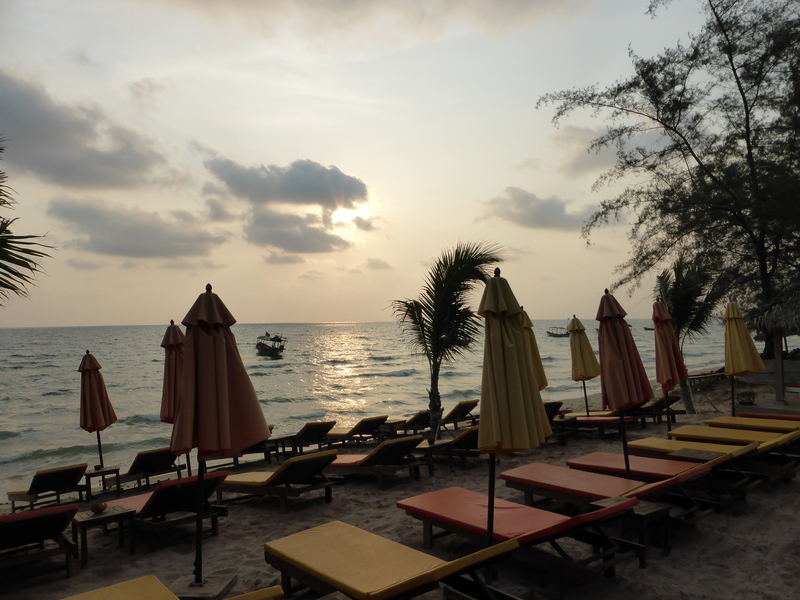 This time I am arriving from Sihanoukville on the coast of the Gulf of Thailand with (increasingly ill) travel buddy Buffie. 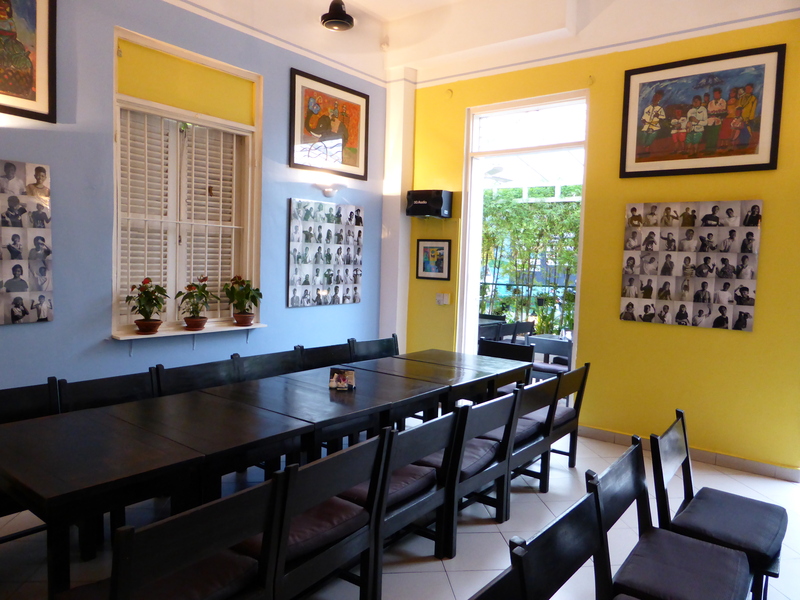 We check in at Eighty8 hostel which touts itself at the ‘flashpacker’ market, those willing to pay an extra dollar or two for increased luxury. 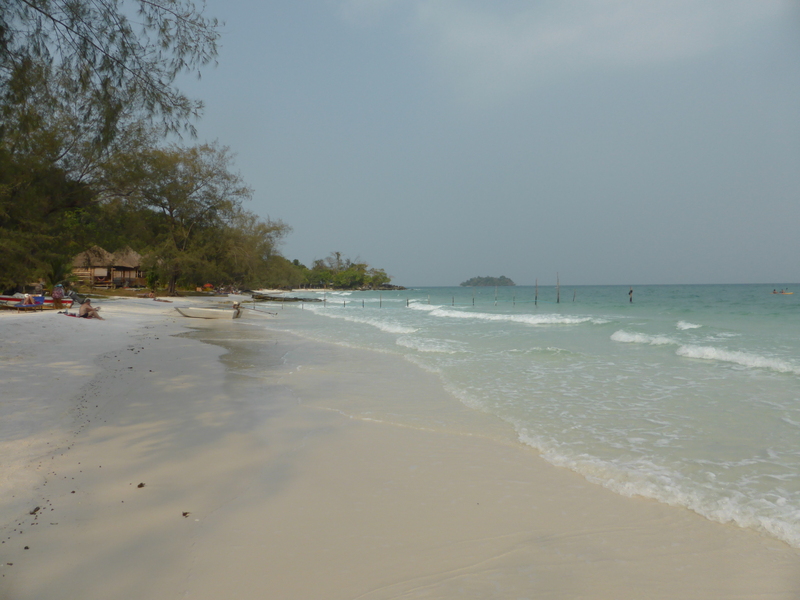 After the rat infested beachfront pad on Koh Rong, we feel we owe it to ourselves. This is the glamour to which we have not become accustomed. 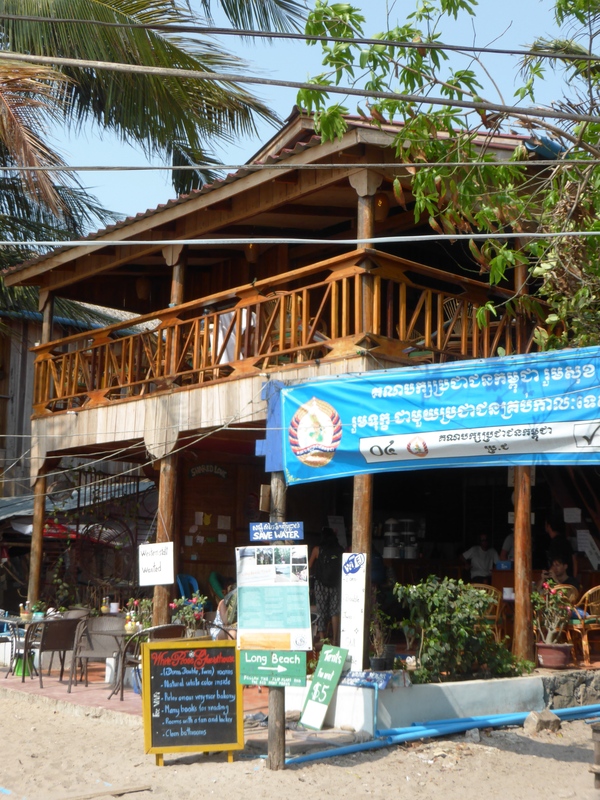 Named after the street it is on, it’s in the north-east of the city around 5 minutes walk from Sisowath Quay where the boats arrive from Siem Reap. So exploration starts with a long walk through the city from north to southern tip. 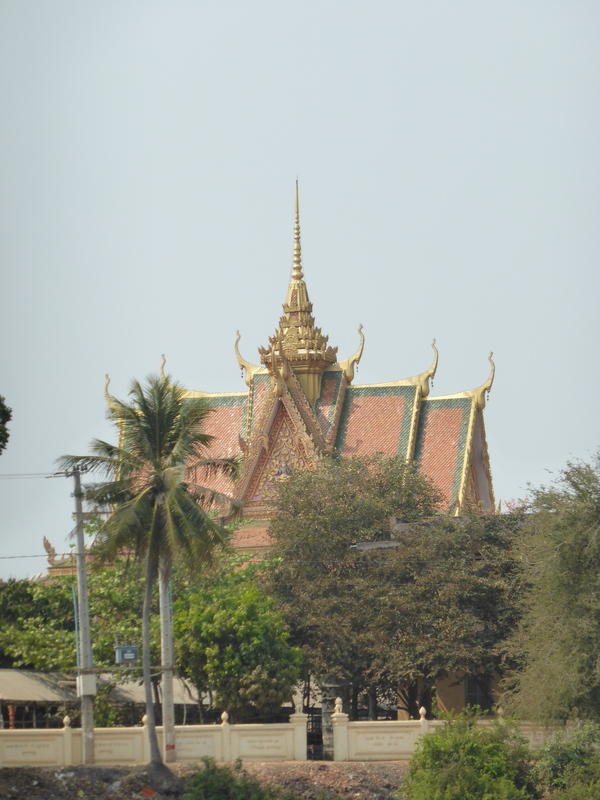 Wat Phnom is the first item on the agenda. It’s the hilltop sanctuary from which the city takes its name. 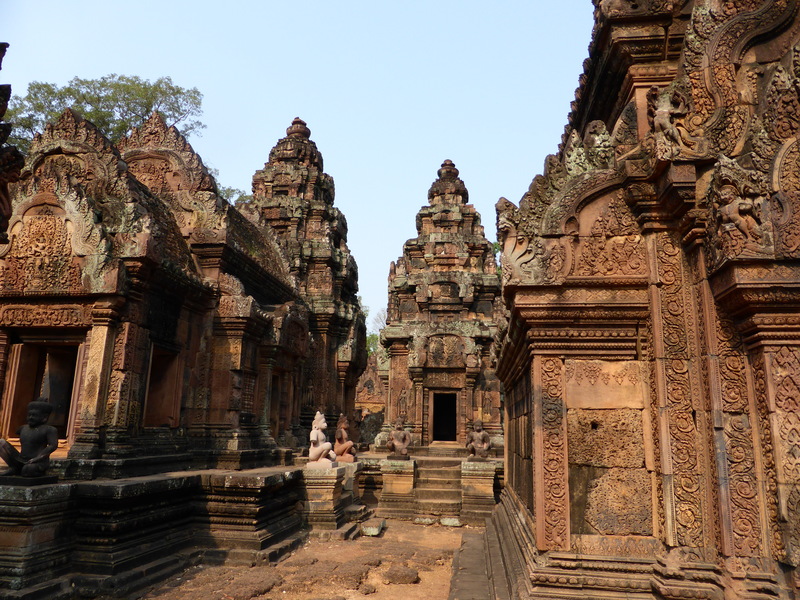 Cambodian legend has it that a wealthy widow called Daun Penh (try saying it without thinking of Sean Penn) found five bronze and stone Buddha statues in 1372 during a walk along the Tonle Sap river. 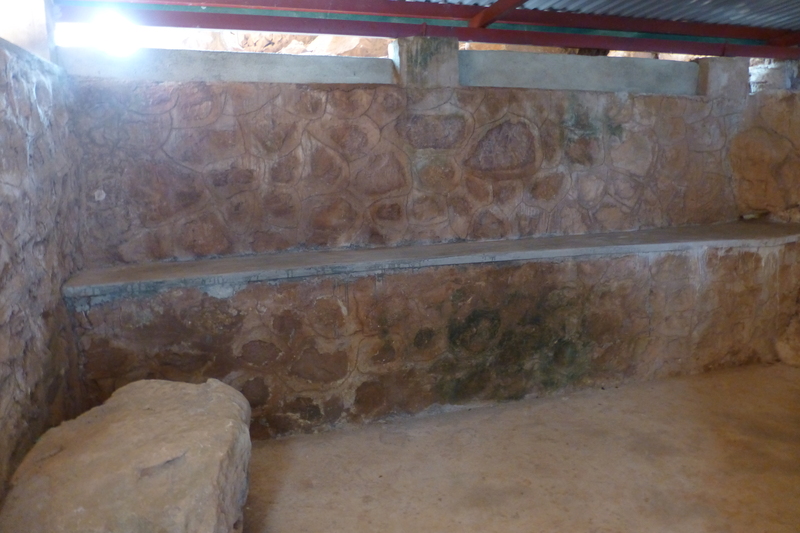 As a mark of respect, she built a sanctuary on the top of a hill to house them. 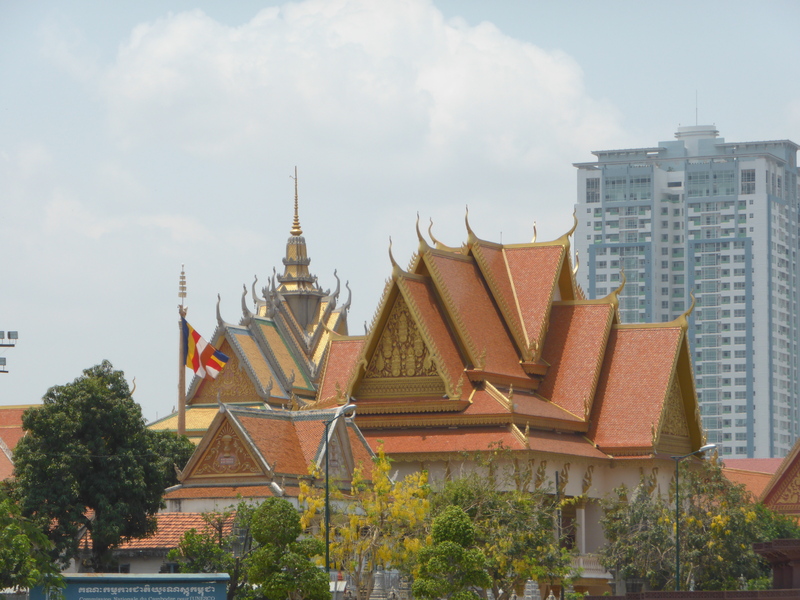 It became known as Phnom Penh, translating as the hill of Penh. Over time, it became the shorthand for the city that sprung up around it. 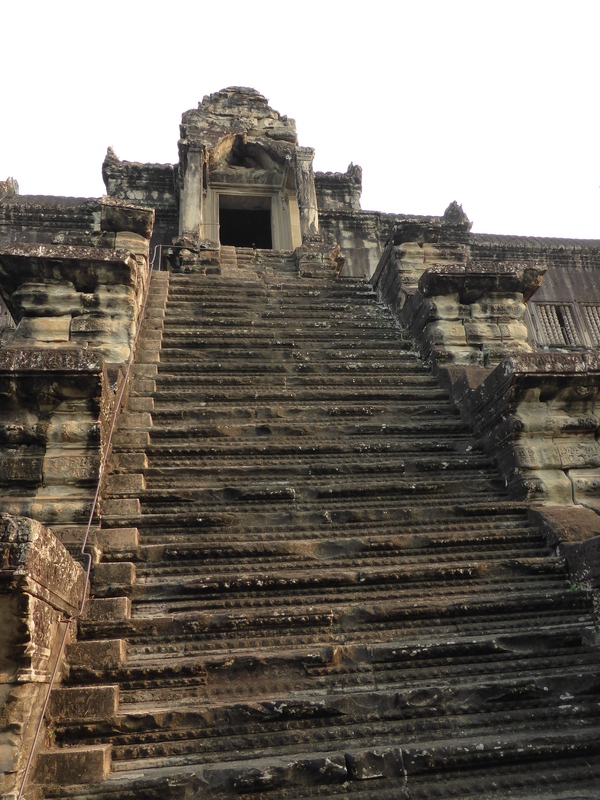 With $1.50 ticket in hand, I ascend the stunning naga staircase passing bronze carvings of battle scenes and Apsaras dancing, replicated to look like those at Angkor Wat. 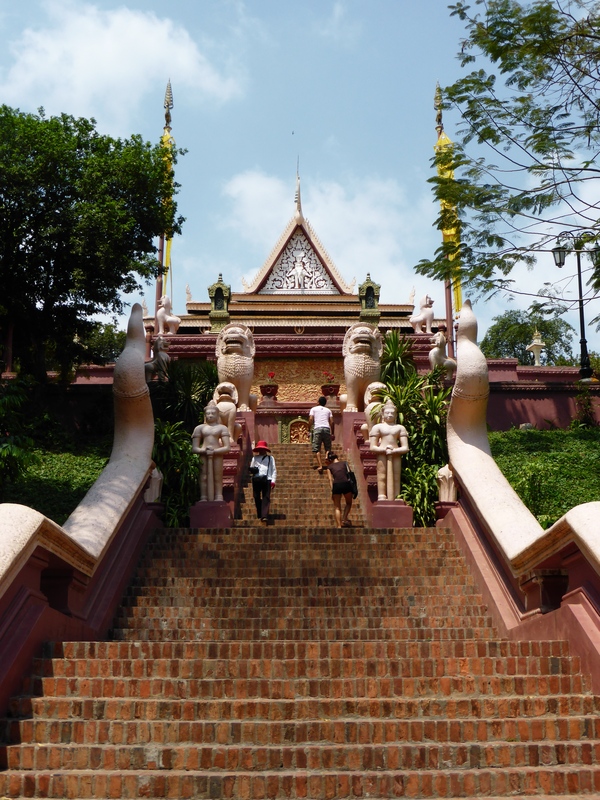 The sanctuary, or vihara, at the top was rebuilt in 1926 and little of the original building remains but it is very close to the heart of the population here, so it’s worth spending some time at the summit surveying the city or cross-legged in meditation inside the Wat itself. The inside is beautiful, vibrant and colourful. 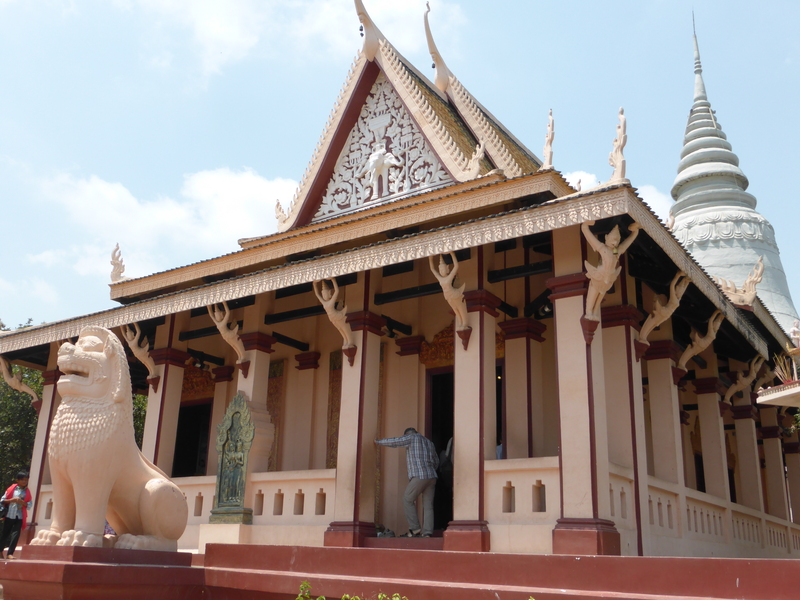 Behind it, a stupa has been built to honour Daun Penh. 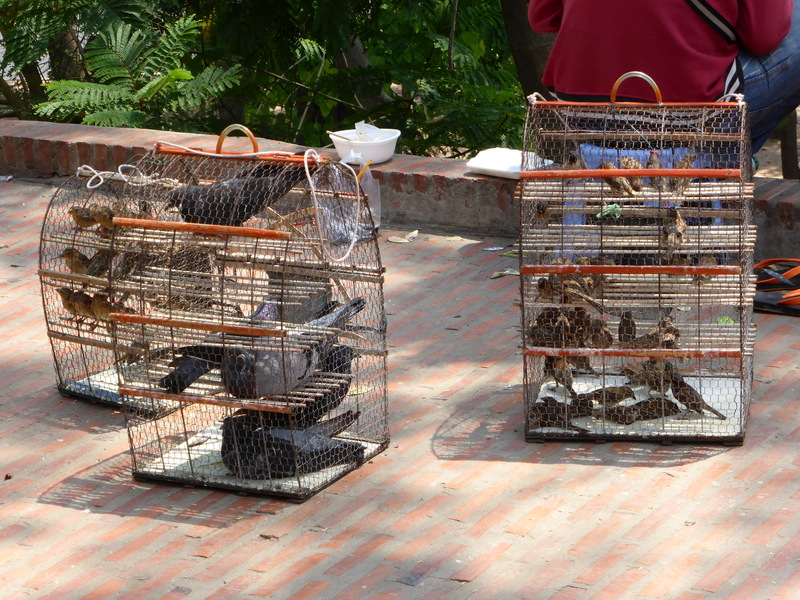 Not unlike neighbouring Laos, the Cambodian people also release birds from cages at the top of the hill to invite fortune and good health. 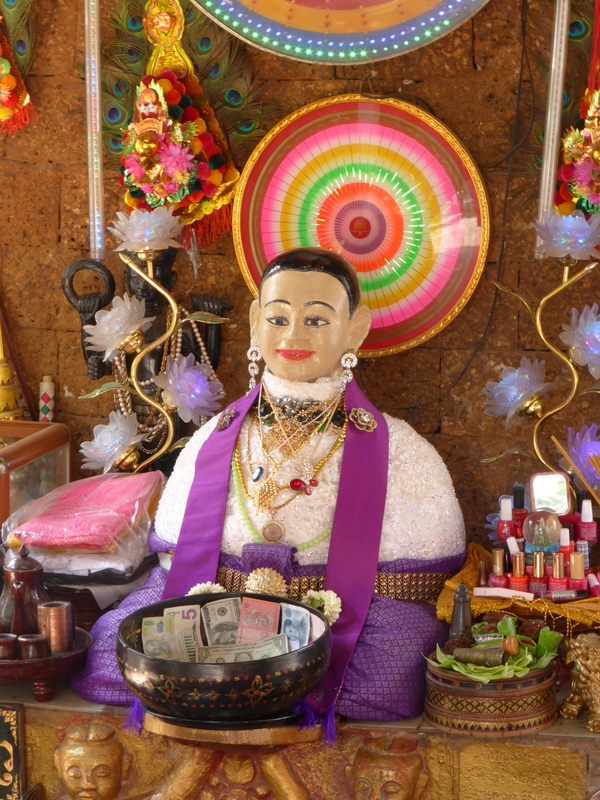 Offerings are left inside the wat for the statue of Buddha; some of food and some of local currency the Riel. 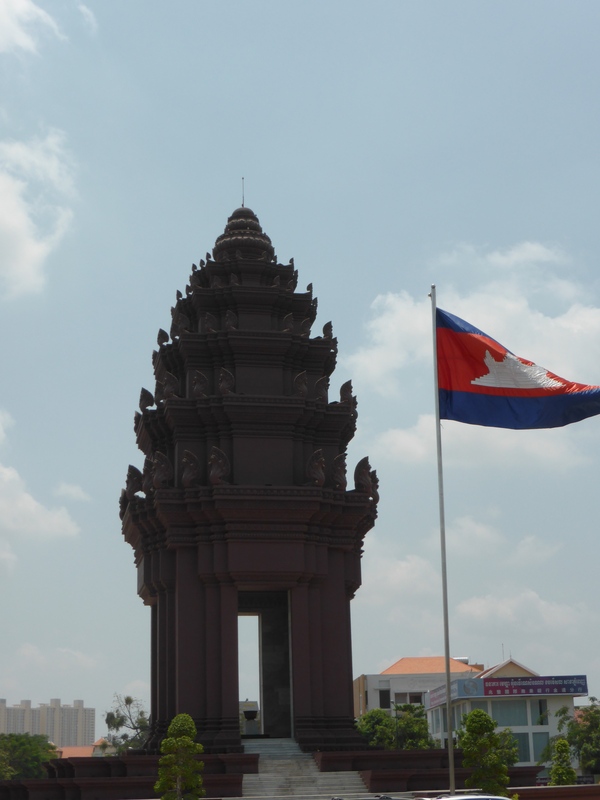 Continuing south, at the crossing of Sihanouk and Norodom Boulevards, I see the Independence monument which has the dual role of commemorating independence from the French in 1953 but also stands as a cenotaph to those who have died in war. On display around it are the riches of various parliamentary buildings, in stark contrast to the poverty I’ve seen elsewhere in the country. 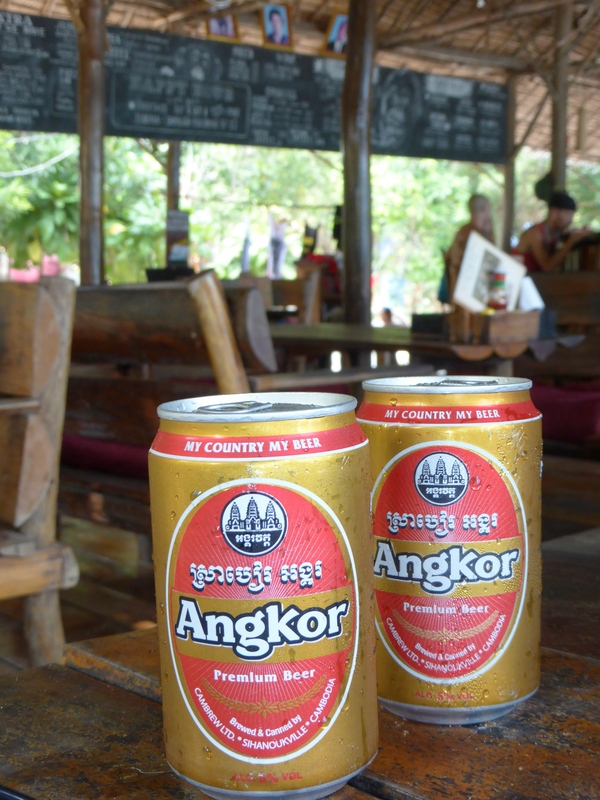 I swing into Mali’s for lunch and a couple of Kingdom beers on nearby Norodom Boulevard. It’s a grand spot, if a little formal. After lunch, I set my internal compass for Psar Toul Tom Poung (the Russian Market) but I seem to be following a slightly fraudulent map. I’m still walking 90 minutes later…but many of the sites along the way have kept me in good humour. 1) It is nigh on impossible to cross the road. You’ll find many of your restaurant/shop/sightseeing decisions are led by this. 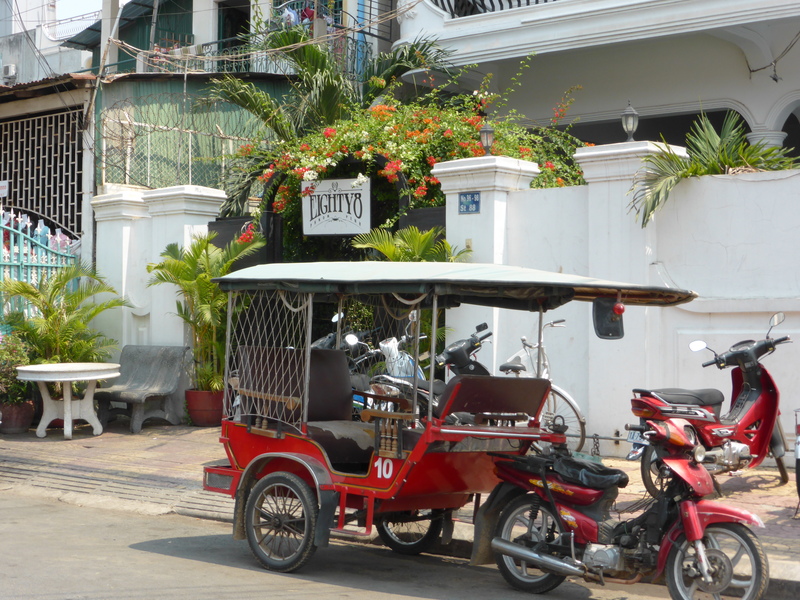 2) As a visitor, you’ll be offered a moto taxi or tuk tuk approximately three times per minute. It’s not at all irritating. Eventually, (273rd time’s a charm) I grab a moto taxi to the Russian Market, so-called as all the goods would have originated from there, Russia being the only country to provide aid during the Vietnamese occupation. 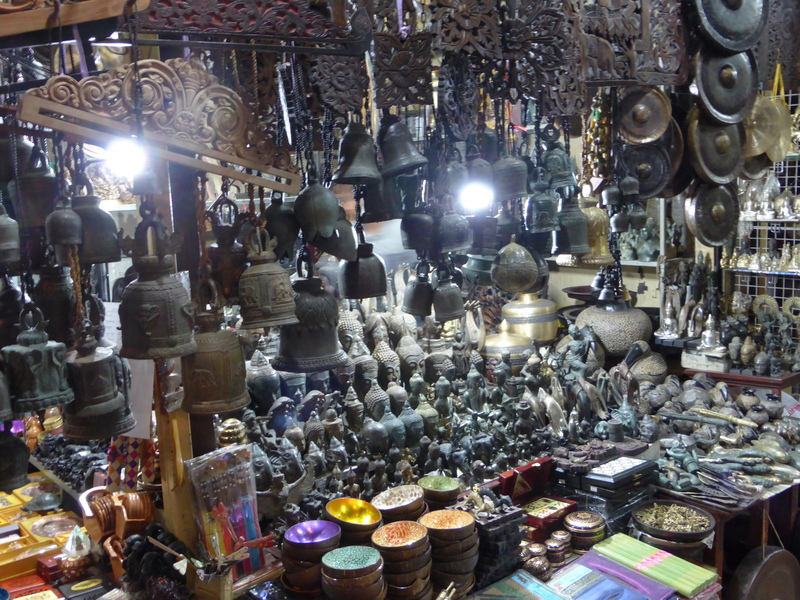 Browsing through the ramshackle tarpaulin-covered market, I find it’s the usual miss mash of textiles, hand-carved artefacts…and knock off electronics. Dr Dre was kind enough to reduce his speakers to a mere $3 here. What a philanthropic gent. and (via the petrol station) I’m headed north again. 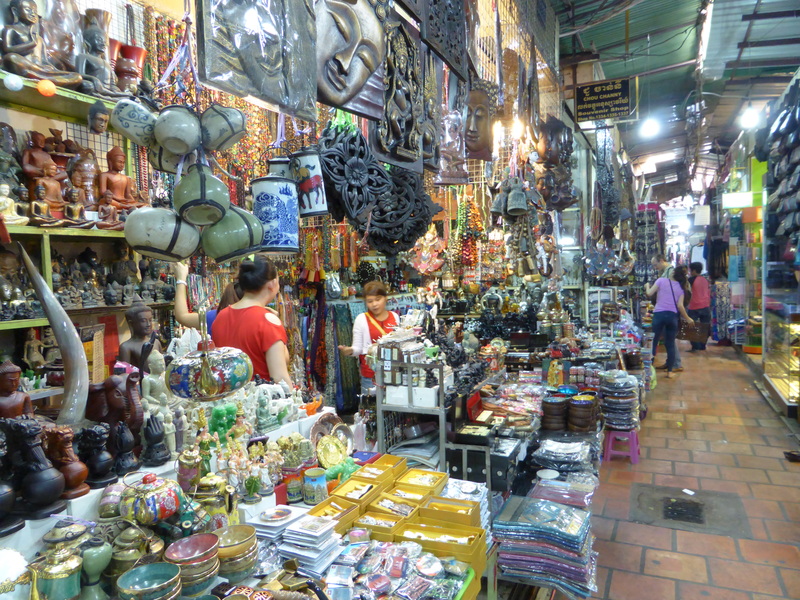 Street number 240, just behind the Royal Palace and Silver Pagoda, is where you’ll find the craft boutiques and book shops. 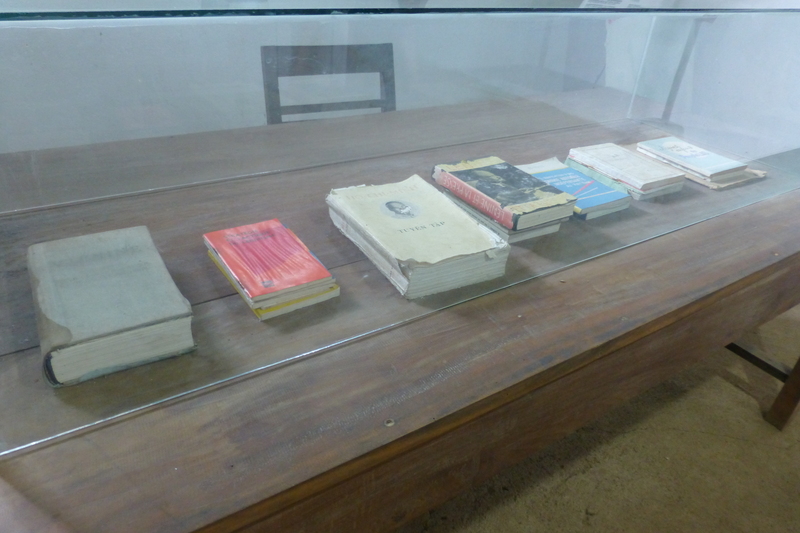 After a browse at D’s Books on 240 and Monument Books on Norodom Boulevard, I bag a copy of Virginia Woolf’s ‘To The Lighthouse’ before scooting back to the hostel to scoop up a much less peaky Buffie. 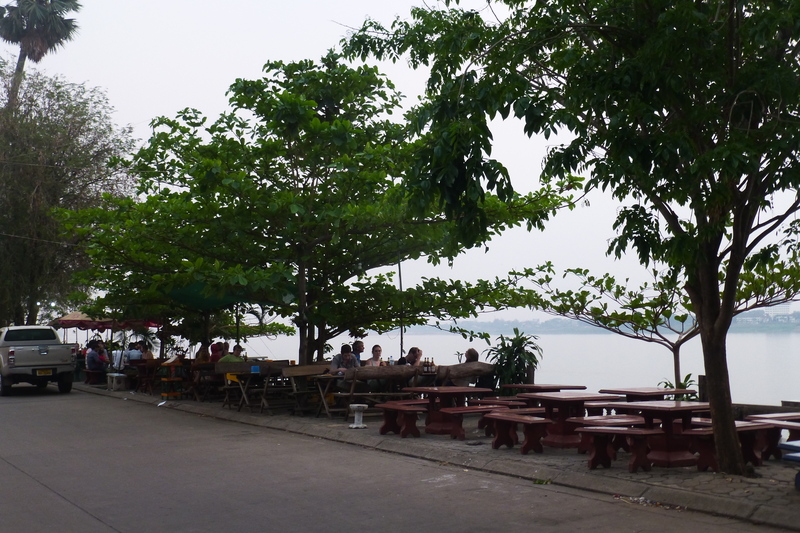 We head out to Bopha Phnom Penh, a beautiful outdoor restaurant on Sisowath Quay. 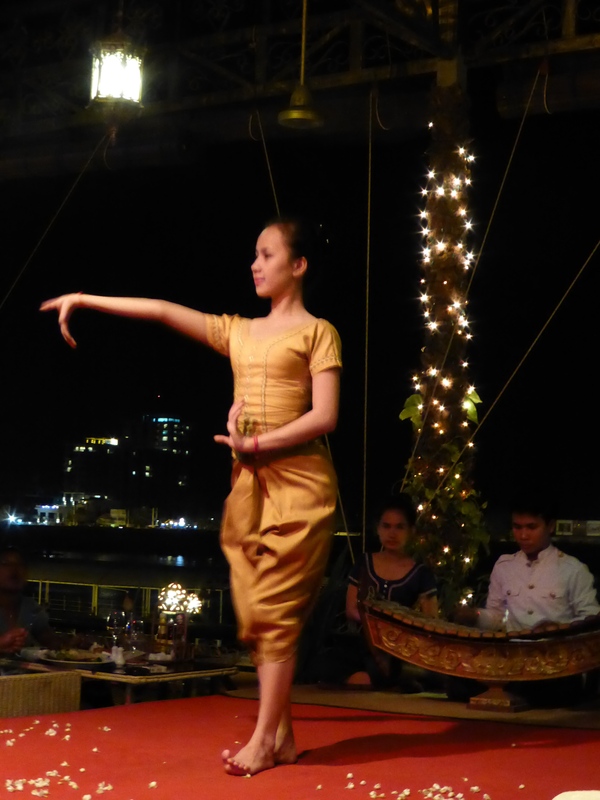 Despite this being the site of our initial hoodwinking when we first arrived in Phnom Penh ($5 to tuk tuk 25 steps) we still manage to enjoy the lights twinkling on the Tonle Sap river and the Apsara dancers defying the laws of joint capability. They accompany our Fish Amok curry washed down with a house speciality cocktail made with their local spirit. Game. We dart across to the Flicks 2 on 136 which is a comfy, cozy cinema that regularly screens movie The Killing Fields. 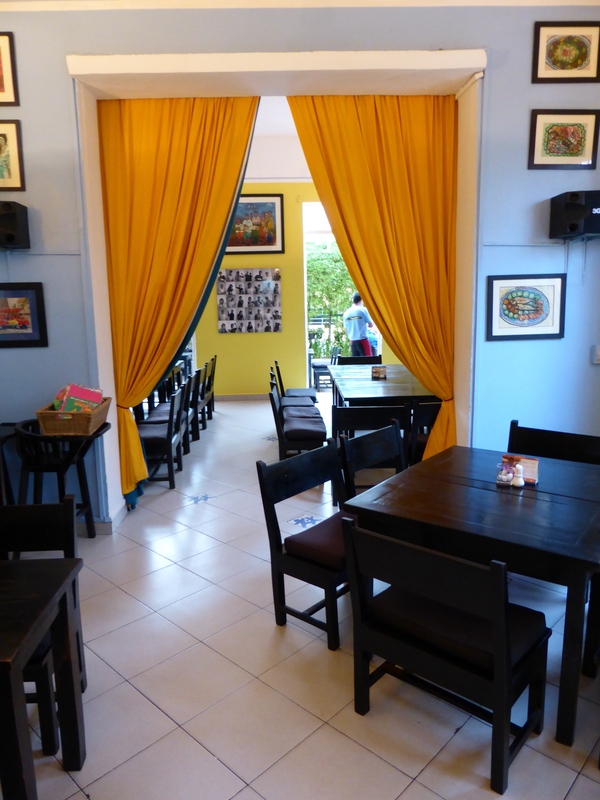 The next day, we swing by Friends which is a not-for-profit cafe that supports the training of young chefs and servers in the hospitality industry. 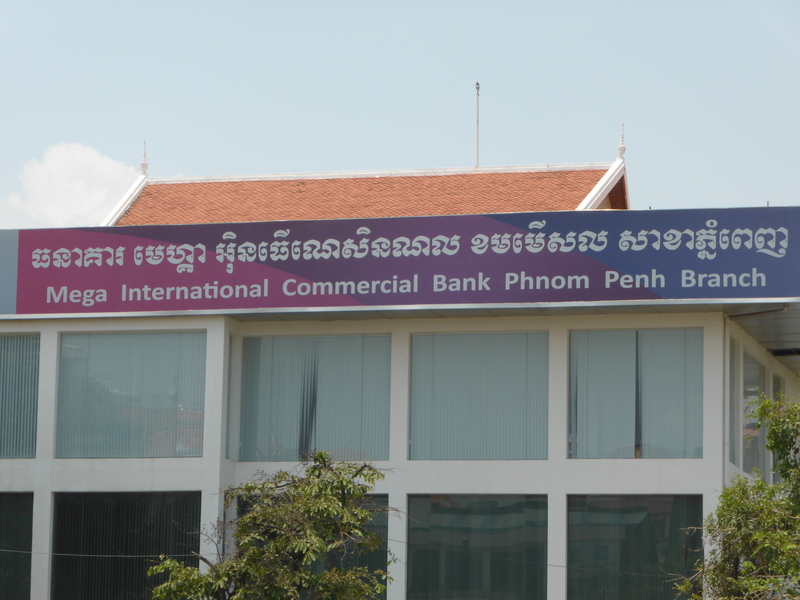 There is so much to compute at the end of our trip to Cambodia. We do so with outstanding falafel burgers and raspberry rum cocktails. Afterwards, we cross to the Foreign Correspondent’s Club to watch the world go by below. 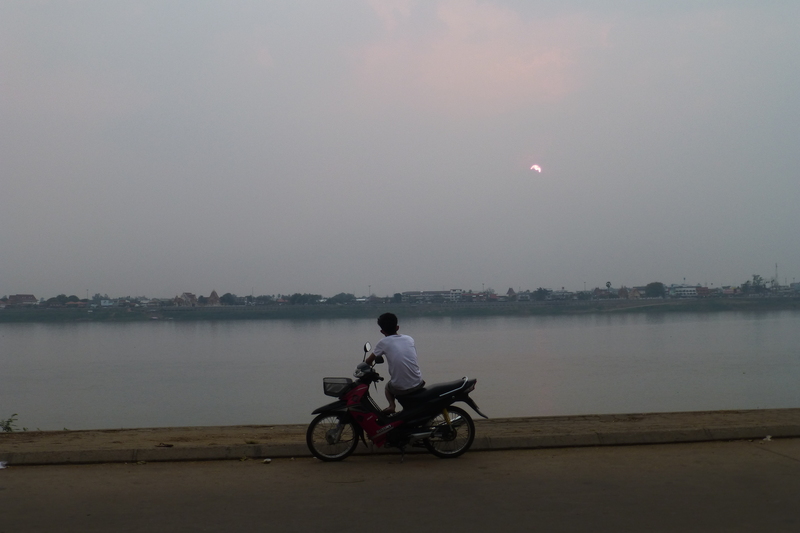 And I watch my final sunset over the Mekong (on this trip at least.) 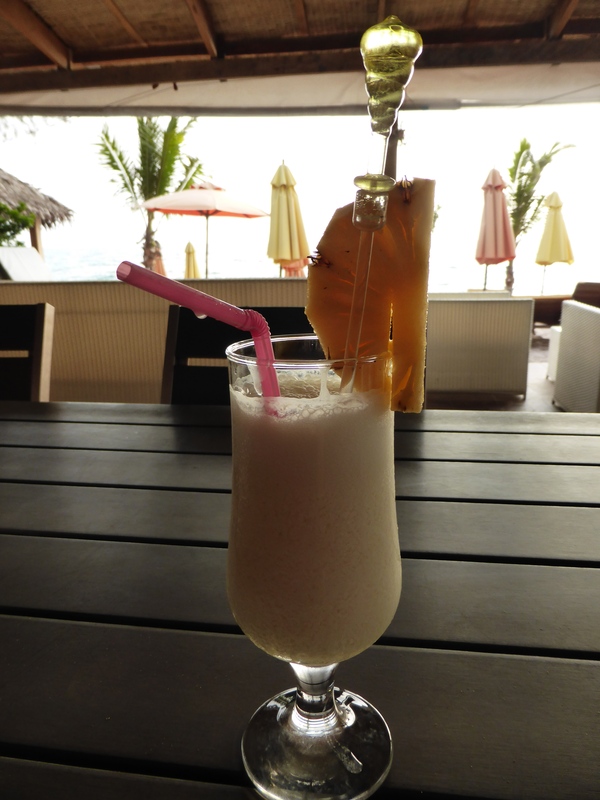 It’s how this trip started back in Ventiane so it seems right and proper to end it that way. 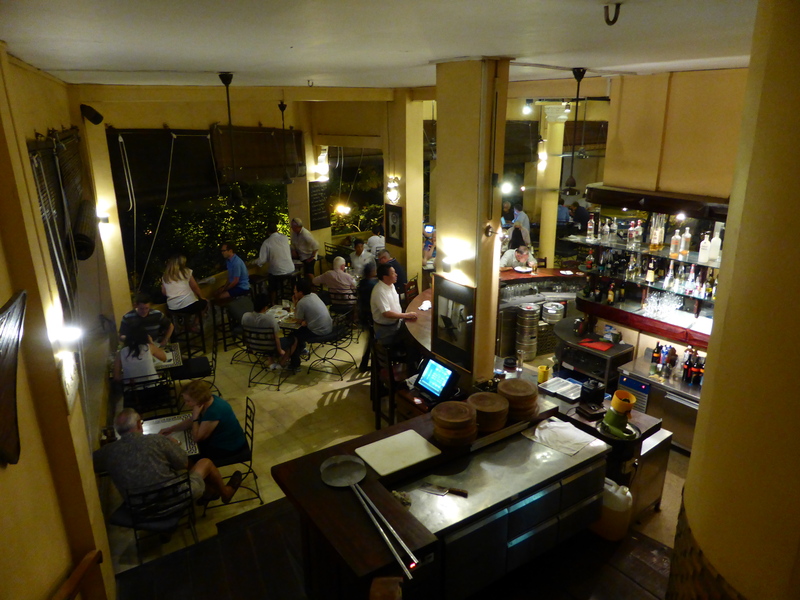 The last supper is Pad Thai alongside numerous Pina Coladas and Angkor beers. 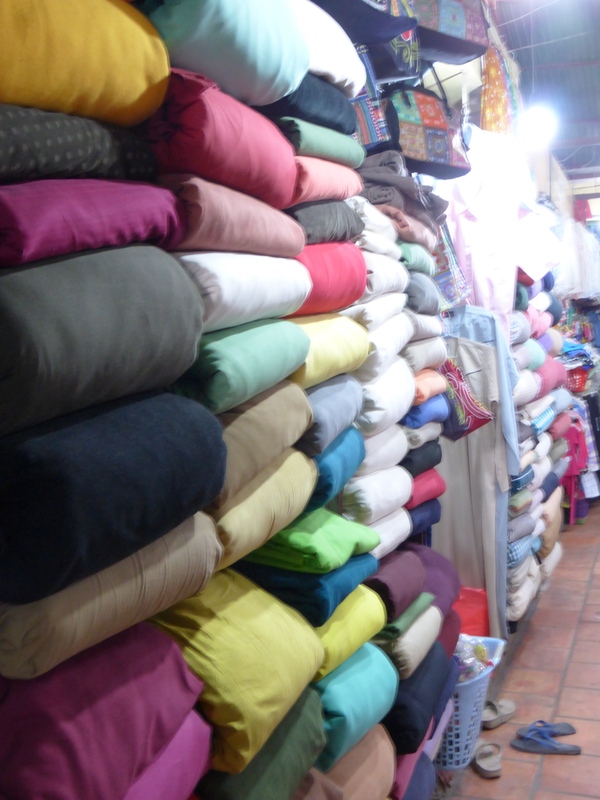 The next morning, we trip out to Psar Thmei (the central market) to pick up some gifts to take home. 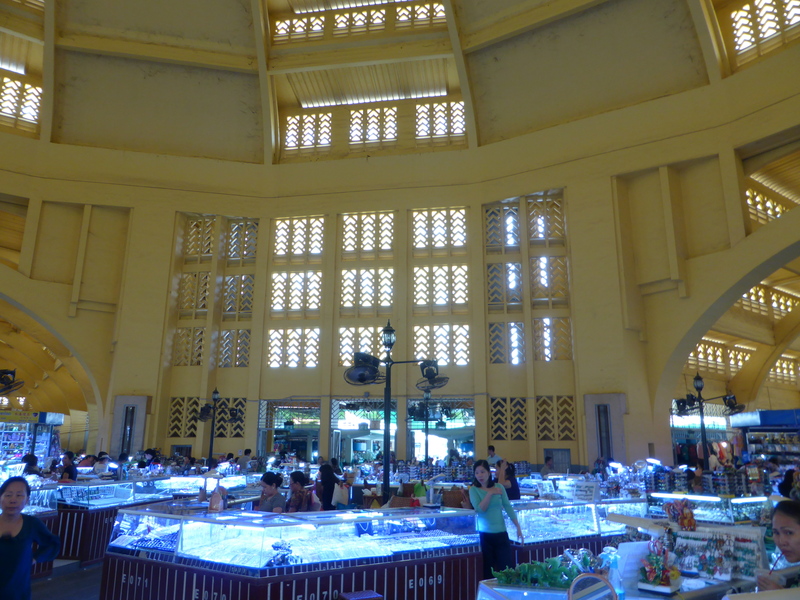 It is much more glamourous than the Russian market, housed in an actual hall with art deco arches stretched above. 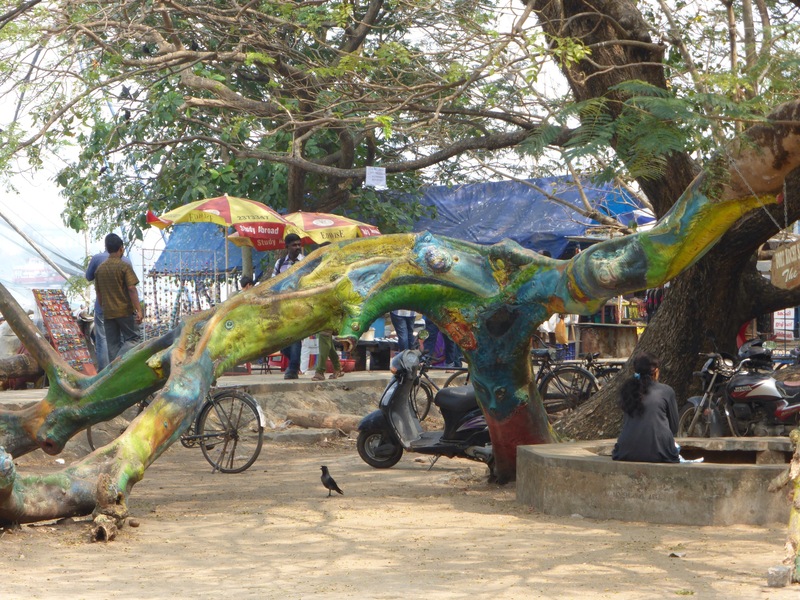 The art of the oversell is not lost here, and it is a fittingly frenetic final experience for my time in Cambodia. 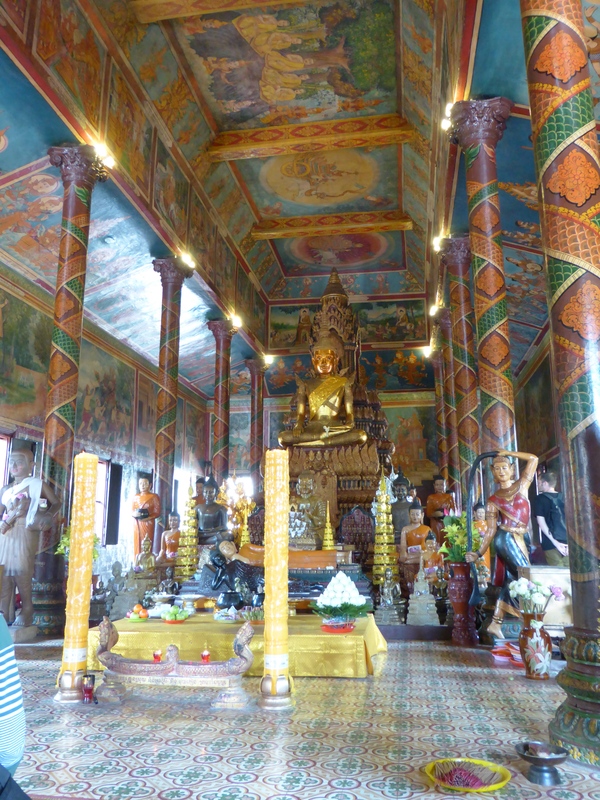 To balance things out, we head out to the local Wat and are blessed by Buddhist monks. 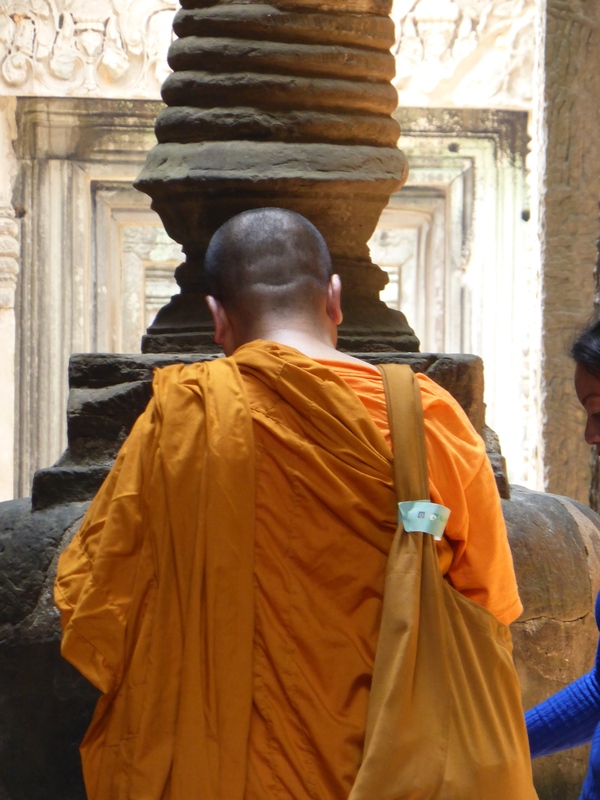 We are ceremoniously soaked by litres of water thrown over us as the monk chants his blessing. It’s a strange sensation, but there is certainly something very peaceful about it. Blessed, and soaked, we tuk tuk back so I can pack for the flight home to London. You might remember that when I embarked on this trip, it was after a fairly grim few months. South East Asia has helped me draw a line under that, with aplomb. My tuk tuk ride to the airport is insanity personified, and with joy in my heart and tears in my eyes, I wouldn’t have it any other way. To say that I have been putting off writing this post would be an understatement. I have been willing it away. 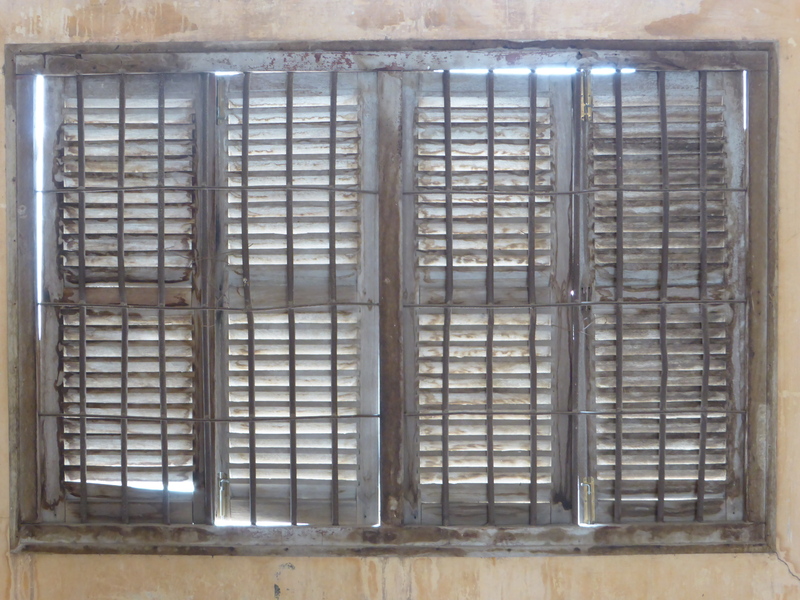 Like millions of visitors to Phnom Penh, I have struggled with the things I saw when learning more about the regime of the Khmer Rouge…things that can never be unseen. To put it into words seems indomitable. 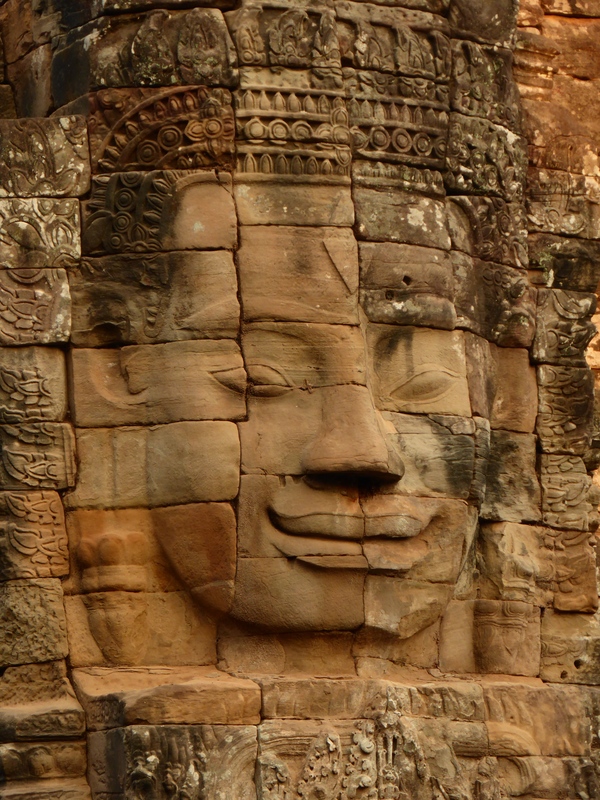 However, it is intrinsic to understanding more about Cambodia and, more importantly, the Cambodian people who have shown more resilience, industry and positivity than many nations would in the wake of such atrocities. For them, I am going to give it a try. 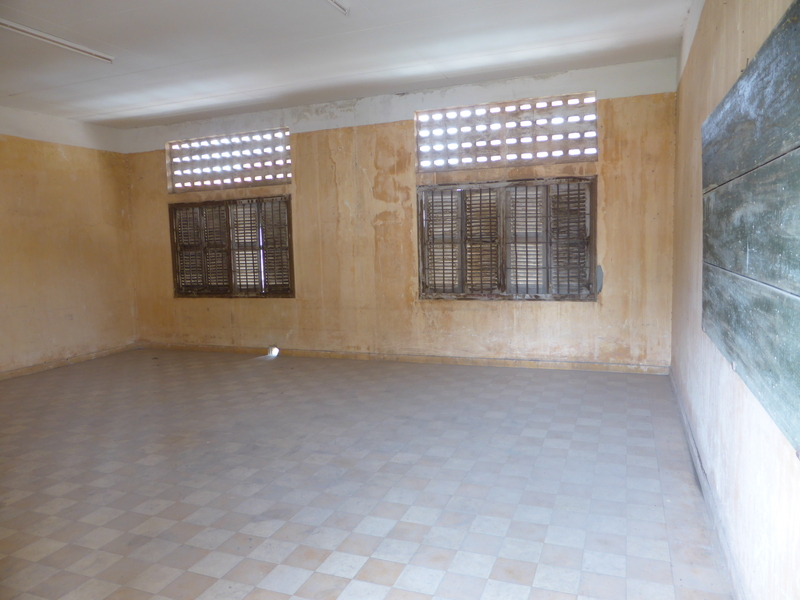 The first stop on this journey is Tuol Sleng. 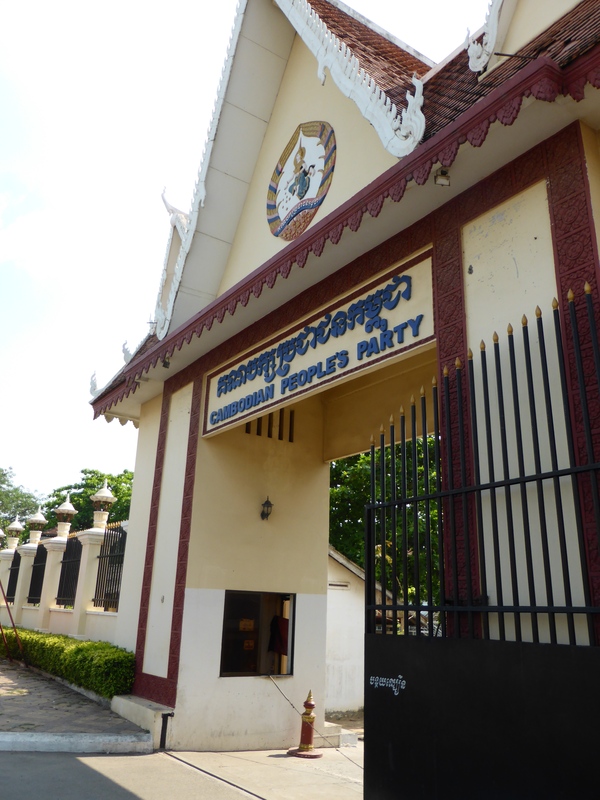 Formerly a school, it was taken over by the Khmer Rouge from 1975 to 1979 under Pol Pot’s ruling and was turned into S-21, the notorious secret prison (one of 196) through whose gates more than 20,000 people passed to their deaths. 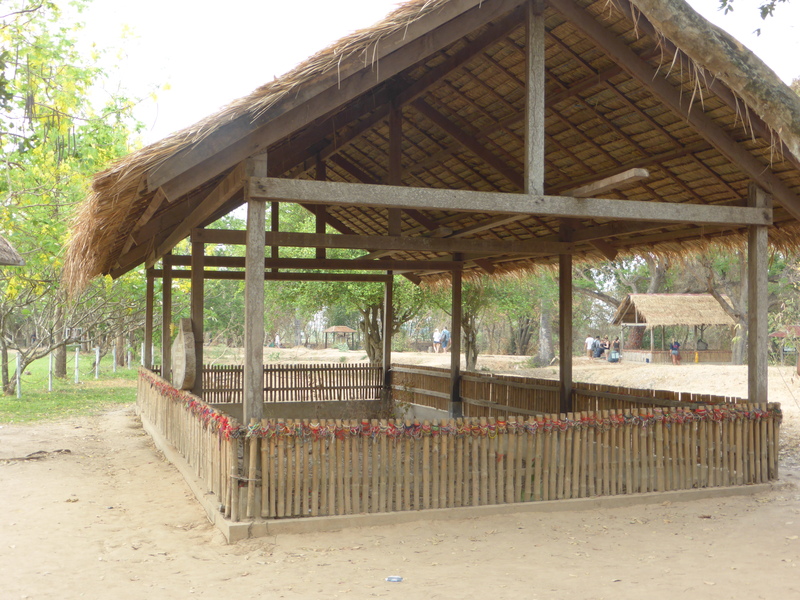 Now it is a Genocide Museum. 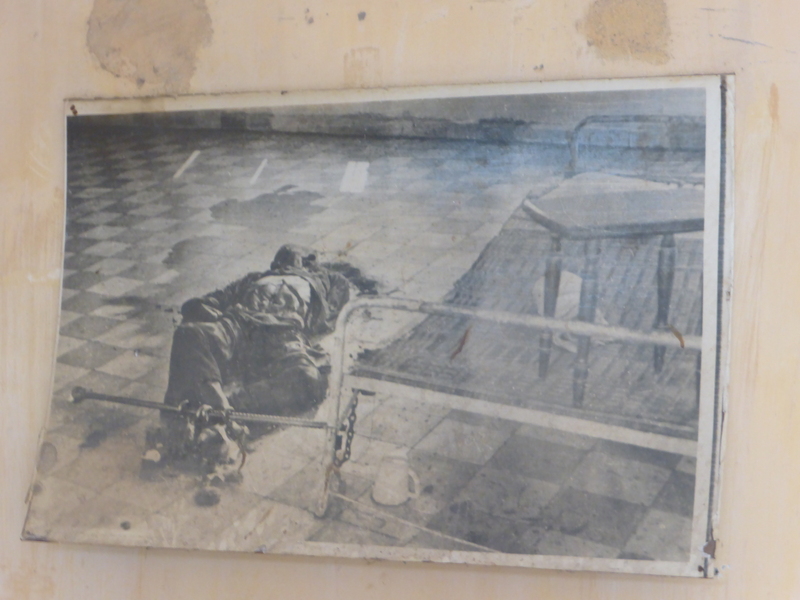 When the Khmer Rouge took power of Phnom Penh, something the Cambodian people were initially happy about after a drawn out war with Vietnam, Pol Pot began to target the educated and elite; teachers, doctors, military personnel etc. Basically anyone intelligent enough to question his way of ruling…and glasses wearers. Many were accused of largely fictitious acts of treason or fraternising with other governments. Typically, entire families of the accused would be taken and people wouldn’t know what charges were being levied against them. 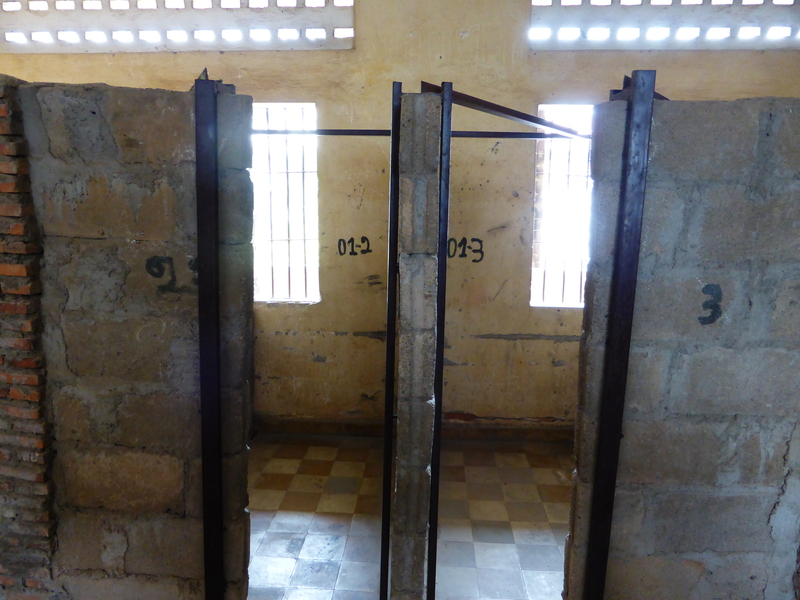 They were brought here for interrogation and torture in a bid to extract a confession. 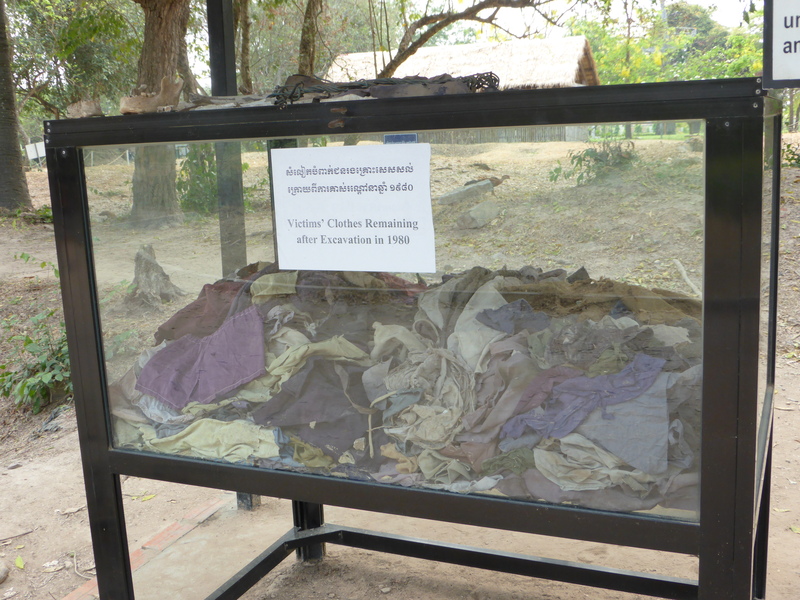 If they didn’t die accidentally during this process, they were marched out to Choeung Ek (aka the killing fields) to be killed and flung in mass graves. We knew this would be a difficult day, but there are times when I was actually gasping for breath with the weight of it all. If it already sounds too much for you, you shouldn’t read on. Gruesome does not begin to cover it. We’re guided around three of the four main buildings. 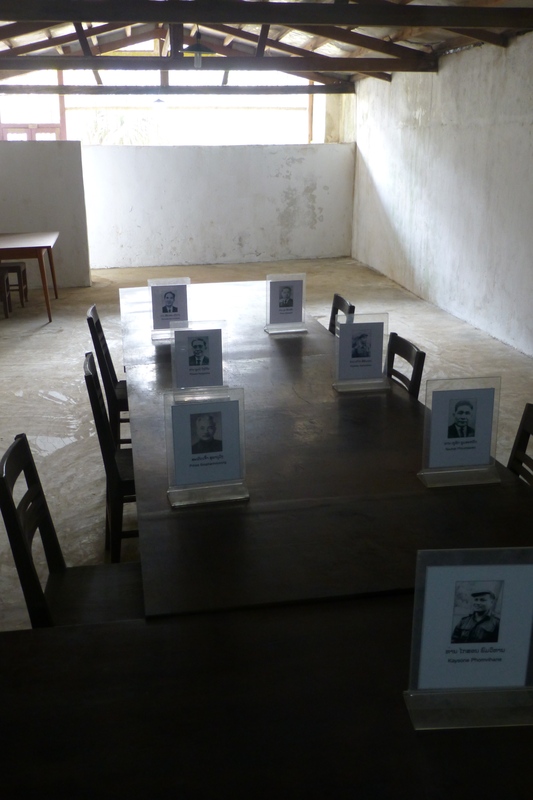 Our tour guide lost her father, brother and sister to the regime. She tells us very calmly and assures us that talking about it regularly and showing S-21 to visitors has helped her come to terms with it. But it brings tears to my eyes immediately. 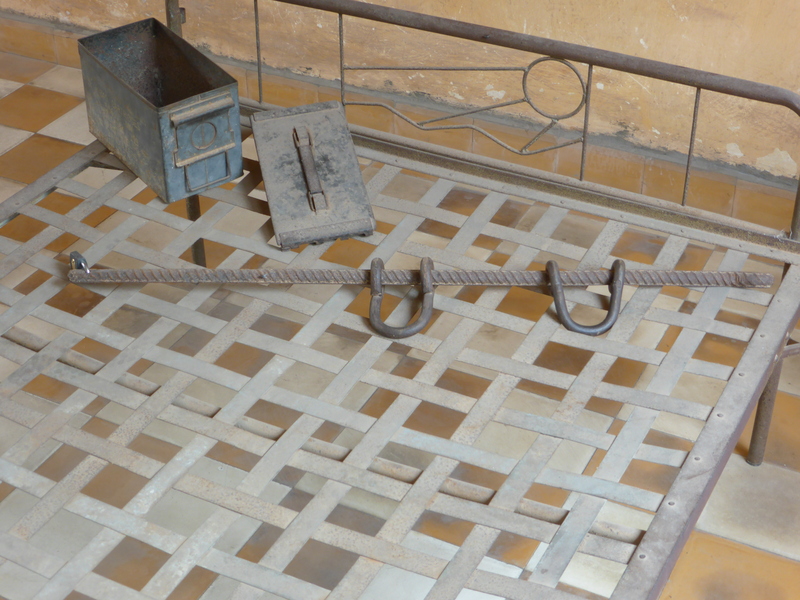 We first walk through the rooms with original beds and torture implements left just as they had been found. 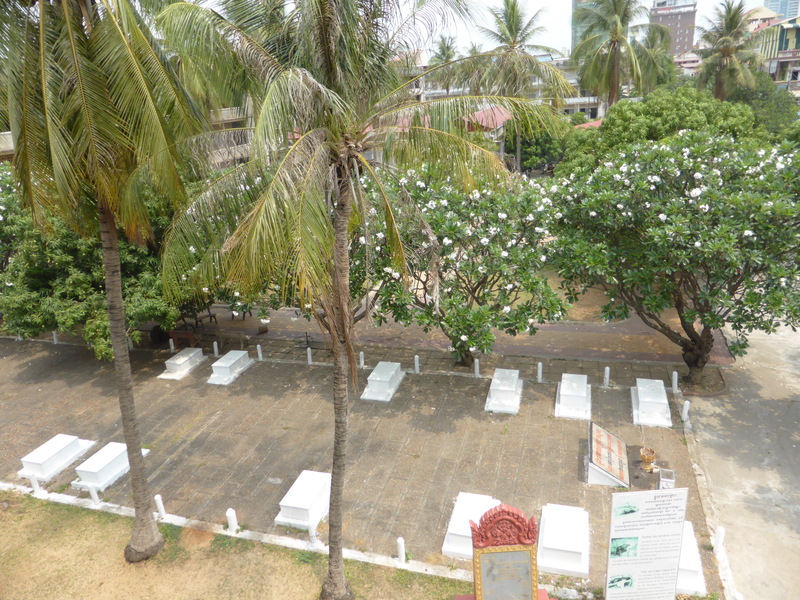 Victims found by the Vietnamese army in January 1979 are buried in unmarked graves in the courtyard. 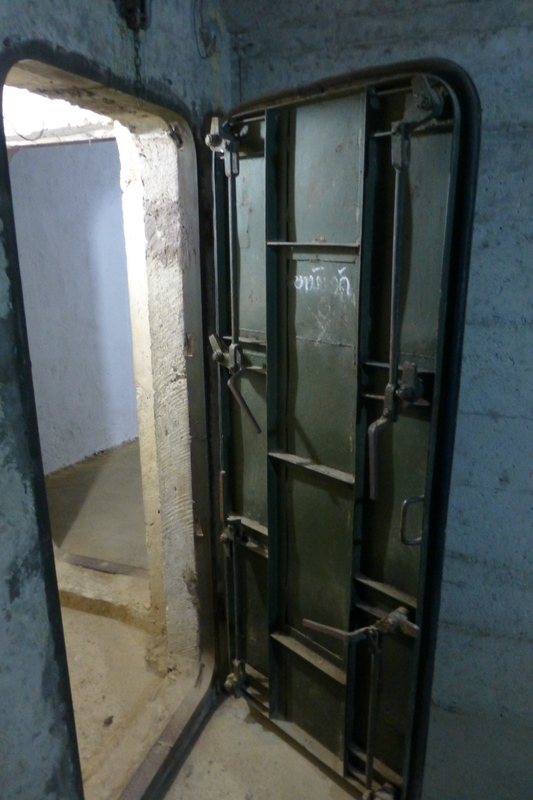 Some of the rooms are divided into 3ft by 5ft spaces that two people would share shackled together. Those considered VIPs, such as military personnel, would have their own rooms. Same conditions and torture, just more space in which to enjoy it. 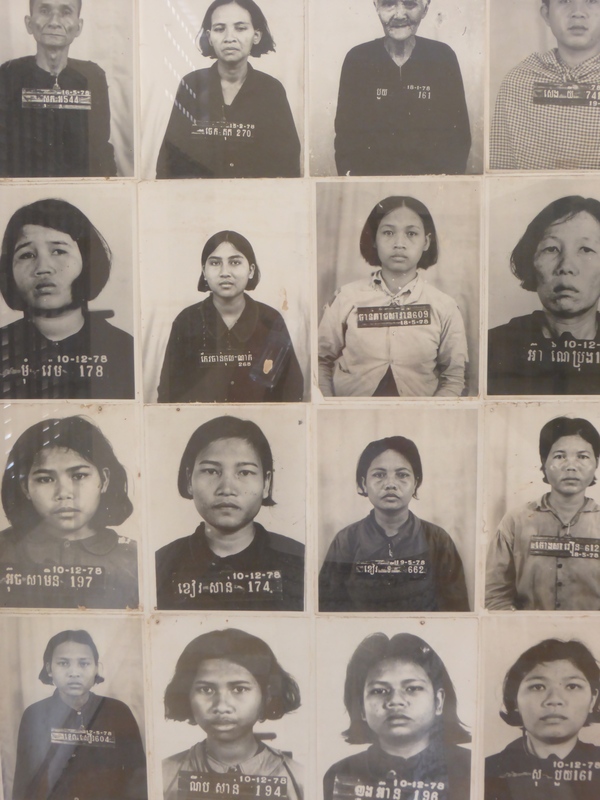 In the next sombre block, there is an exhibition where hundreds of black and white photos, of victims and perpetrators, stare hauntingly back at you. On of only seven survivors is there, and I find his presence mesmerising. 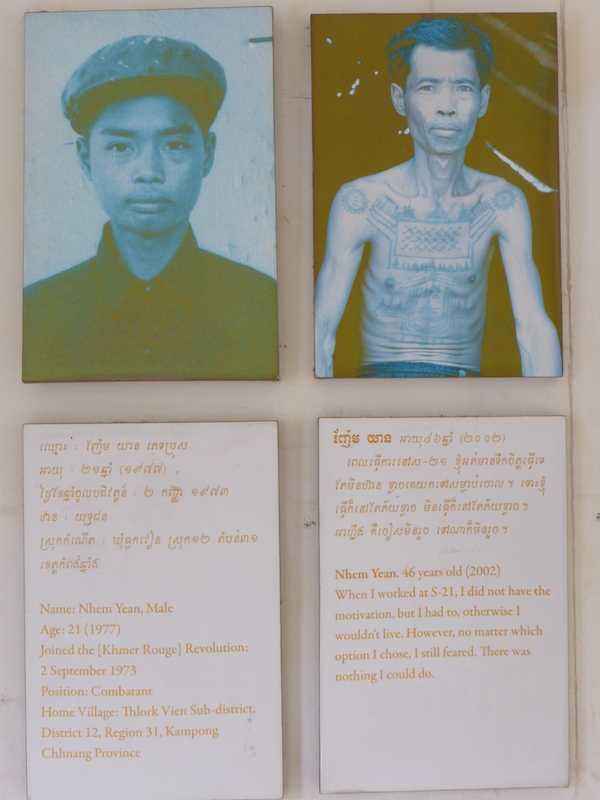 He managed to make himself useful to the Khmer Rouge leaders by painting portraits of them. This appealed to their vanity, and spared his life. We’re offered a photo with him when we purchase a copy of his memoirs. Somehow I can’t see a place for it amongst these images. Torture devices are all around. 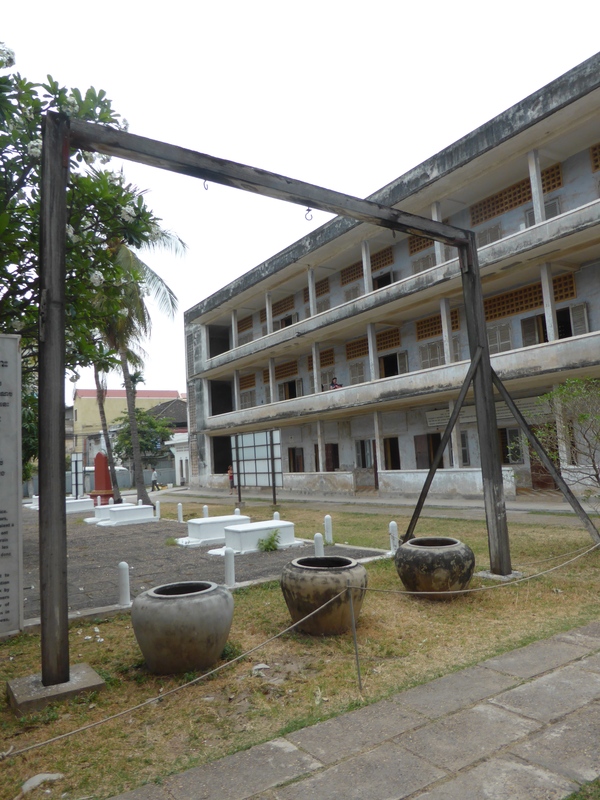 The gallows in the main square were built for the school’s students to take exercise but were adapted by the Khmer Rouge. 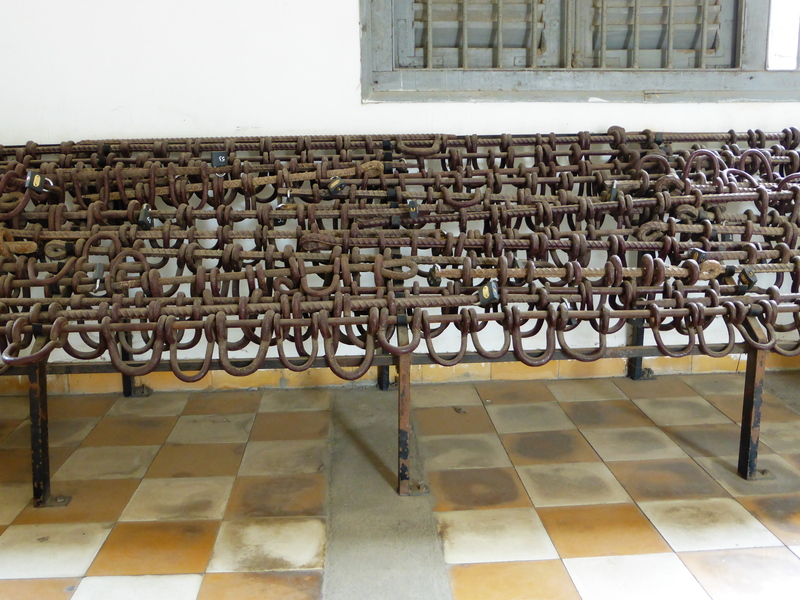 They would tie the prisoners hands and hang them upside down until they lost consciousness, then dip their heads into filthy water which would bring them back into consciousness allowing the generals to continue their interrogations. 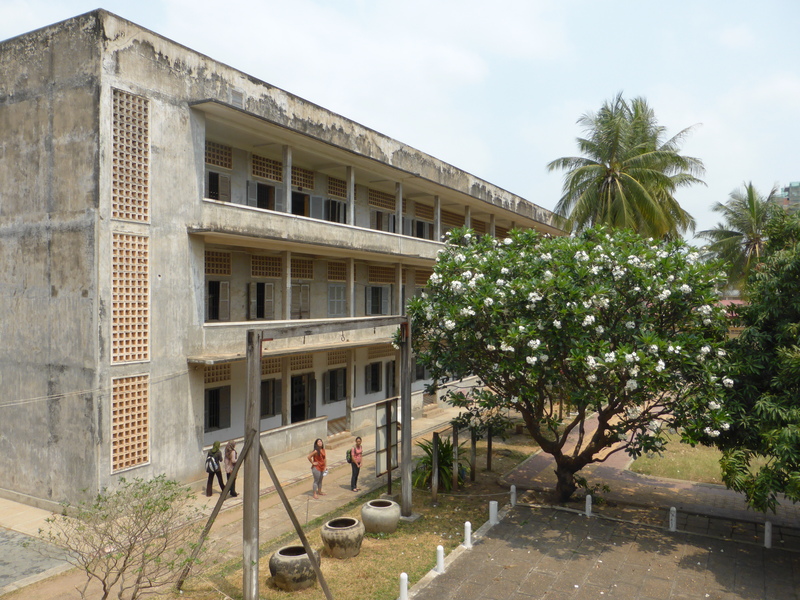 The final building holds an exhibition of eight Khmer Rouge combatants, and their stories of how they felt forced into the killings. 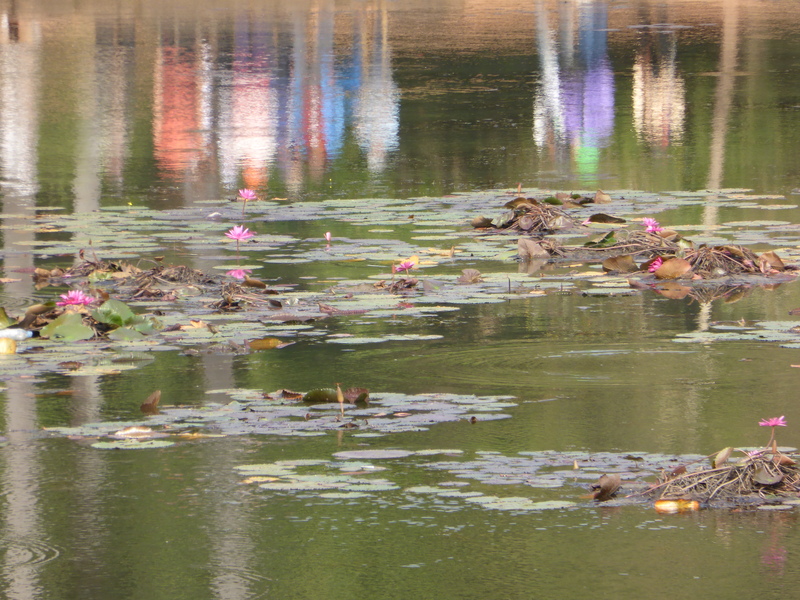 We take some time to reflect. 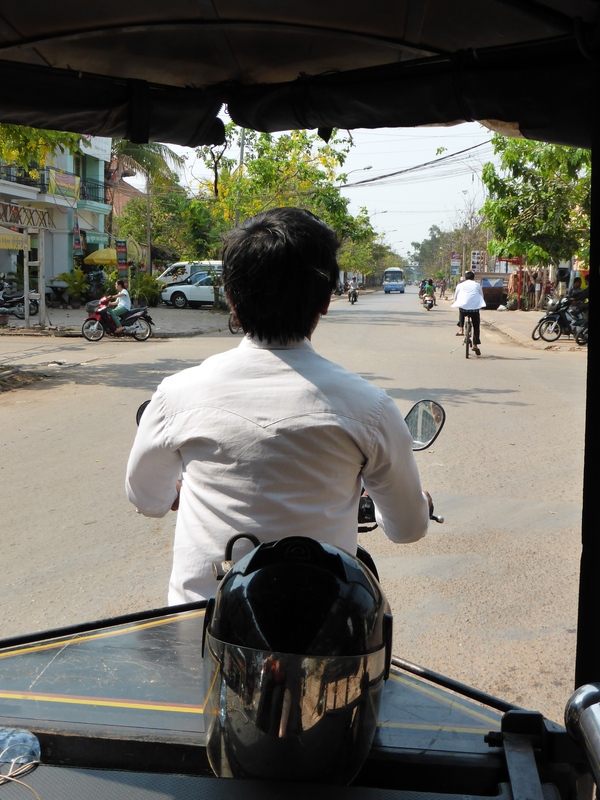 Then it’s time for us to make the journey that hundreds of thousands of Cambodian prisoners did on the way to their deaths, we tuk tuk out to Choeung Ek. It’s a long old dusty road, and a sad trip. When we arrive, we’re given our headphones and we pass silently through the grounds, witnessing horrendousness after horrendousness. 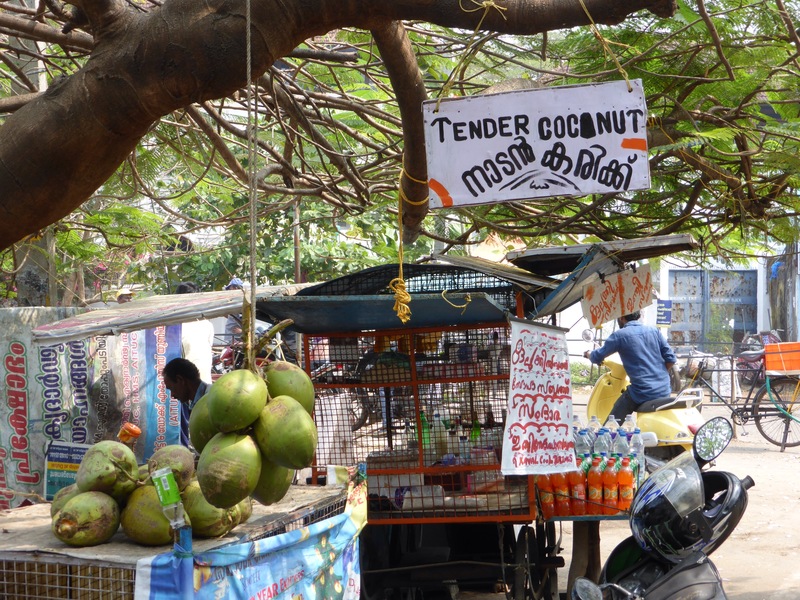 From the point where the trucks would stop to deliver prisoners, to the serrated sugar palm they would used as a weapon of torture, to a series of mass graves. The uneven earth undulates before us, and we’re warned that the horrific crimes present themselves in the ground below. When we look down, garments of clothing, bones and teeth are in the process of rising to the surface. It’s an unstoppable sadness brought on by nature’s rainfall and erosion. Only some of the graves have been excavated, there are likely hundreds of thousands of bodies still to be found over time. 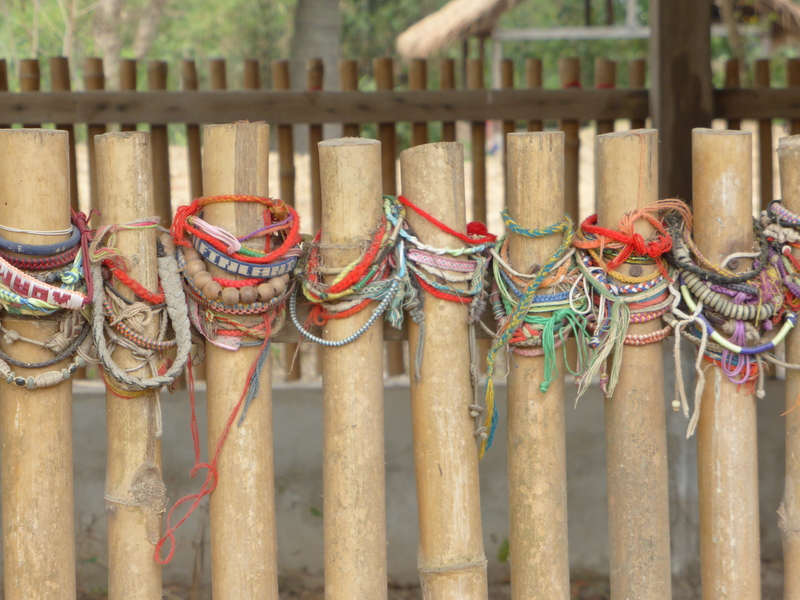 Each is surrounded in friendship bracelets left by travellers wishing to pay their respects. 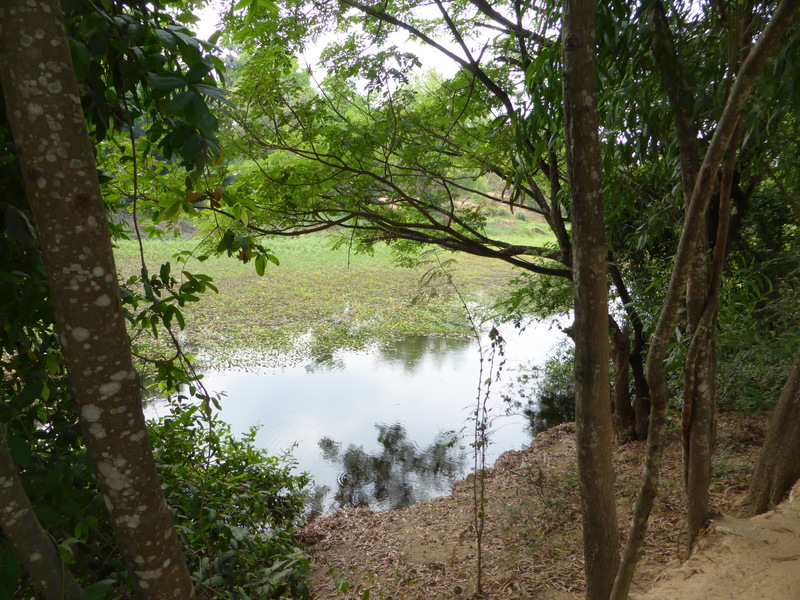 We’re manoeuvred to the side of a nearby lake where we’re encouraged to sit or walk alongside it and reflect on the atrocities. A piece of music has been commissioned to help us do this. ‘A Memory From Darkness’ by Him Sophy. It is a most unexpected and welcome interlude, an opportunity to allow the emotions to flow over you. 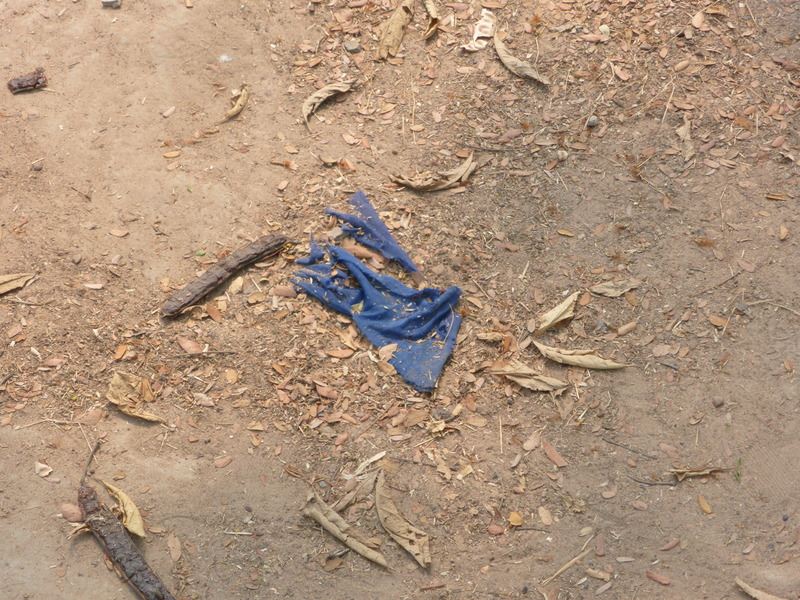 From here we pass collections of clothes most recently found by the groundsman. But the worst is still to come. 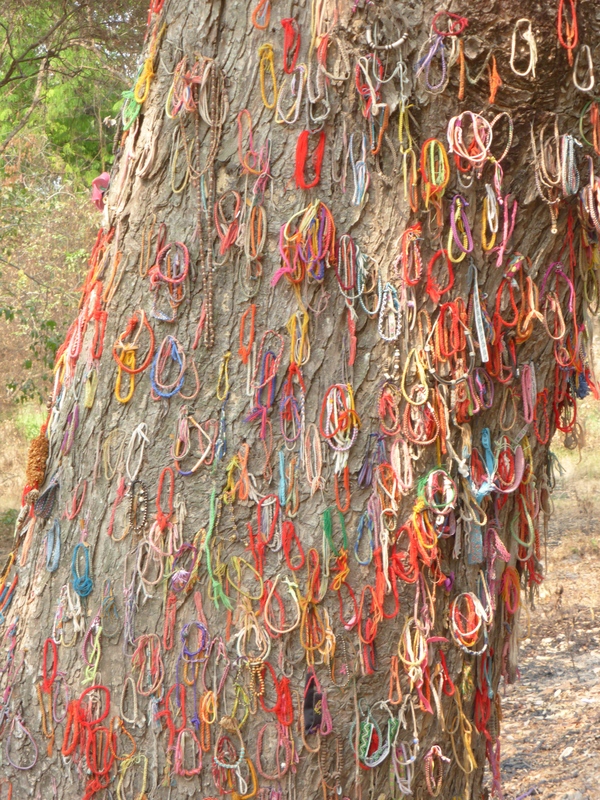 One of the final excavated mass graves is ahead of us, and next to it a large oak tree covered in friendship bracelets just as the grave walls before it. This is where babies and children were killed. They would either be thrown into the air and shot with a pistol or smashed against the tree. It is the most horrific thing I have ever known or seen, and it breaks me. There, by the tree, my spirit collapses. I can never un-know what I now know, and I’m different. Its as simple as that. I sit and weep. 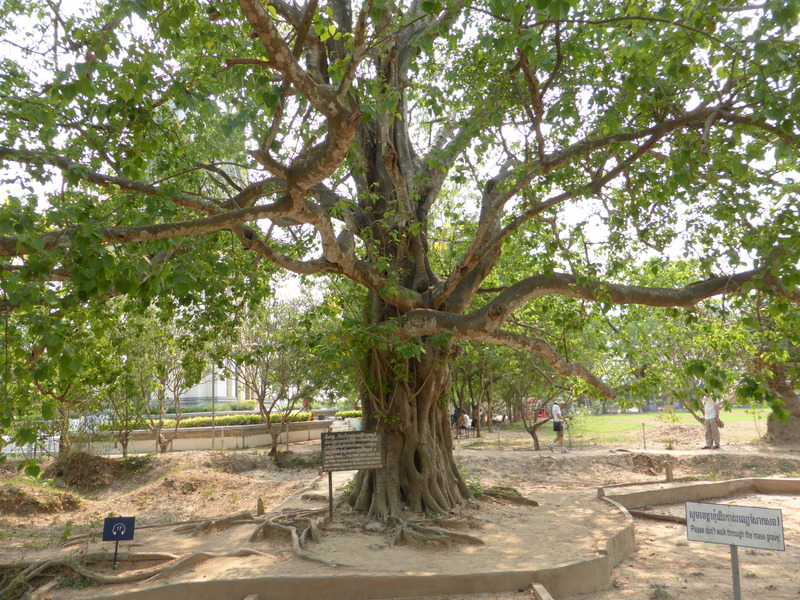 Towards the end, a sprawling tree serves as the spot where speakers were hung to play regime-friendly music drowning out the screams of the victims. 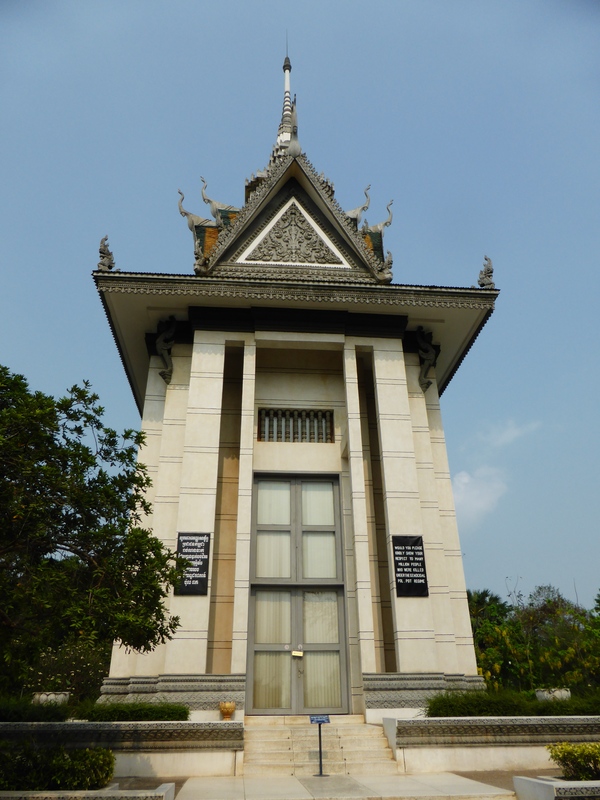 The final stop is the majestic and graceful Choeung Ek Memorial built to commemorate every life lost during this harrowing era in Cambodia’s history. 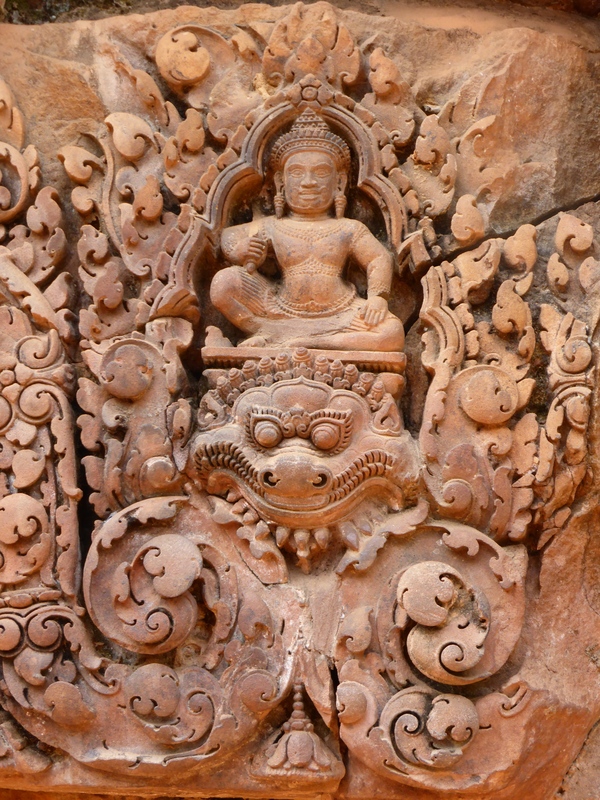 The design incorporates garuda birds, like those ridden by Vishnu in Hindu and Buddhist mythology, alongside magical naga serpents said to have fathered the Khmer people. Together, they are a symbol for peace. 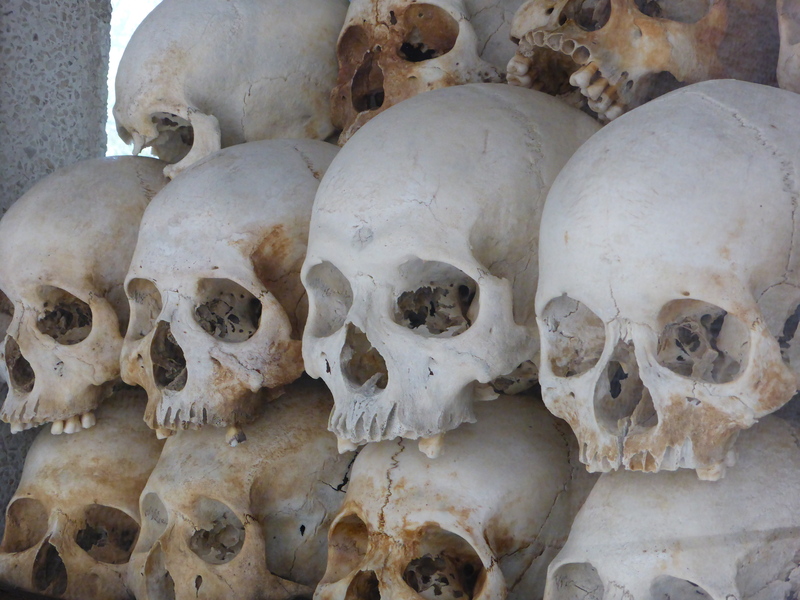 Categorised skulls are piled high within it. I lay flowers at the door. But we’re so saturated with grief, it is absolutely time to go. On our journey back to town, the beautiful Khmer children give us unwitting comfort with their cries of ‘Hello’ from the roadside. We’re stunned. And we’ll never be the same again. Think of the saddest song that you’ve ever heard, and listen to that. 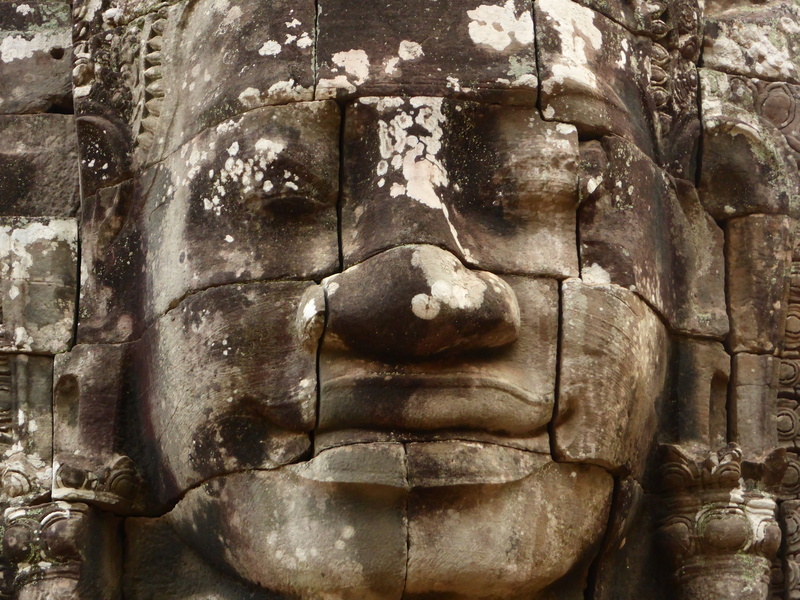 Time for another ambitious travel day as we make our merry way from Siem Reap to the arms of the sea. 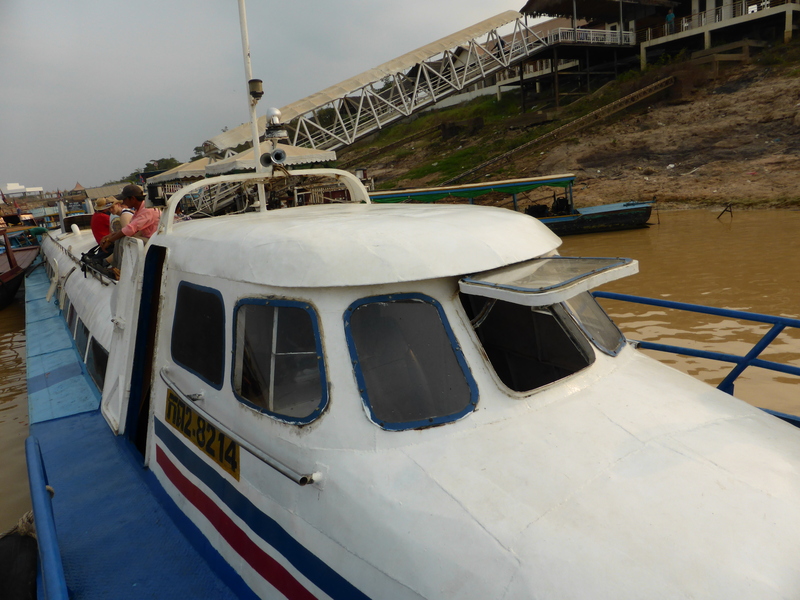 We start with a dart down the Tonle Sap river on this submarine-esque boat for around seven hours. 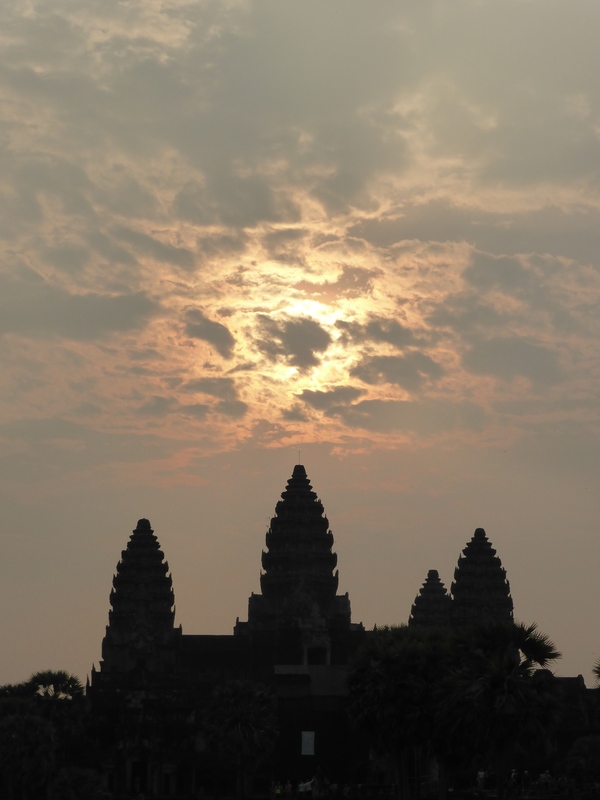 As is usually the case in Cambodia, the advertised travel time is actually doubled. The boat’s captain even stops for a quick dip mid way. Still, I’ve always been about the journey rather than the destination, so long as there is music (sweet music), a decent read and some time to put your mind into neutral and take stock. 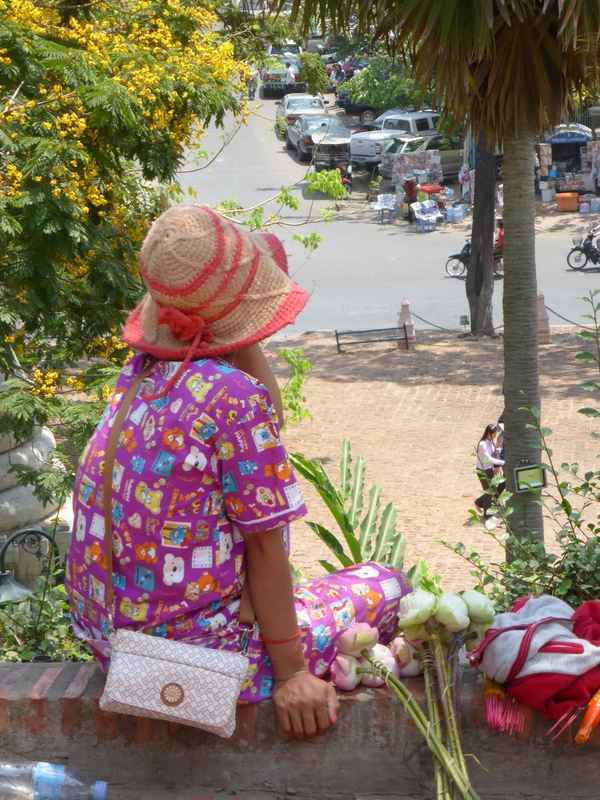 The riverside views and Cambodian life whizz by. 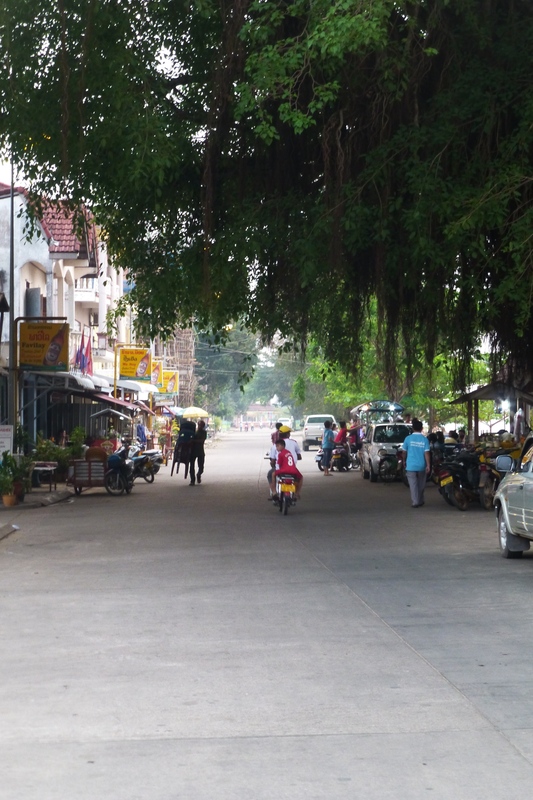 We arrive at the capital Phnom Penh and tuk tuk to the bus station for the next connection to Sihanoukville. We are punished at this point for not looking at the map beforehand, and we’re immediately charged $5 by an industrious tuk tuk driver who then proceeds to drive us approximately 20 steps. Six hours and one stop later (good luck to those who are weak of bladder travelling in Cambodia) we pull into Sihanoukville bus station for the mandatory haggle with the gaggle of tuk tuk drivers. The entertaining (and devilishly handsome) German (hi Lasse) I met back in Si Phan Don urged me to ditch the town centre in favour of nearby Otres Beach which is 6km east. Backpackers trade on recommendations like this, yearning as they do for turn offs from the well beaten track. In fact, the next few days will be spent in places that weren’t on my original itinerary. It’s late and the tuk tuk drivers are trying to extrapolate $40 from us for 6km, which is pretty much on a par with London black cab prices. 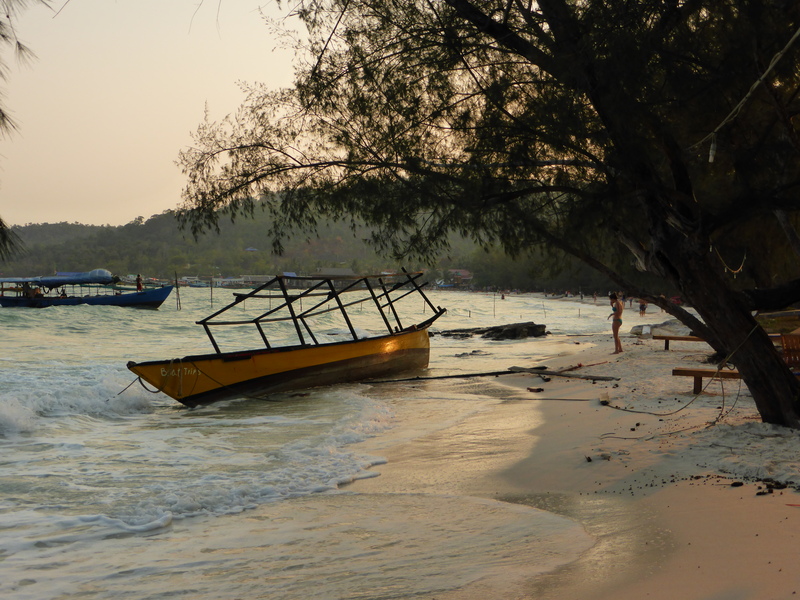 Negotiating skills need to be at their sharpest in Cambodia, but at midnight after 16 hours on the road, we settle on a generous $10 and scoot off to Otres Beach where we’re booked into hostel Don’t Tell Mama. 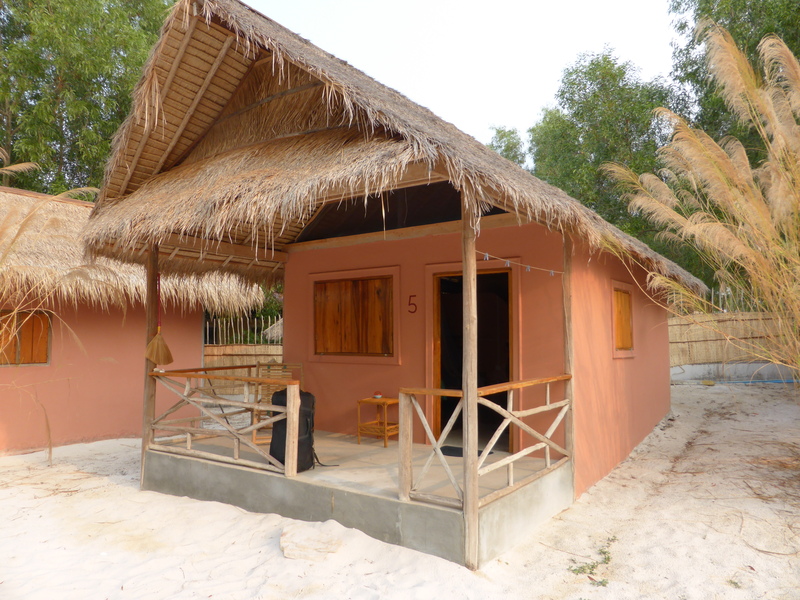 After a brilliant night’s sleep, we wake to the beauty of our little beachside bungalow complete with en suite bathroom and mosquito nets. It’s clean, well kitted out with amenities and secure. Perched right on the end of the strip, it’s also peaceful. 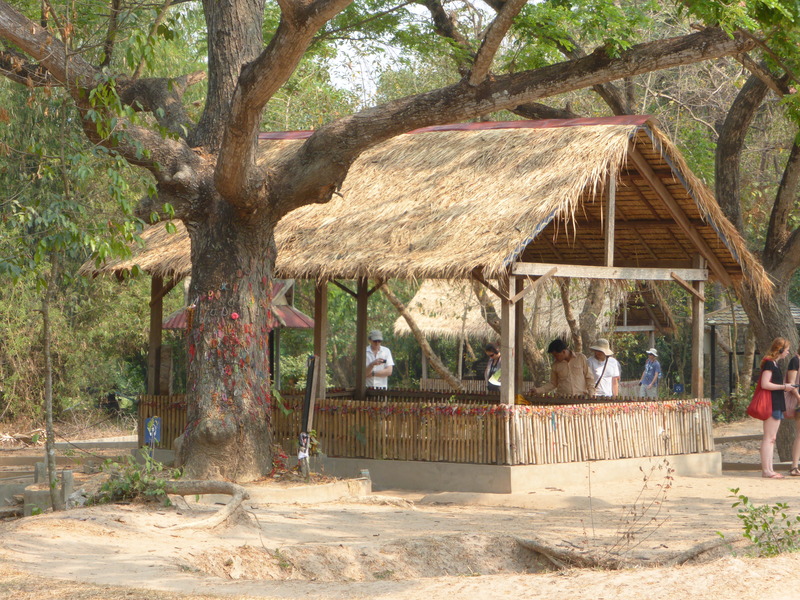 The best (and most talked about) in Otres Beach is Mushroom Point with its unique round bungalows with thatched roofs shaped like little fungi. You’ll need to book early to get in there though, so it’s not an option for the more spontaneous traveller. 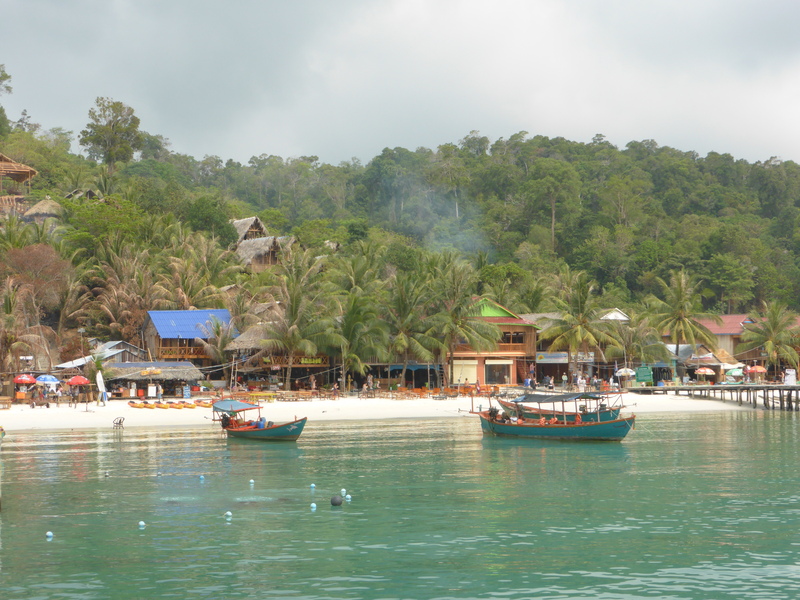 Otres is a fishing village set on a simple strip of coastline which can’t be more than quarter of a mile. 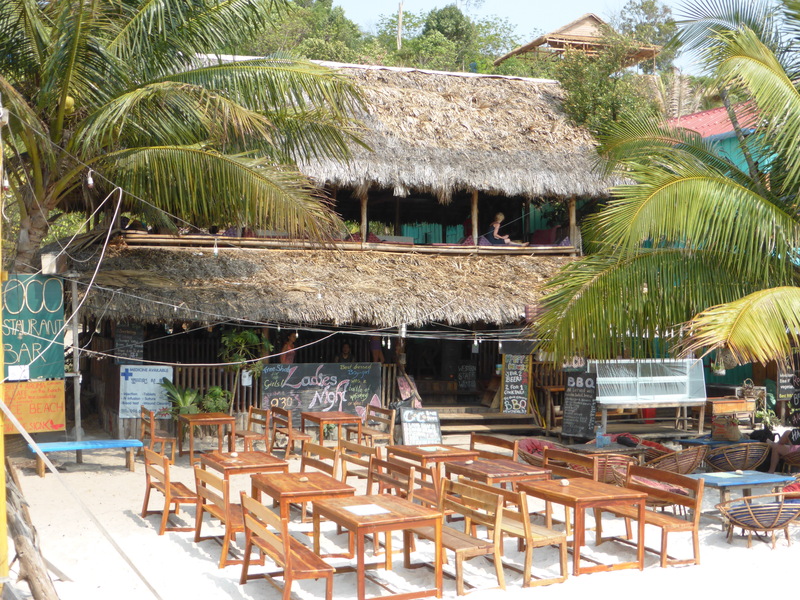 Both sides of the red sand road are lined with hostels, bungalows, tour operators and quirky bars and restaurants. 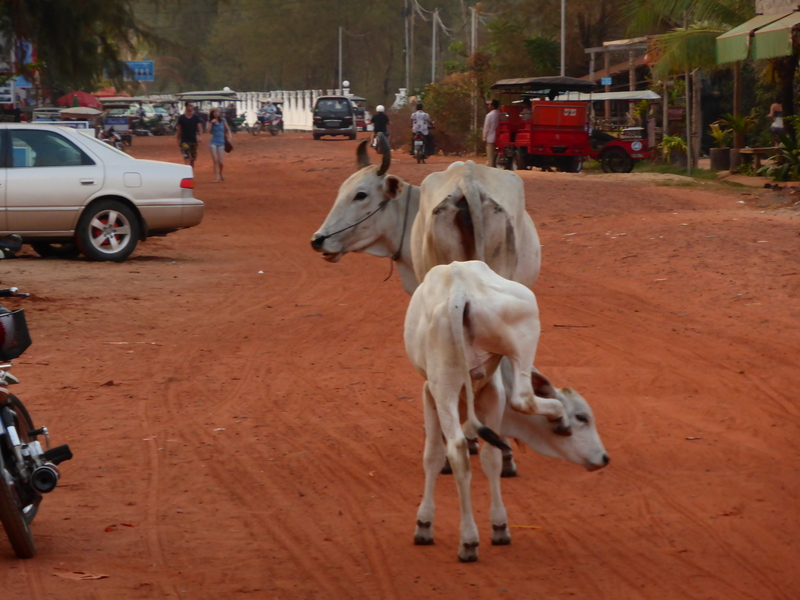 Tuk tuks ply the route swerving to avoid potholes and other ‘pedestrians’ like those below. 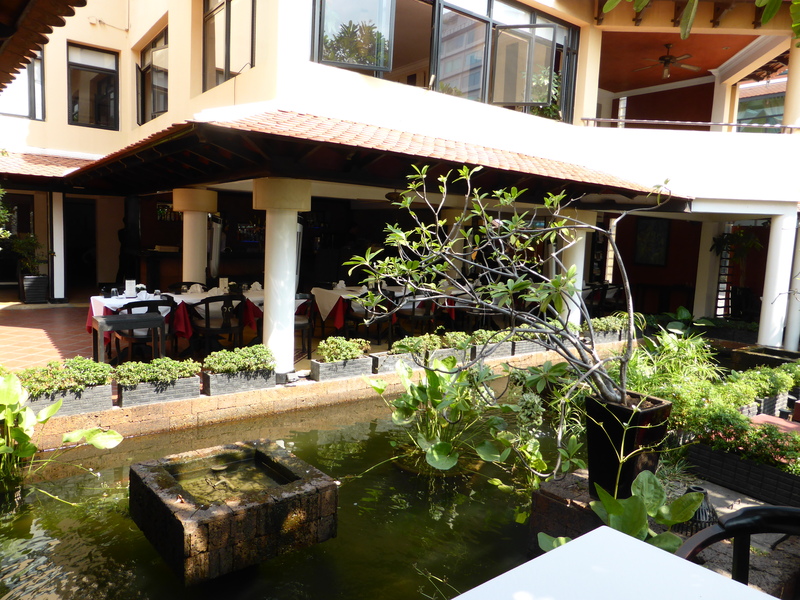 It is a great place to relax and enjoy Cambodian cuisine. 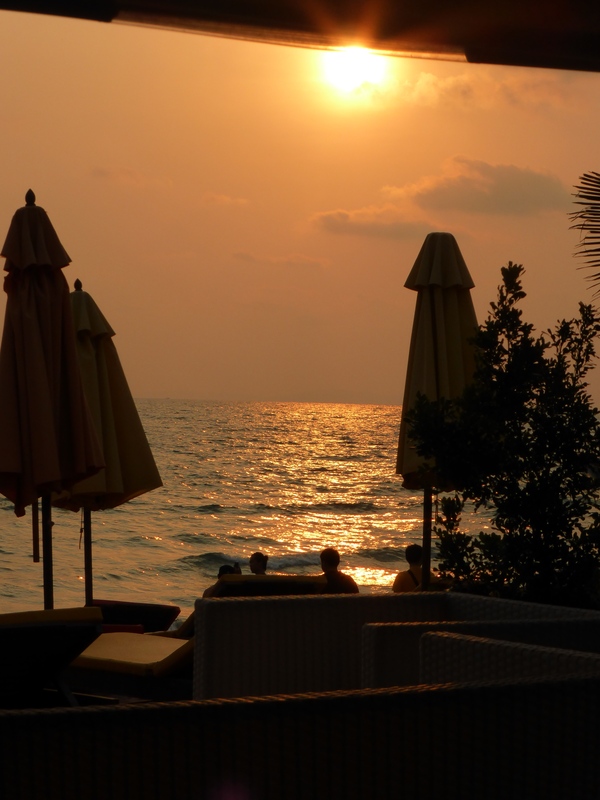 One of our favourite places to eat is the chic outdoor diner, Dune. Here, I enjoy my first taste of Fish Amok which is a native spiced curry with chilli, garlic, turmeric, galangal, lemongrass, and lime zest. 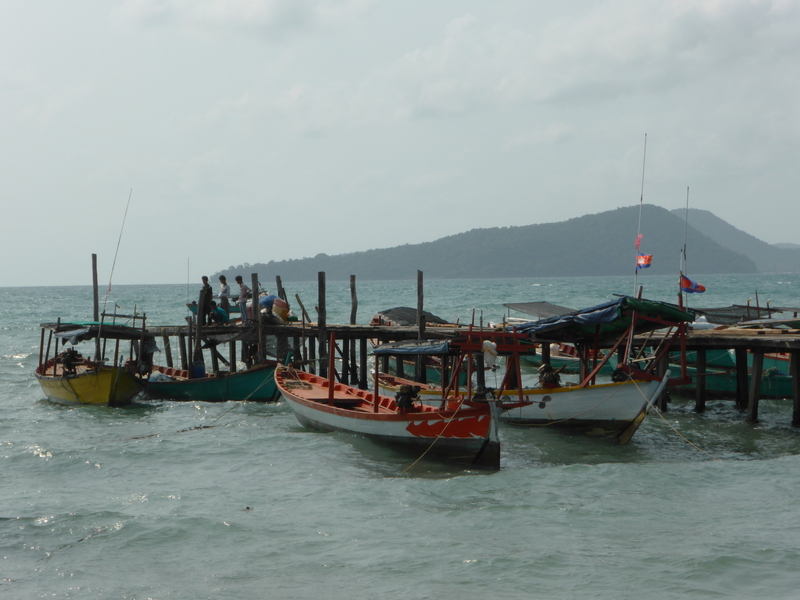 The view out to the Gulf of Thailand is cracking. It’s also illegal in the Same Small World travel guidelines to sit beachside without a pina colada in hand. Standard. Here we watch the sun dip down into the sea as the bells on the fishing boats ding gently as they bob on the waves. The territory of the next part of the journey is so unchartered that it’s not even in my guide book! I’m fairly trad when it comes to travelling; ebooks will never replace books, my blog will never place my diary and the travel forums on my iPad will never replace travel guides. 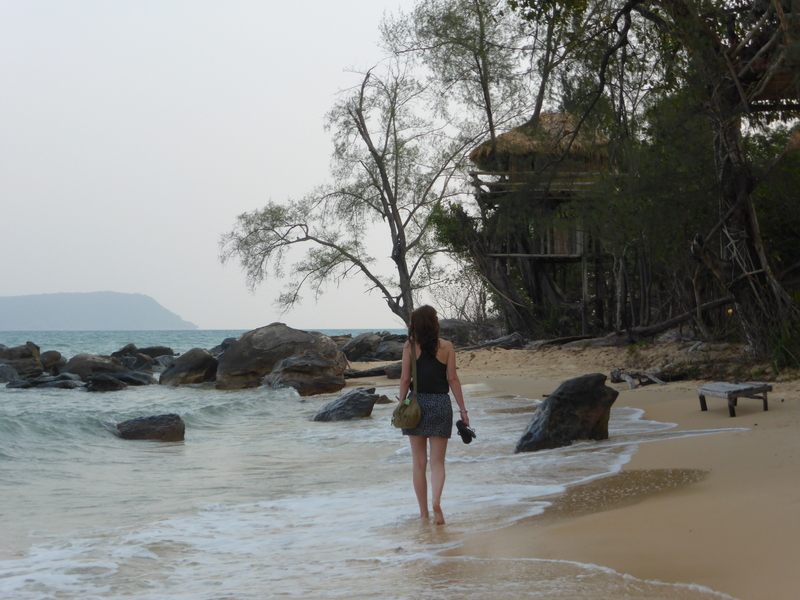 I used to be a Rough Guide sort of a girl, but Lonely Planet won me over during a trip to Thailand nine years ago. 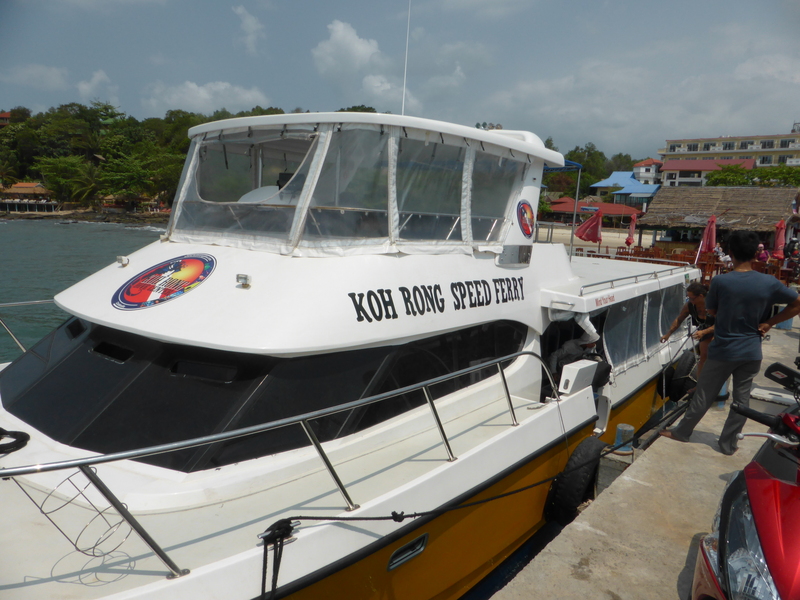 ANYWAYS, the next stop is Koh Rong, the second largest island of Cambodia which is located in Koh Kong Province about 25 kilometers off the Sihanoukville’s coast in the Gulf of Thailand. 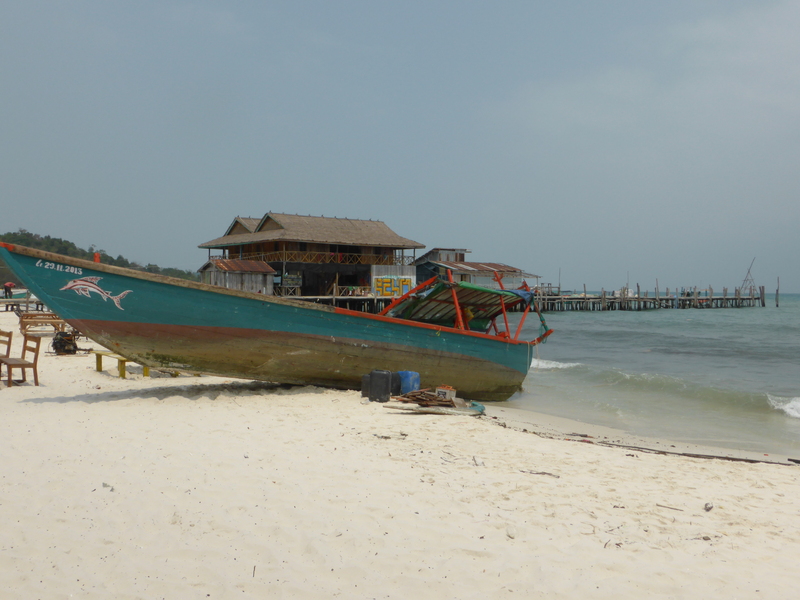 The island has 43 km of beaches, unspoilt jungle, quaint beach bungalows, no roads or traffic and no electricity. 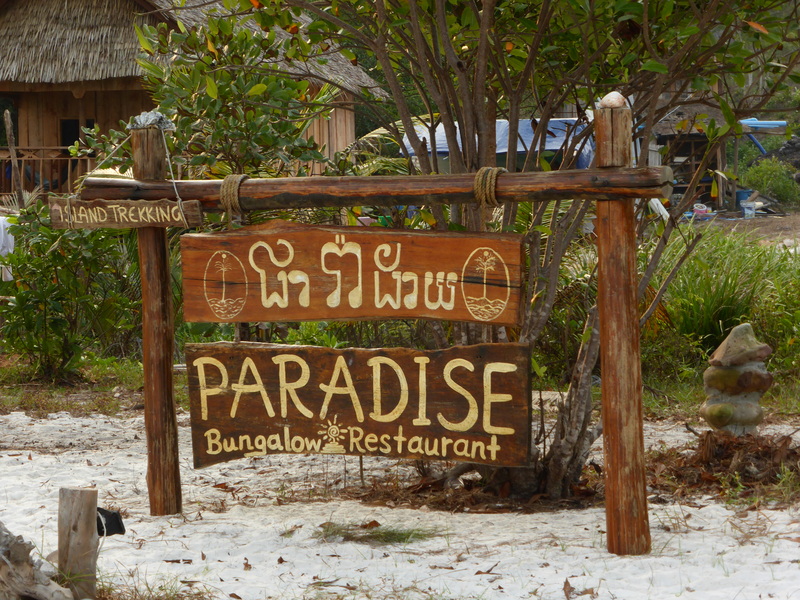 It’s the classic island paradise, very rough round the edges and only for the seasoned traveller. 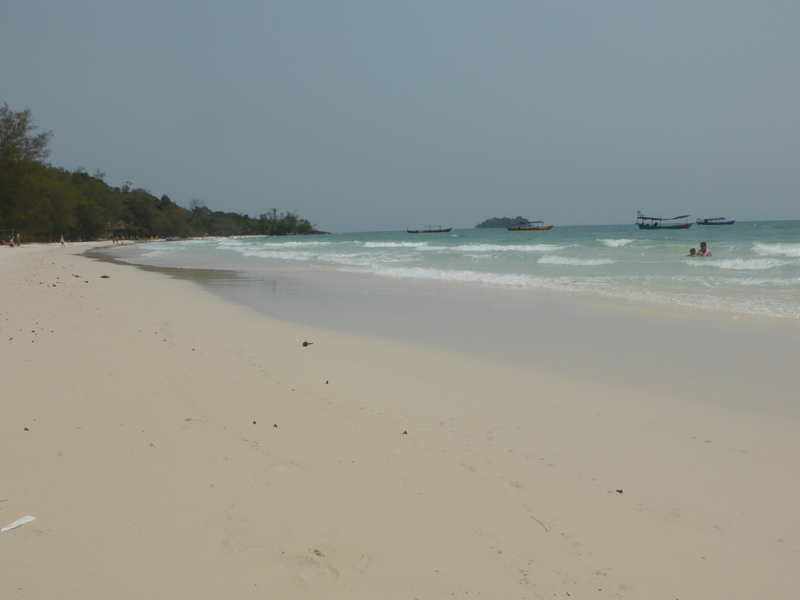 We wash up on the shore after a 45 minute journey from Sihanoukville. And first impressions are everything we’d hoped for. First things first, we’re taken into Coco’s for a briefing. 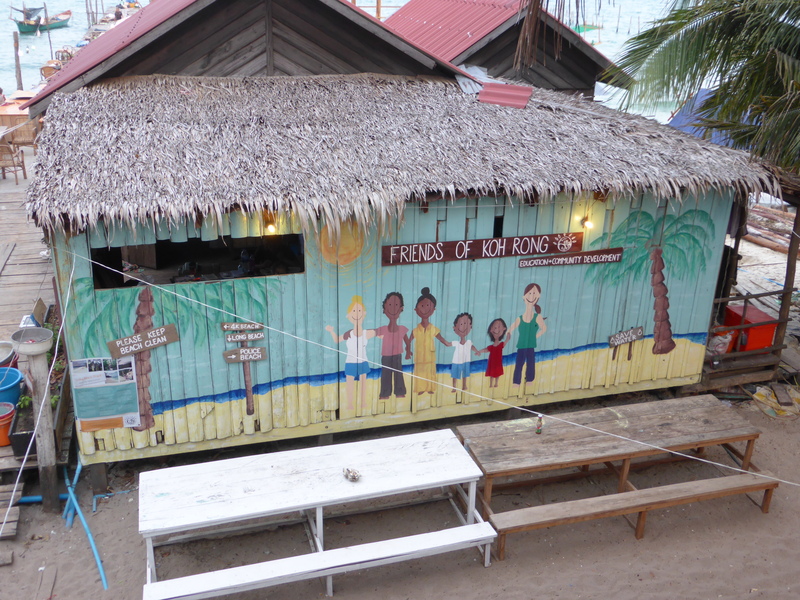 The stark realities of living on an island paradise are outlined to us in no uncertain terms. 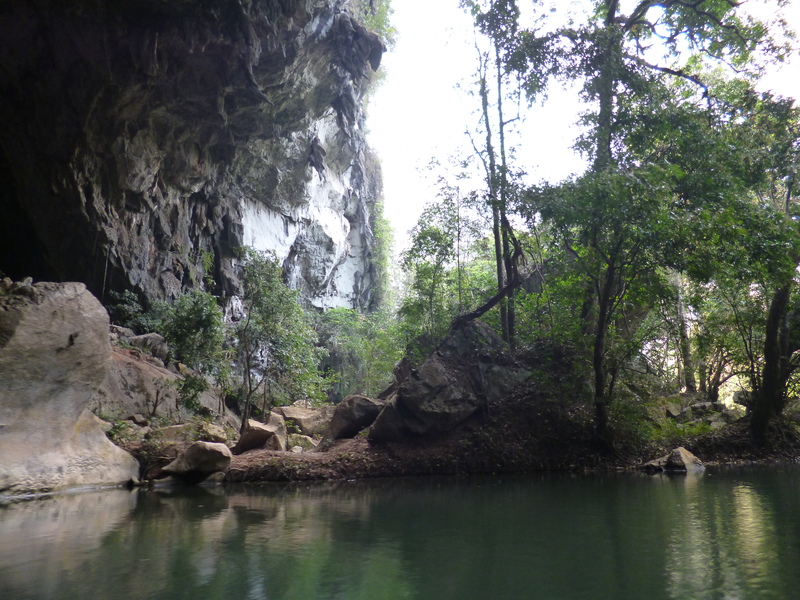 We’re warned against jungle walks due to snakes, told how to outsmart sandfly bites with coconut oil and advised to get comfortable at the sight of rats. 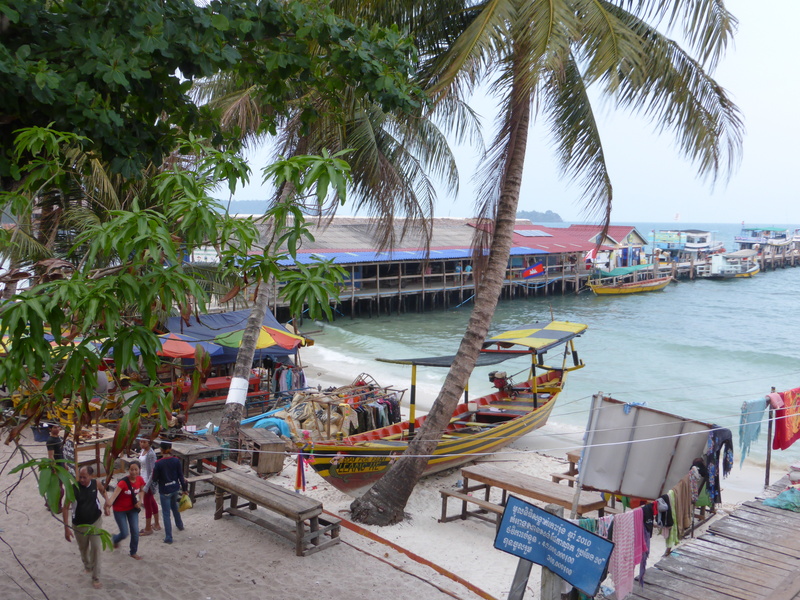 It’s fair to say that for all the attractive lure of its underdevelopment, Koh Rong has sanitation issues that bring their own challenges. We’re remarkably underwhelmed with the accommodation (including a drop loo into the sea…yeah the one we’re due to splash in later.) 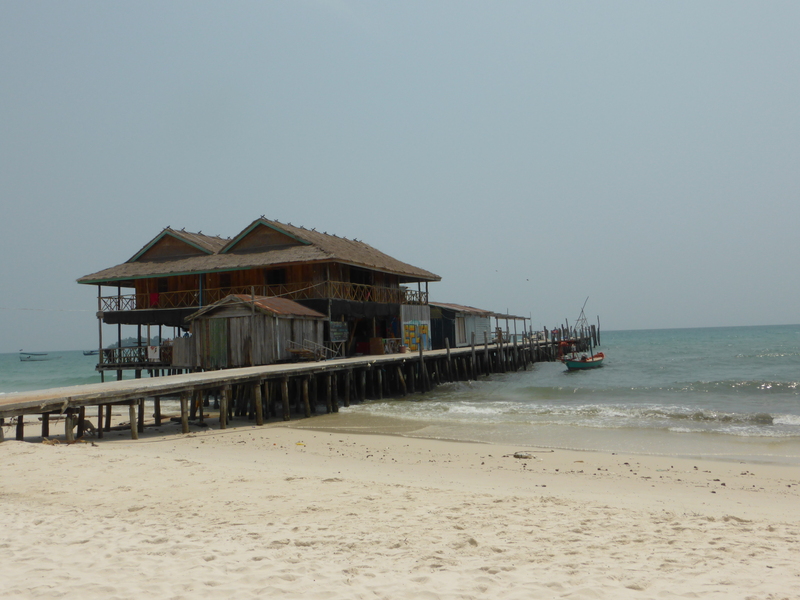 We ditch it and make for the White Rose Guesthouse at the end of the pier. The double rooms are spacious but basic, kitted out with tired looking mosquito nets and fans which run when the generators do. 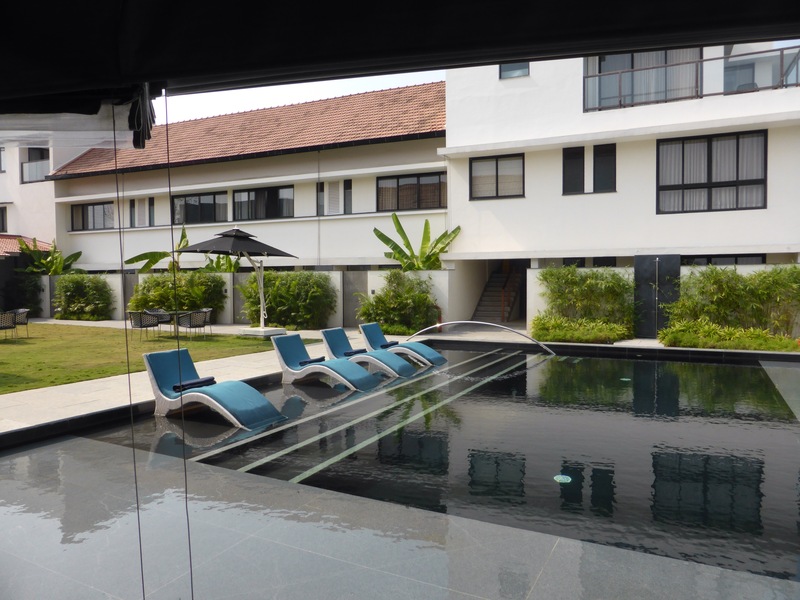 It has a sociable little terrace, a balcony with hammocks to swing in and two shared bathrooms at the end of each hall. Proximity to the pier is a plus point too due to the searing heat. And the view out onto the strip ain’t half bad. 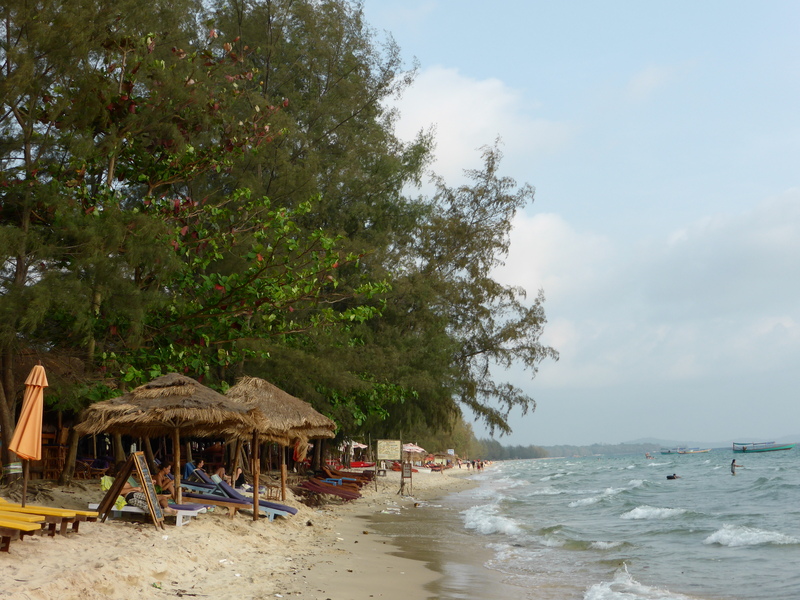 We also realise that the population is about 5% Khmer, 95% tourist; something to be expected for the foreseeable future as word spreads on the backpacker network about this idyllic little spot. My favourite local is this little guy who sports something we’ve seen a lot of in Asia, Premiere League football strips with a twist. On this one, unthinkably for Chelsea fans, the name Hazard is emblazoned on the back but the Manchester United badge sits proudly on the front. 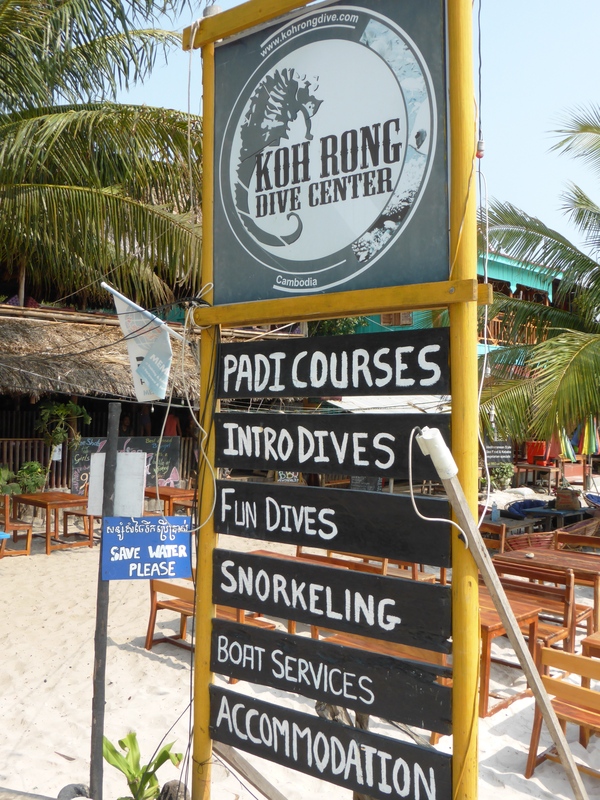 There is much to do here, from scuba diving and snorkelling the coral, boat trips to watch (and swim in) the twinkling plankton by night and fishing hauls to nearby reefs. Of course if you come, as we have, during a period of rough water and terrible visibility, there is nothing to do here other than eat, drink and bathe in the arms of the sea. We do all three with gusto. 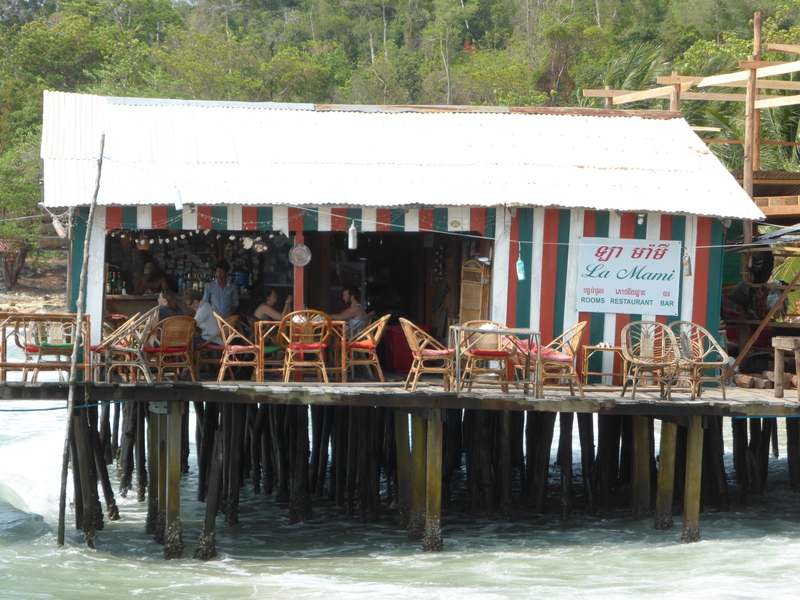 The quality of the restaurants relate directly to distance from the pier, with one exception. 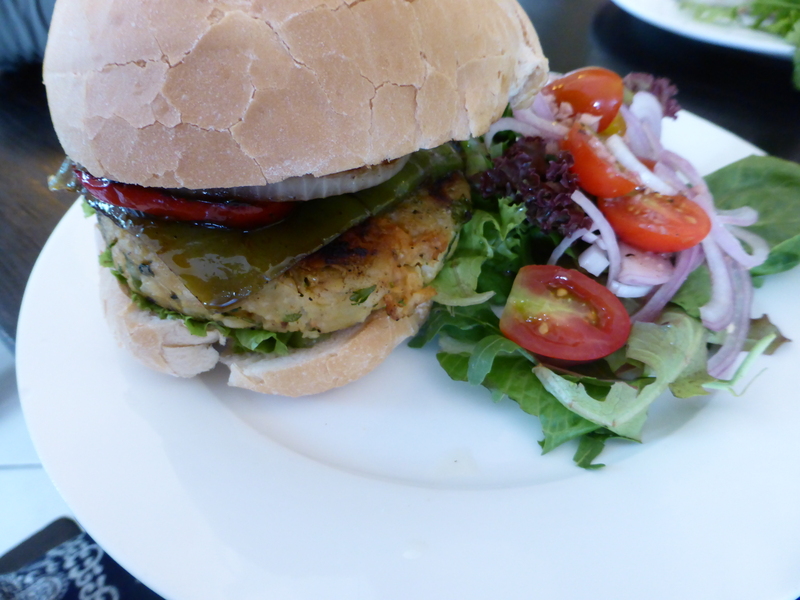 Despite the accommodation options being underwhelming at La Mami, the food is exquisite. Whilst I am not usually one to go for the western option, their Italian menu is outstanding with handmade pastas and freshly prepared sauces. Between us over our four days, we tried tagliatelle bolognese, pesto fettuccine, blue cheese gnocchi, bruschetta and aubergine crostini. When in Rome right? 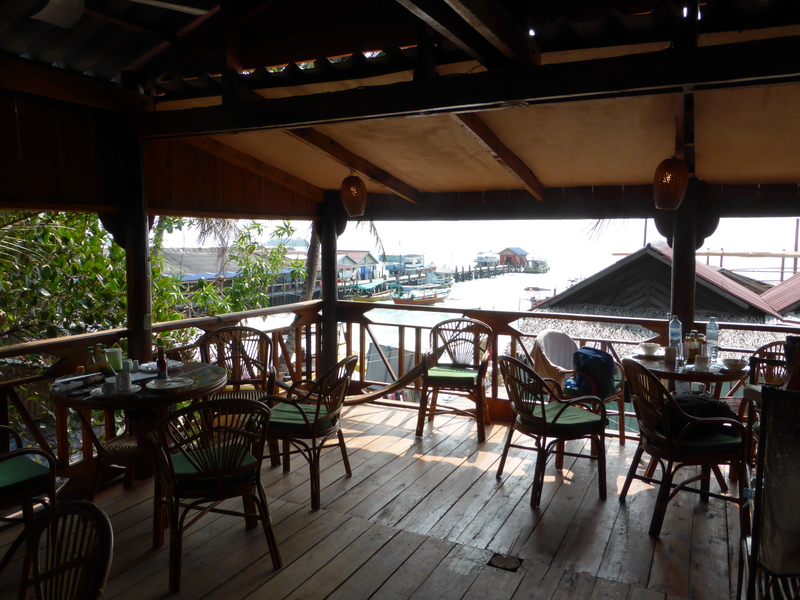 In fact the food was so good that a lapse in concentration caused Buffie, travel buddy du jour on this Cambodian jaunt, to drop her purse onto the pier which promptly fell through the slats and into the sea. 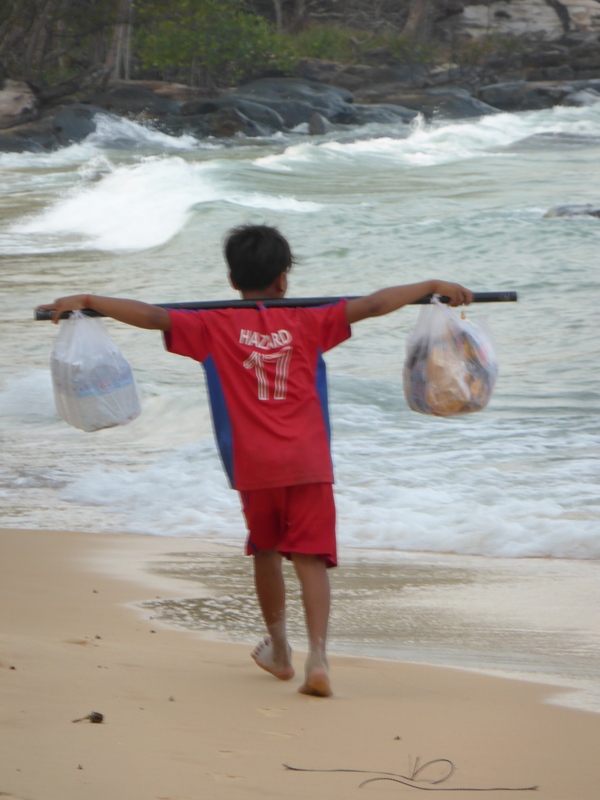 The manager Leo and his pal nonchalantly reach for a fishing net to catch it and deliver it back safely. Points for service boys. 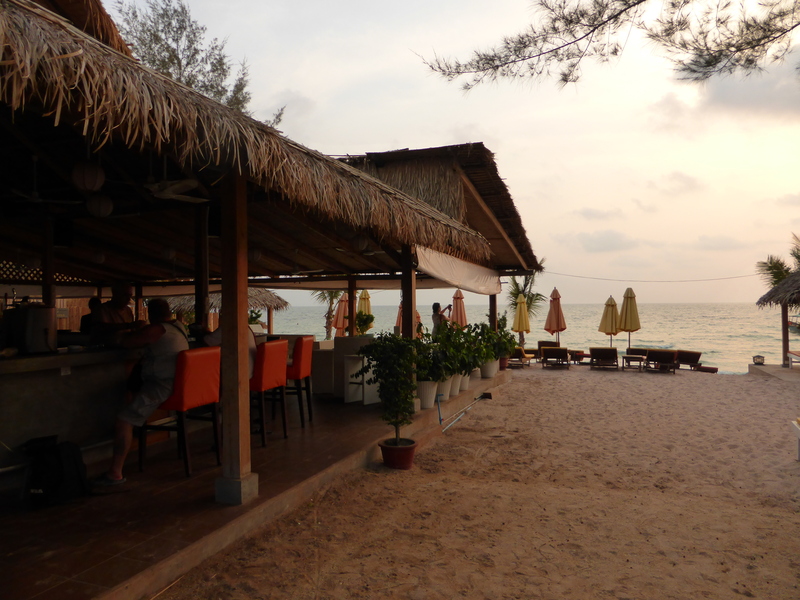 Another highlight was Monkey Kingdom, midway along the beach, which is a very popular hostel that has a brilliant and very sociable raised wooden bar. The view is great. 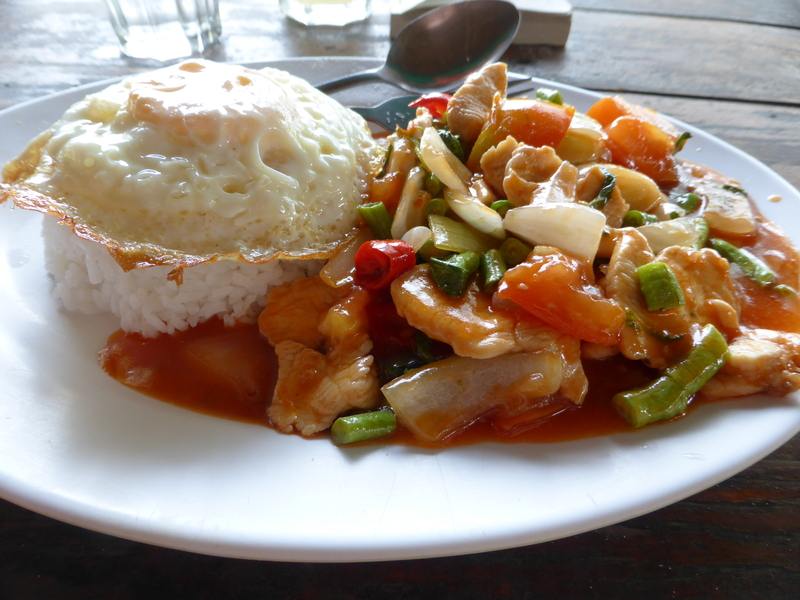 and Pad Ka Pow with chicken. 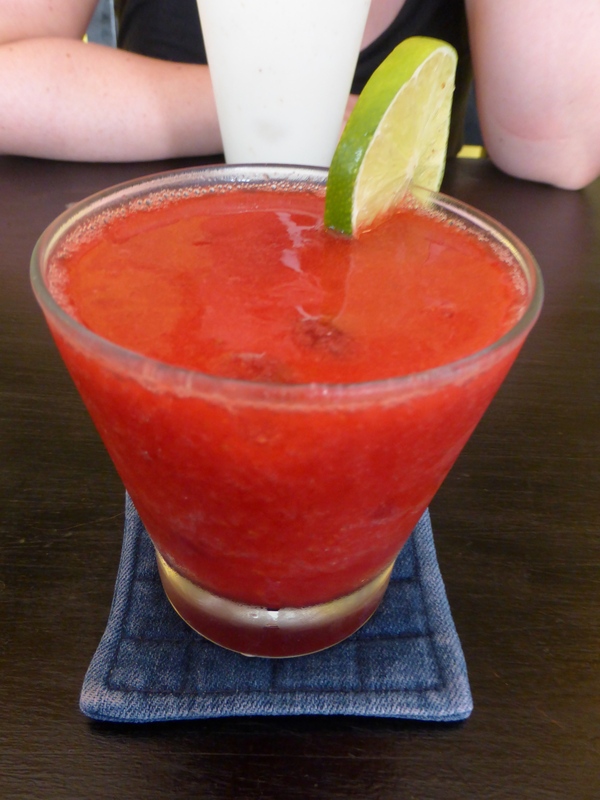 If you stop in early doors, the watermelon shakes are a winner too. 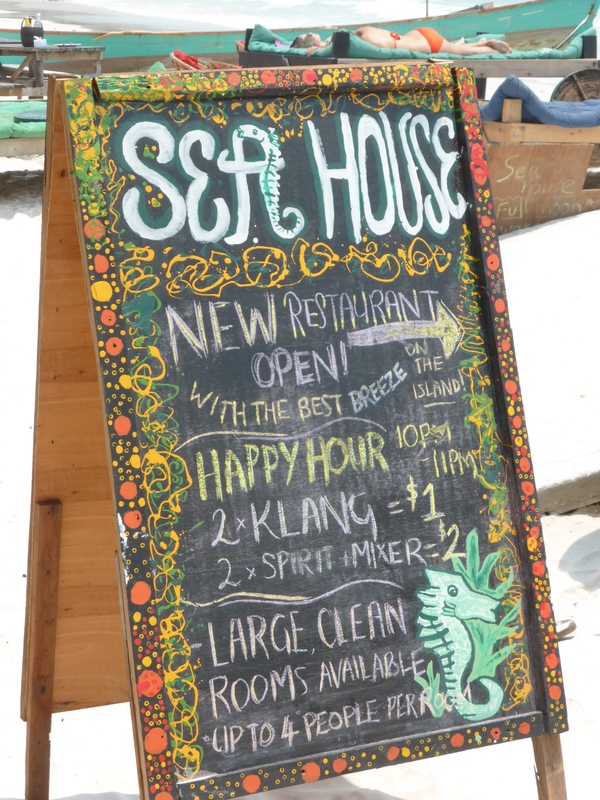 The Seahouse is a relatively new restaurant that we tried, the music was admittedly better than the food, but as it sits on wooden stilts over the water its a good place to catch the breeze and cool down. I had the Beef Lok Lak, another of the national Cambodian dishes, which is marinated beef with a sea salt, lime juice and black Kampot pepper sauce served over salad. The beach at the other end of the island fast becomes our favourite haunt and we manage days of sunbathing where we barely see a soul. 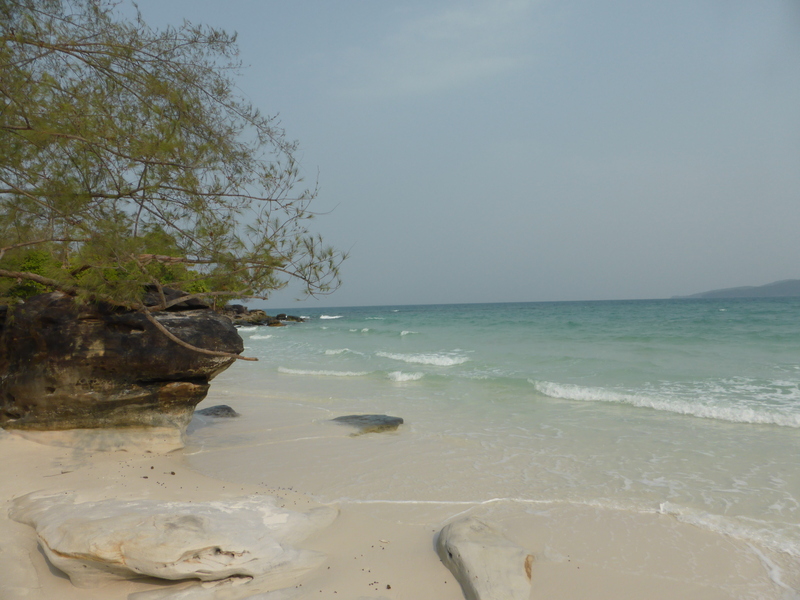 It’s a beautiful walk and the water is perfect, kept calmer by its protective peninsula and shallow enough that you can stride out endlessly before the sand is no longer at your toes. 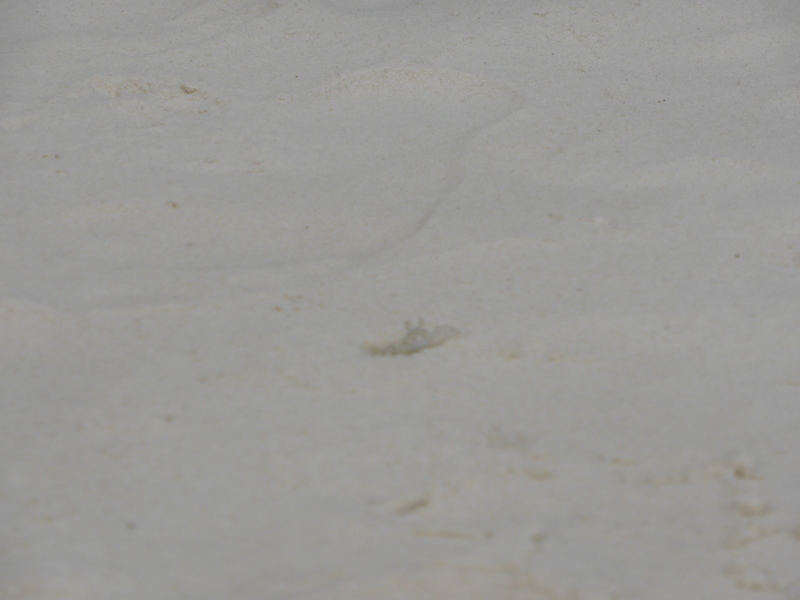 Its mesmerising to watch the sand crabs scuttle around on the sand, starting at every vibration. Can you see this little guy? There is just something very renewing about being by the sea. I have always felt that way, on coastlines all over this Same Small World. I can literally feel the stresses of the last few months wash away; the hospital stint, the excruciating work situation, the arduous 20 hour-long working days and the joyless relationship I had to pull myself out of. For that reason, I fall for this island…rats and all. Some things in life grab you and you’re instantly touched by their beauty, like the opening bars of Corsicana by The Antlers or the smiling face of a friend meeting you at the end of a long journey. 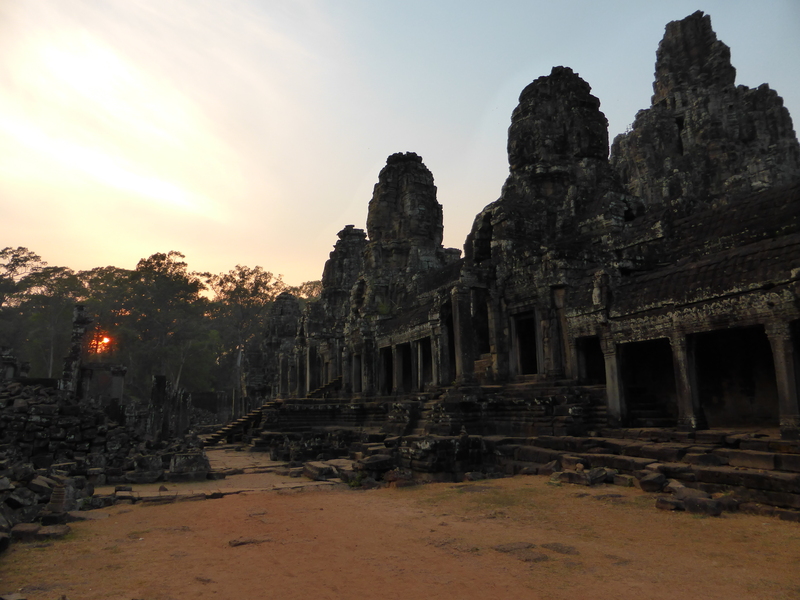 Angkor Wat is one of those things, and my first experience of it is at the break of dawn. 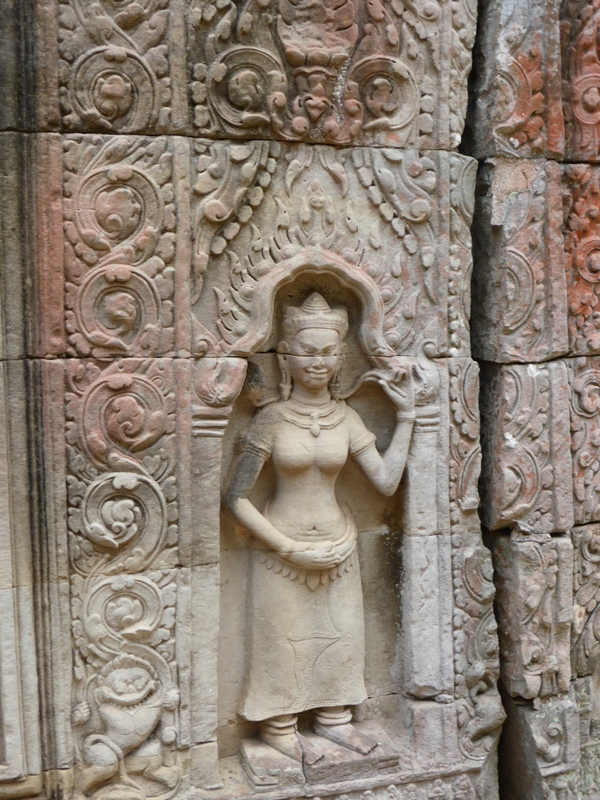 Whilst also shorthand for the dazzlingly impressive 300 kilometre squared temple complex which sits valiantly astride the Tonle Sap river in northern Cambodia, Angkor Wat is also one of the largest temples on the site, built of sandstone and laterite in 1150 by King Suryavarman II of the Khmer empire for the Hindu god Vishnu. And it’s here that we start. After whizzing through the streets of Siem Reap at 5am in a tuk tuk, we are now stumbling in pitch black along the moat over the river through entrance gates and over stone steps which we can’t even see. 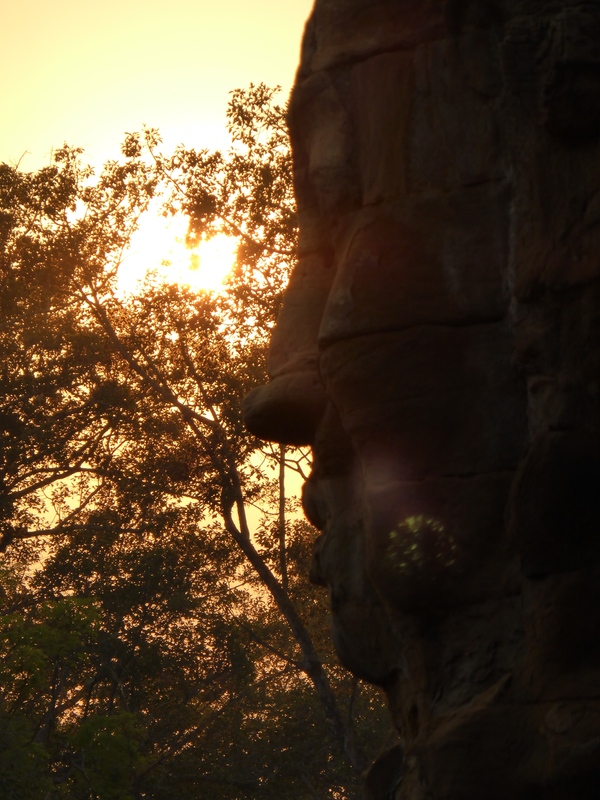 We’re not alone, the respectfully quiet chatter around us implies that we’re amongst hundreds of people making their way to the well documented vantage point to watch the sun come up over Angkor Wat, their darting torch beams the only thing keeping us from falling over. 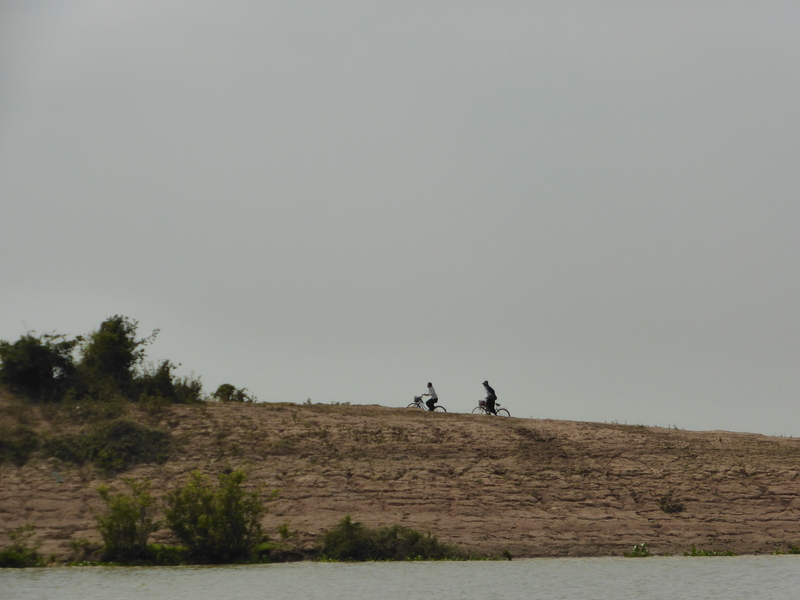 We follow the masses and exit the causeway, ending up next to a lake on the – of the site. It has rather a communal festival feel with groups cross-legged on the floor chatting. As we wait for first light, the chatter dulls and quietens, and slowly the rising sun (albeit shrouded in wispy cloud) reveals those unmistakable and majestic corn-cob towers atop 1500 metres squared of intricate brickwork. And suddenly all at once we feel like we’ve been here a thousand times over. After we’ve taken it all in from a distance, Bette Midler style. We leave the throng at the lake, all draped over the library temples like they were built to take selfies on, and head for the temple. 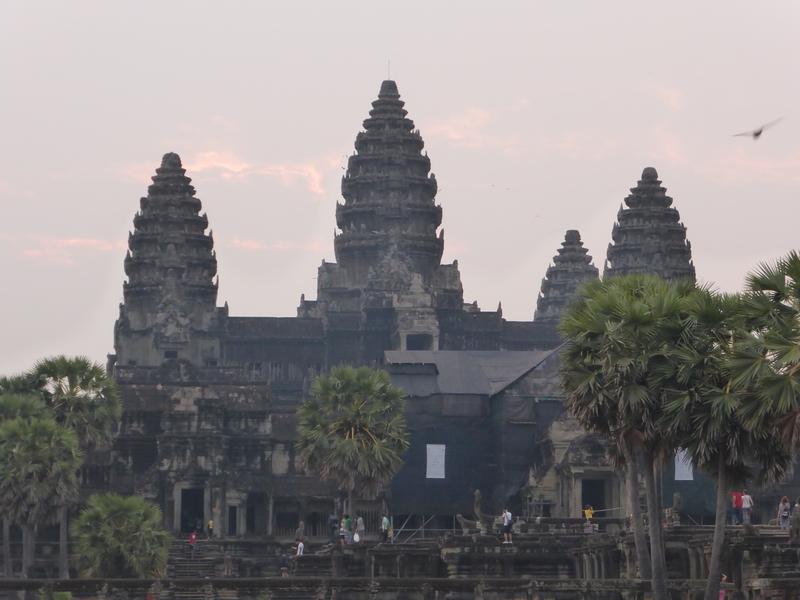 It is said that Angkor Wat took thirty years to complete, and you can forgive the slow workmanship when you get closer. 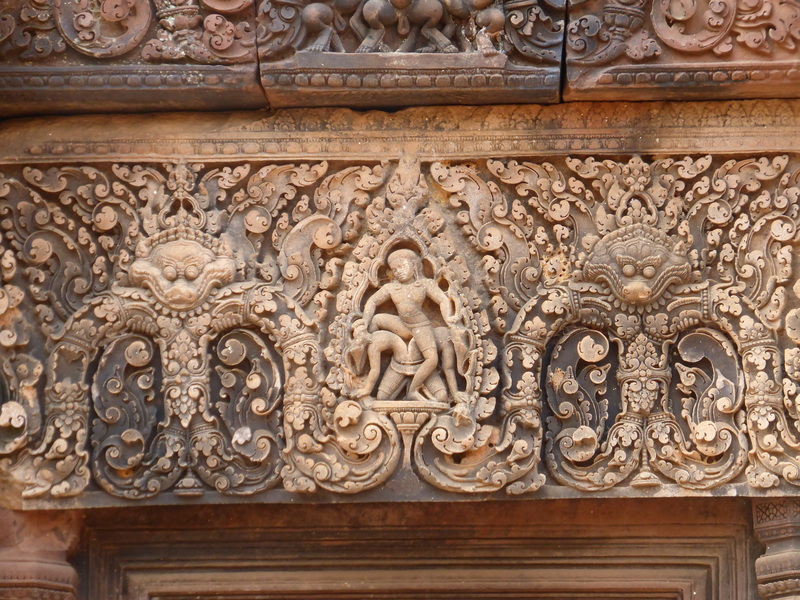 Every nook and cranny boasts such fine detail, with each turn a new feat of crafstmanship surpasses the last. 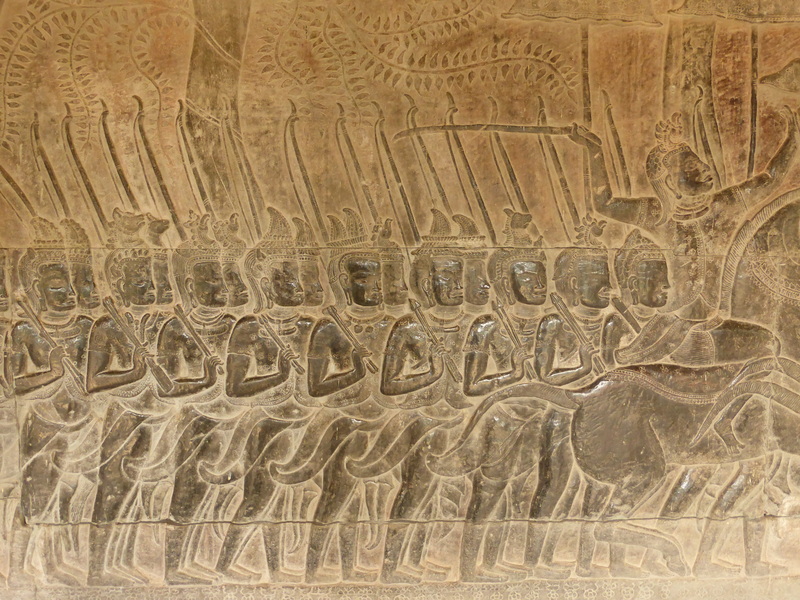 Its 3rd enclosing wall is embossed with a series of bas-reliefs, a particular kind of sculpture designed to be viewed from many angles without distortion. 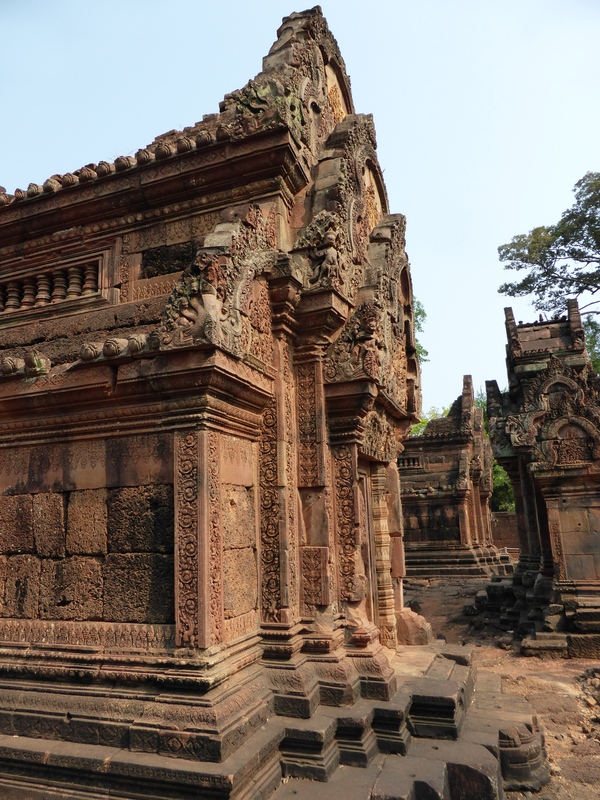 Scholars have ruminated that this particular temple was built for funerary purposes since its bas-reliefs are meant to be viewed anti-clockwise, a direction that was associated with death in the Khmer empire. 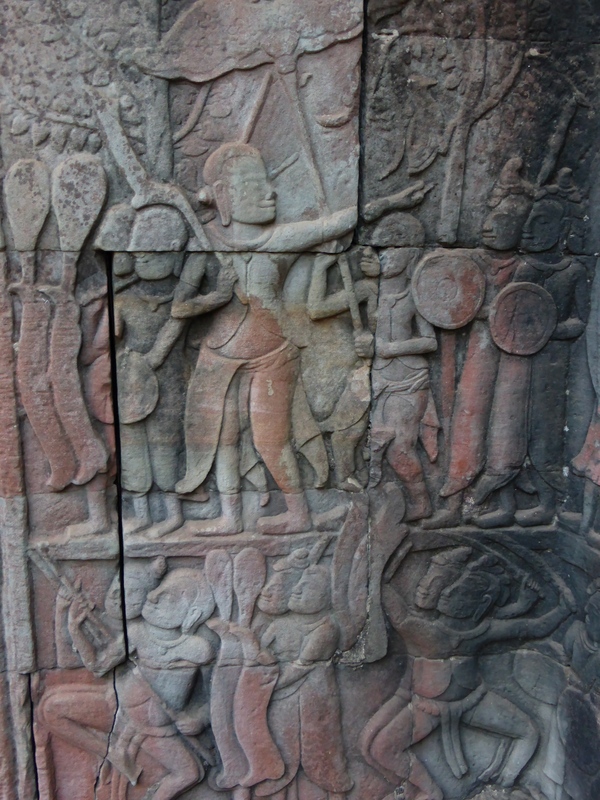 We walk round the walls taking in each gallery depicting battle scenes and tales from Hindu mythology. These were once embossed in red and gold, but it has worn off from thousands of hands caressing the complex and detailed stonework. 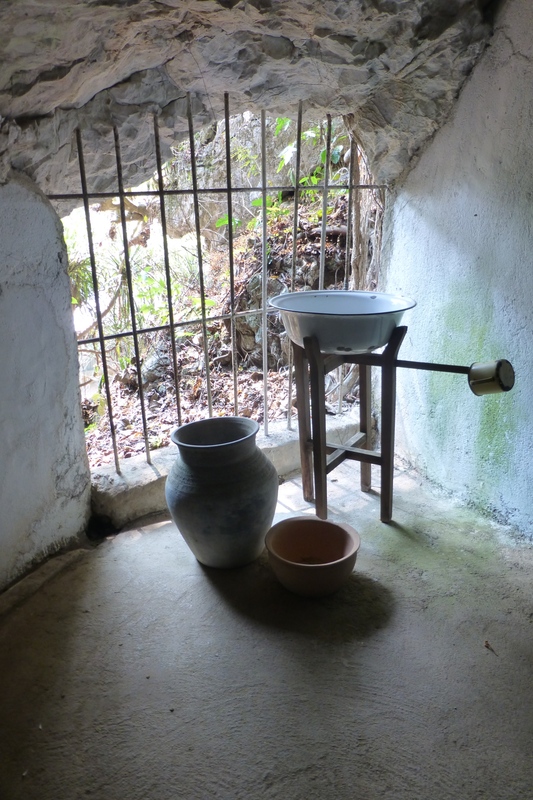 Two of the most famous are the Heaven and Hell gallery, and The Ocean of the Churning Milk.. 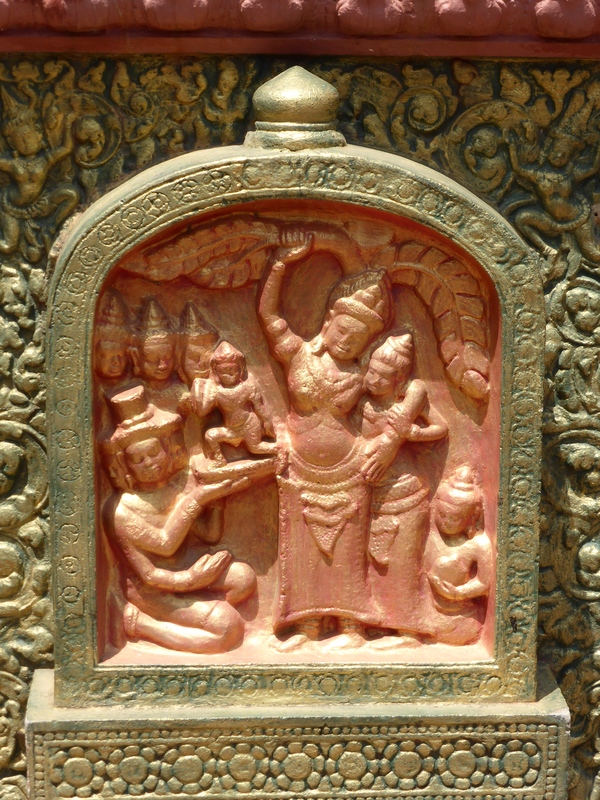 The latter is concerned with the life story of Krishna, one of the avatars of Vishnu. 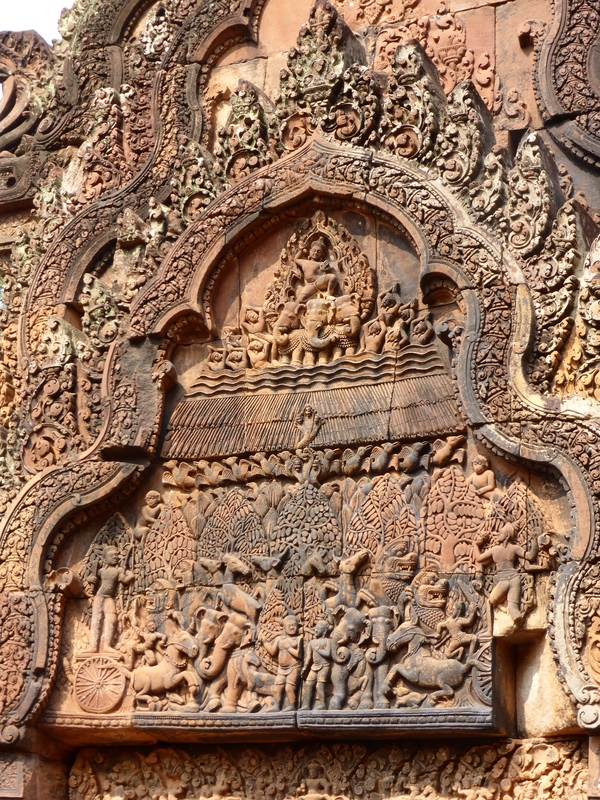 In it the devas (gods) and asuras (demons) line up against each other trying to churn the ocean to make amrita (the elixir of immortality.) I’ll tak a cup o’ that. Nearby the Chamber of Echoes is a place where sound reverberates if you stand with your back to the wall and thump your chest. 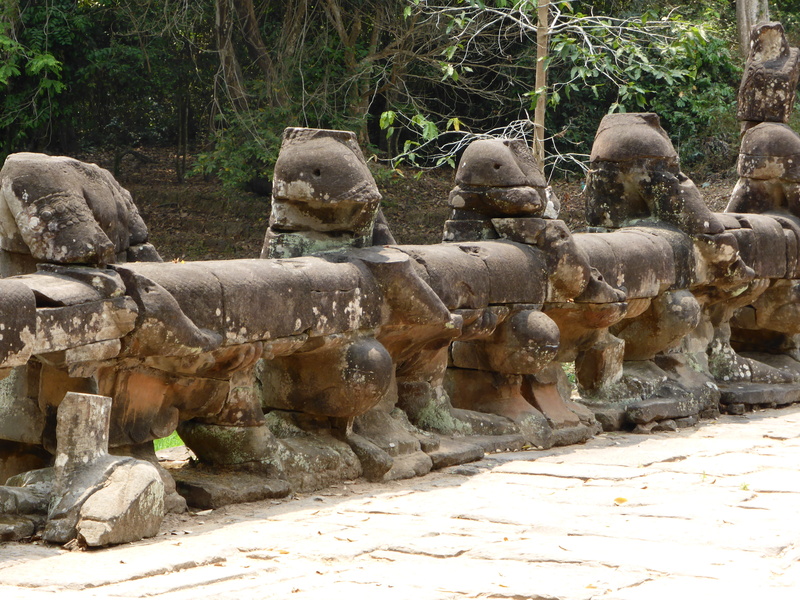 This what the locals do, three times, for good fortune. This time for free. 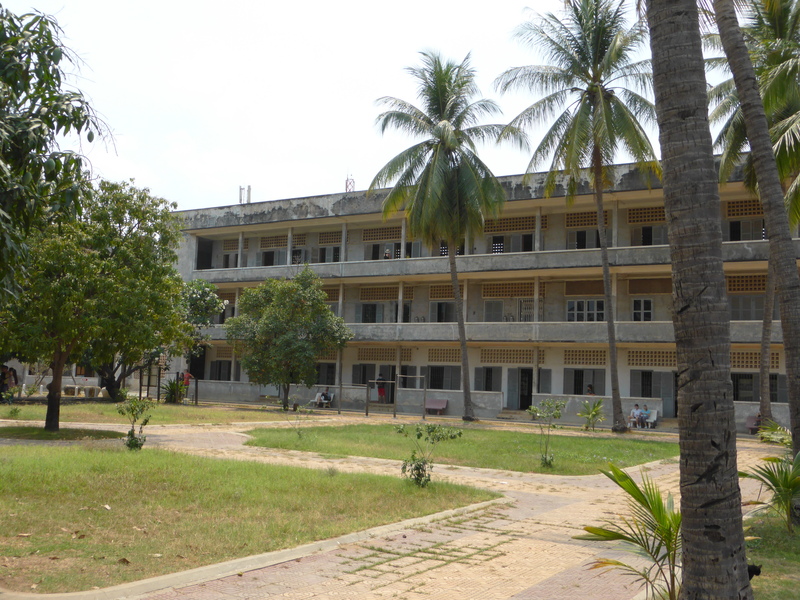 In the same cloister are the old library buildings and the south west and south east corner of the complex. 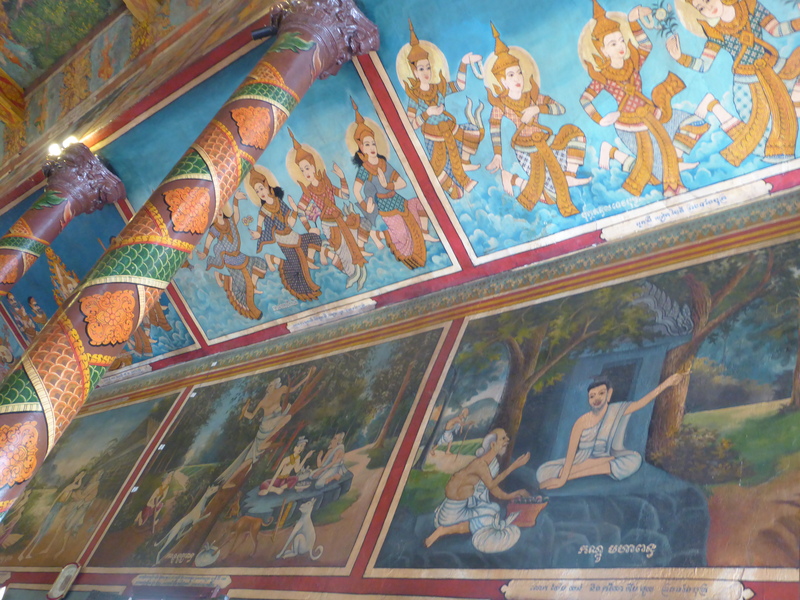 Up another level is a stunning frieze of apsaras which are spirits of the clouds and waters from both Hindu and Buddhist mythology, the emblems (and poster girls) of this beautiful country. 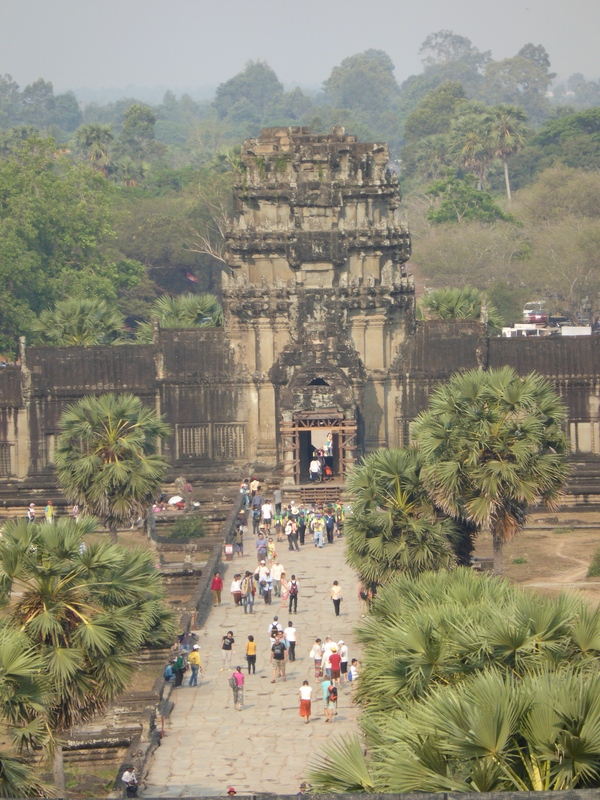 It’s a steep climb to the third and final level, which only the high priest and king would have been allowed to visit in Khmer times. Here, your flesh will need to be covered to within an inch of its life to observe the tradition respectfully, a scarf over the shoulders won’t do. 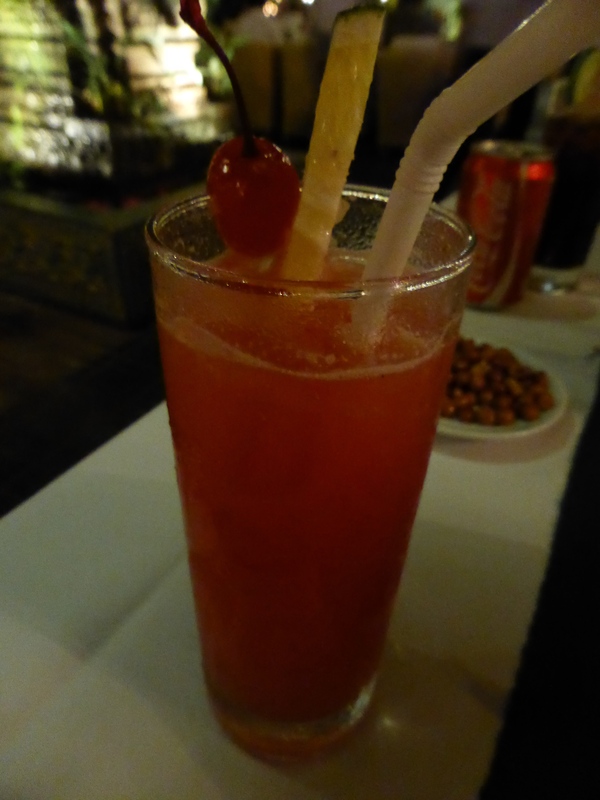 But, after the climb, in the excruciating heat, we are very much rewarded. 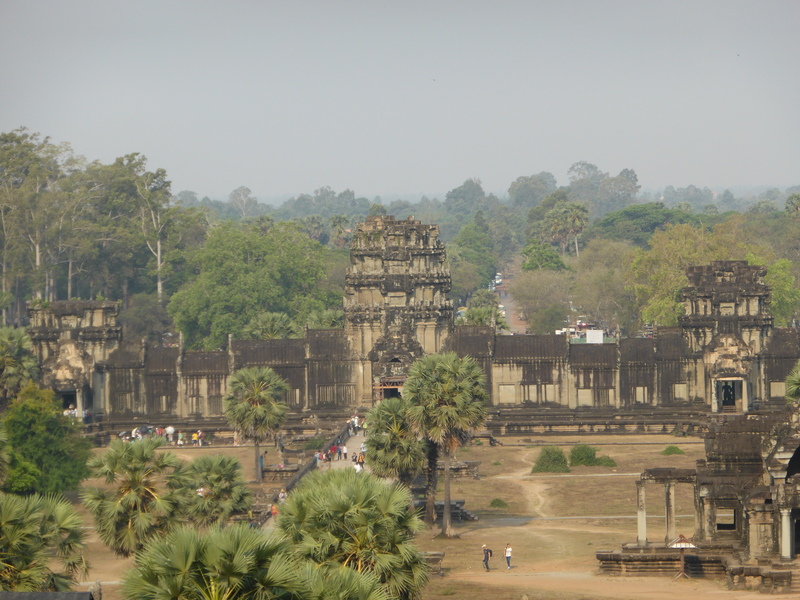 The views outward are of the dense forests and rice paddies, the sheer scale bringing your jaw to a slack position. The views inwards are just as gratifying. Beautiful courtyards giving way to the 65 metre corn-cob towers themselves. 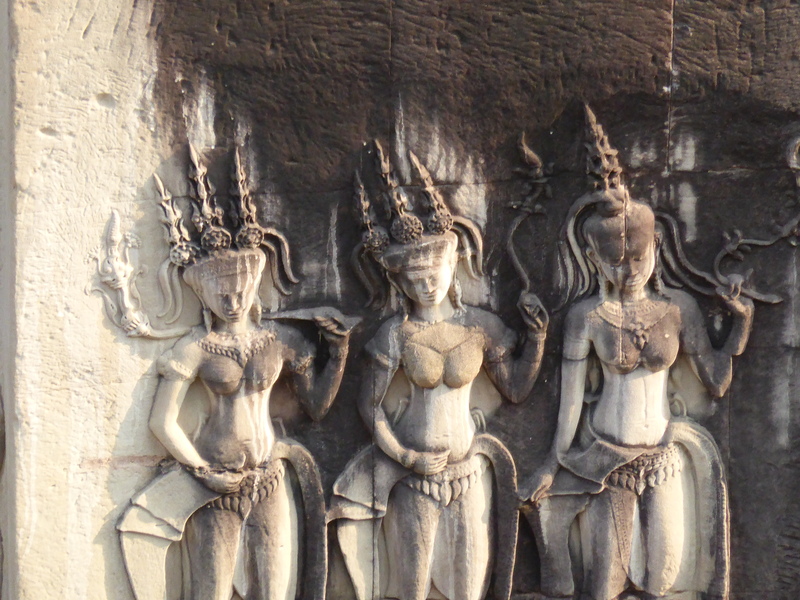 If you can squint long enough into the debilitatingly hot sun, you’ll see garudas (large mythical birds), nagas (serpents) and apsaras (poster girls) on every inch of every spire. On the way out at the gates, we stop in at the statue of Vishnu resplendent in saffron. Sounds just heavenly doesn’t it. Well, it does have its downsides. 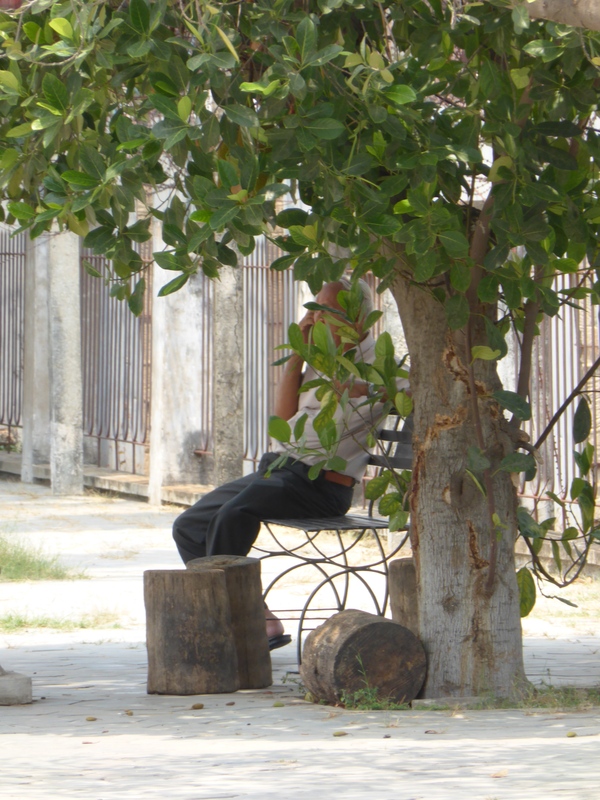 We are harangued relentlessly by local vendors to eat and drink almost constantly when outwith the enclosure walls. That I can deal with. The fact that they are all named Harry Potter, Lady Gaga, 007 etc, I can’t. This could indicate numerous things; that Western tourists are so lazy they can’t remember a Cambodian name, that they’re so oblivious they can’t identify someone they just had a conversation with or that they are so xenophobic that the moment they see something which connects them to the part of the globe that they can relate to more closely they are so giddy with excitement they’ll by a $2 dollar Coke. Or all of the above. 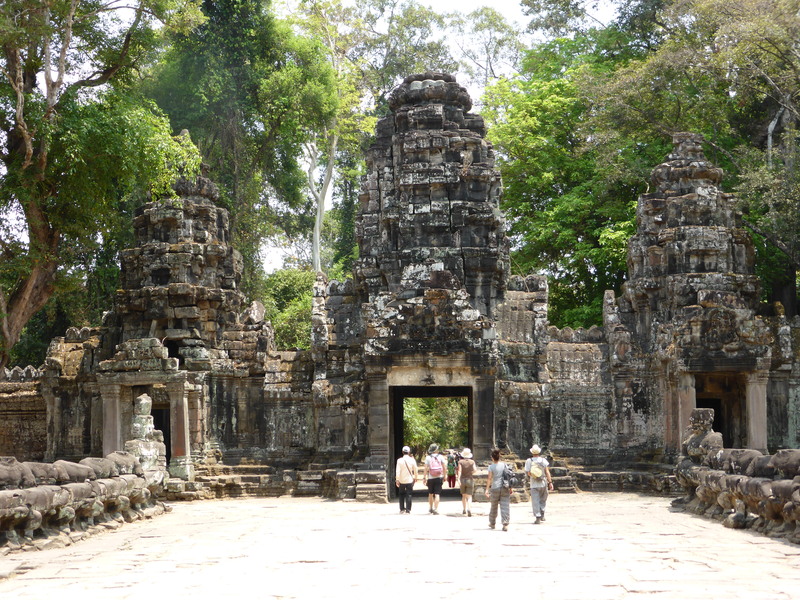 We beat a hasty retreat after this due to the searing heat, returning the next day in late afternoon to the Angkor Thom complex and specifically the Bayon. 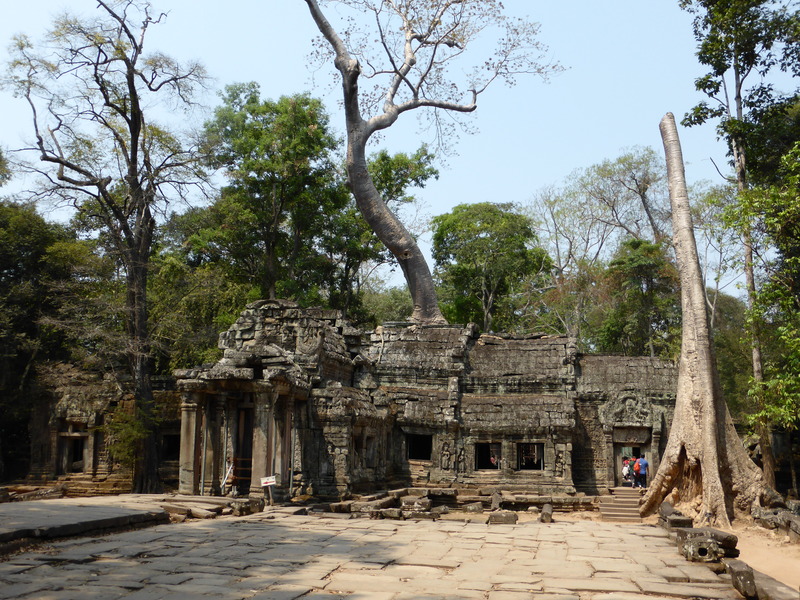 When we reach there, a production team are setting up for a film shoot which is not uncommon here (parts of Tomb Raider were filmed at nearby Ta Prohm…of which more later.) 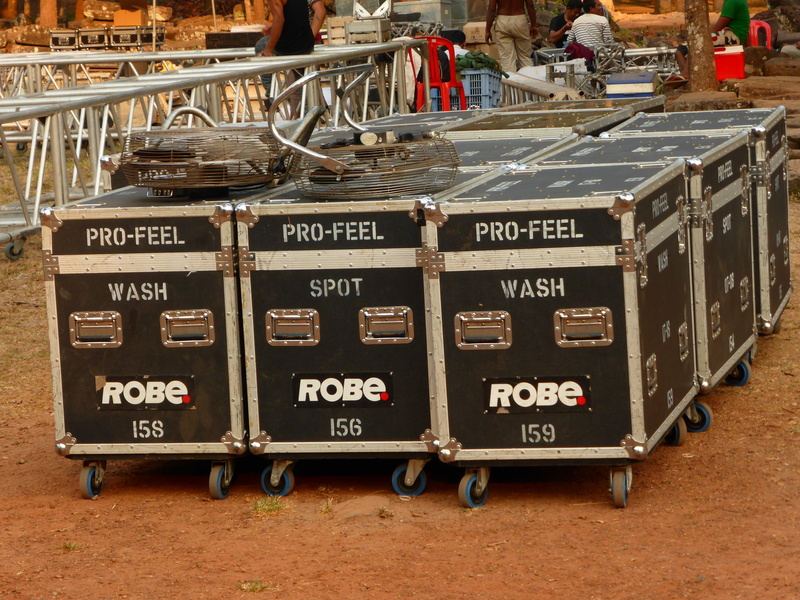 In front of the temple, flight cases are lined up and lighting rigs are being assembled around us. 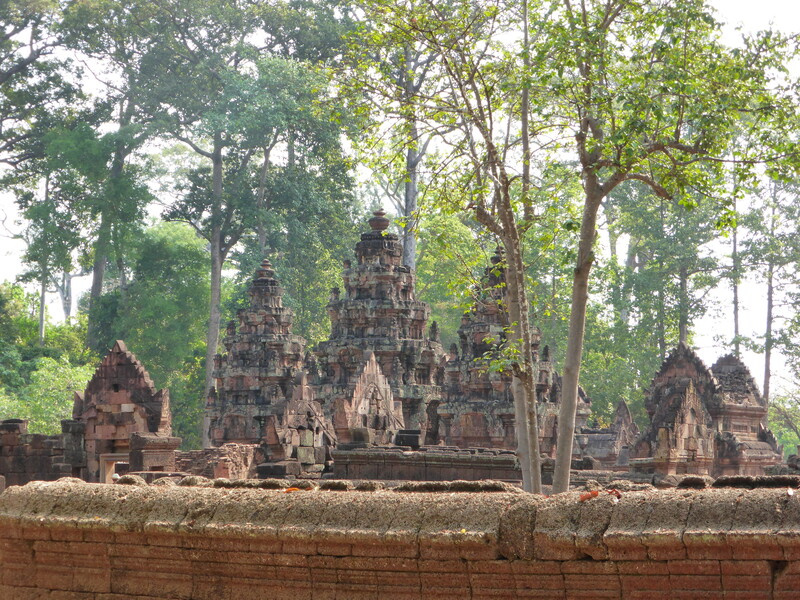 But within the enclosure walls and away from the melee, we see the temple in all its uninterrupted glory. In this lower light, the setting sun seems to turn the stone pinkish in this dusky hue. It’s a beautiful time of day to see it. 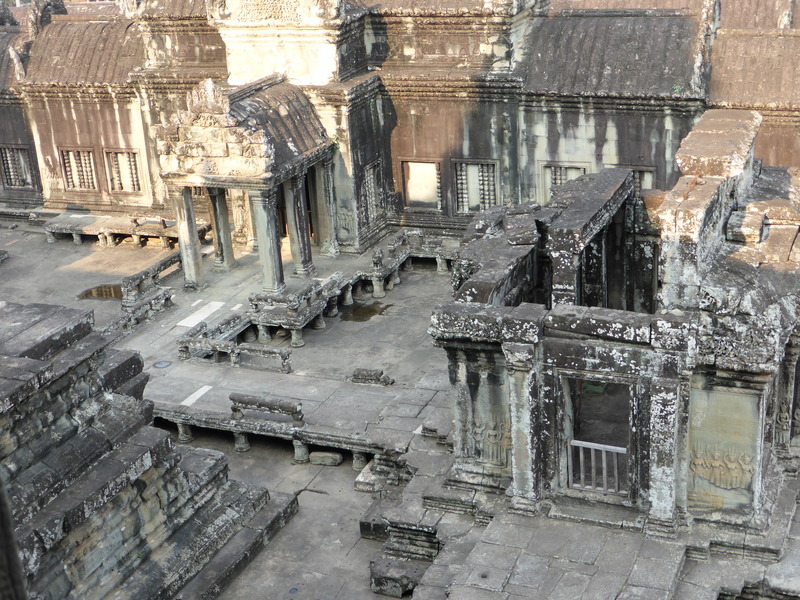 The eye is drawn immediately, and mesmerisingly, to the temple’s unique selling point (marketing speak people…bathe in it) which is 216 faces carved into the temple’s 54 stone towers dominating the view from every enchanting angle. 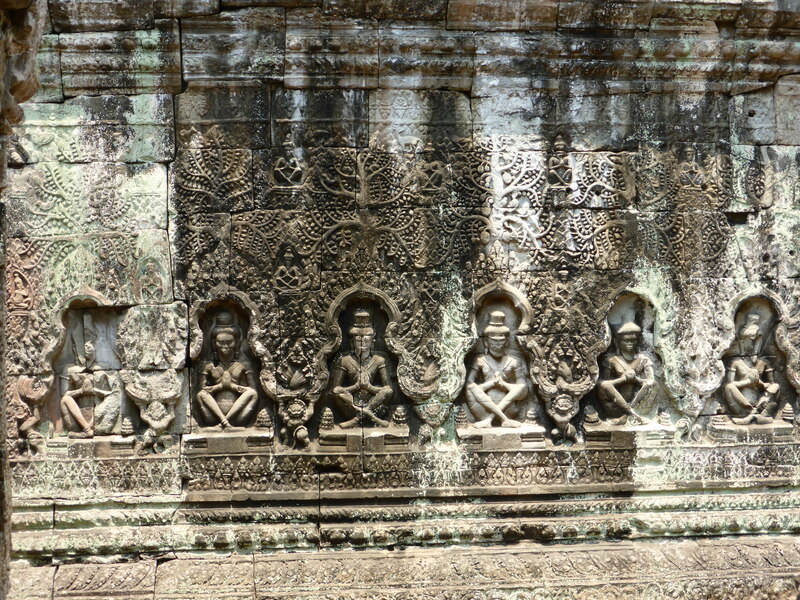 Some claim that these were modelled in the image of the ever modest Khmer King. 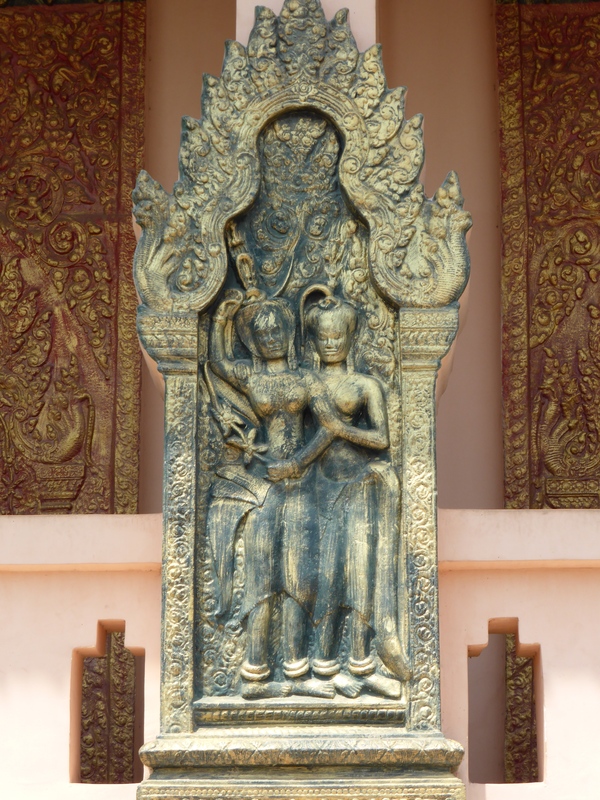 Others say that it is the image of Loveskara, meaning ‘Lord of the world’, the bodhisattva said to encompass the compassion of all buddhas in Mahayana Buddhism. 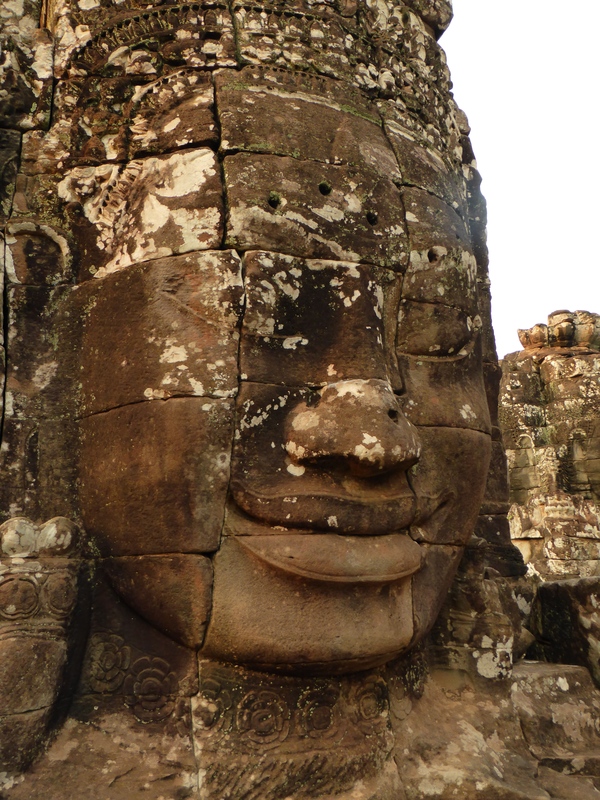 …but many are unfinished and in poor condition, so I’d suggest swerving these and spending your time seeking out the faces and taking a moment to admire how the light dances upon the stone. 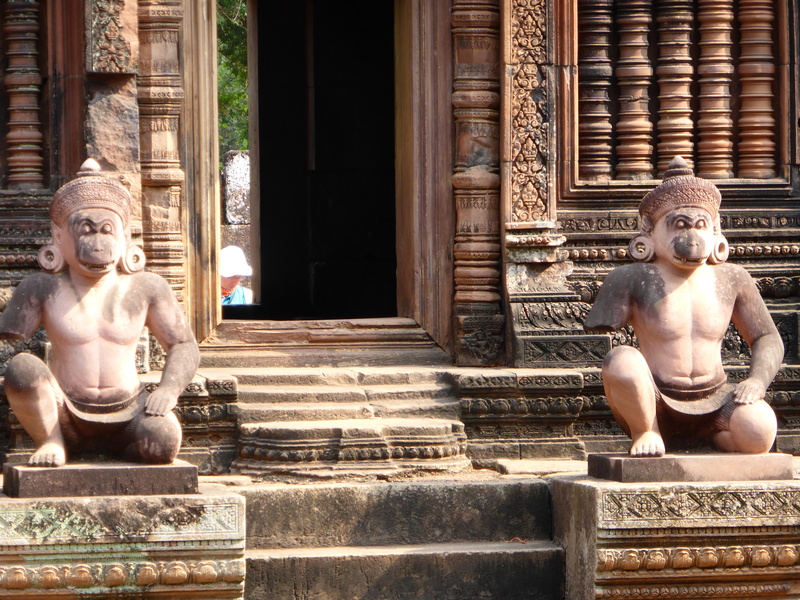 Next up the following morning is Banteay Srei, the veritable poster boy of Angkor Wat itself. 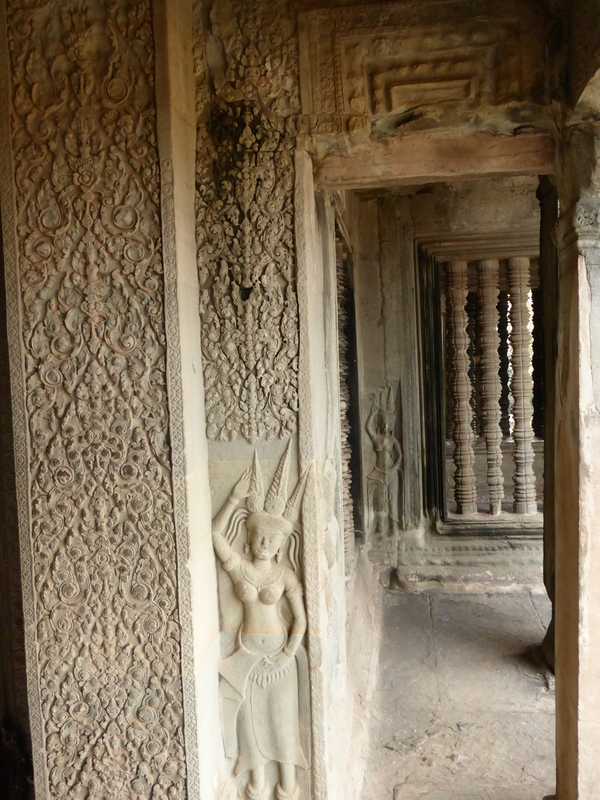 Or perhaps we should we say poster girl given that it translates as ‘Citadel of women’, its intricate and detailed carvings in the fine-grained rose-pink sandstone lending themselves to the legend that it was built by women. 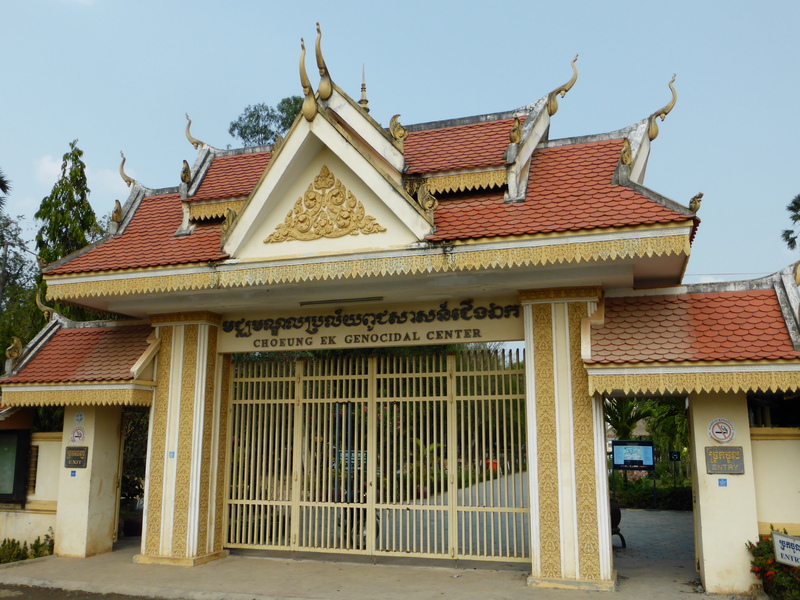 This is the temple that adorns $2 dollar t-shirts the country over, and it’s understandable. 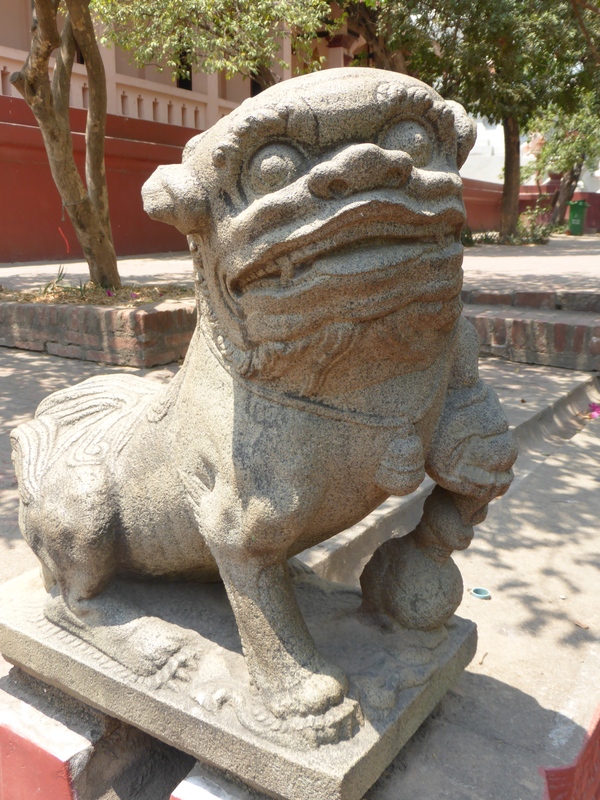 Even if you’d spent a full week shuffling around temples in the excruciating heat, I defy your heart not to soften on sight of this charming beauty. 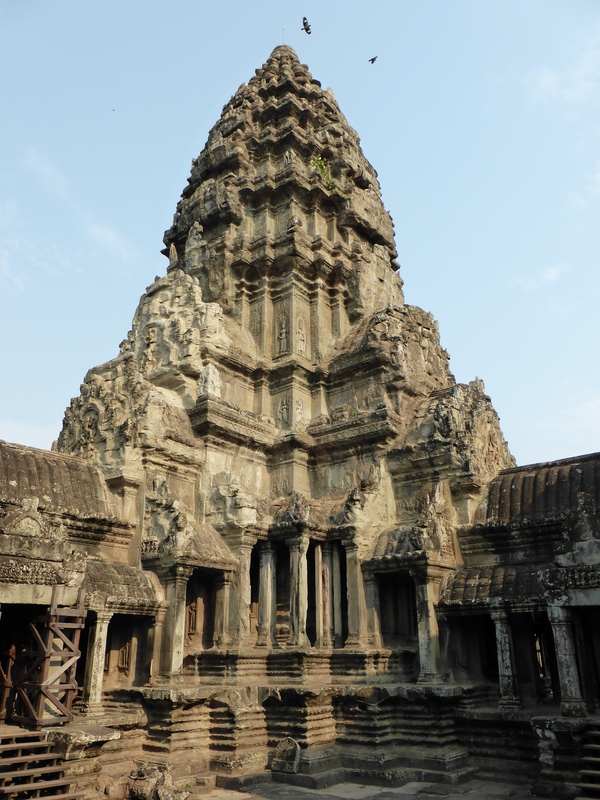 This temple is the Kylie of Angkor Wat, positively diminutive compared to some of its contemporaries comprised as it is of one single level. 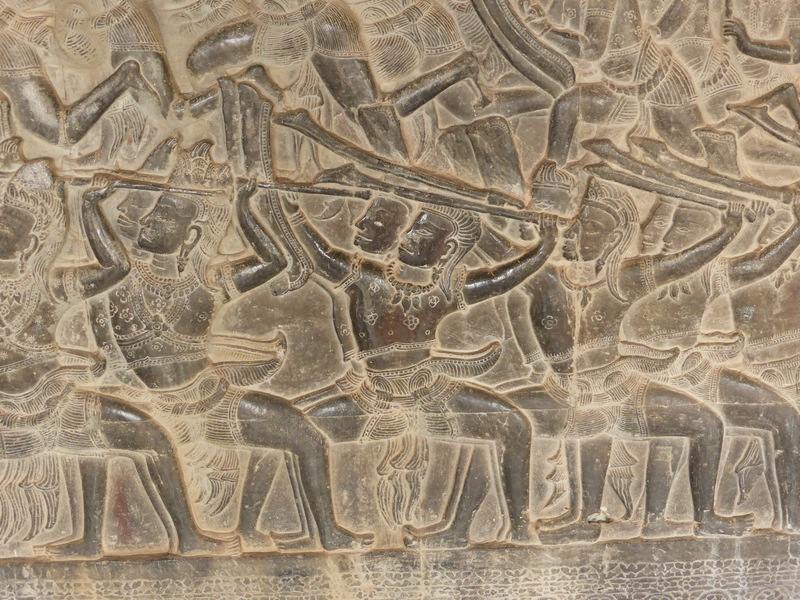 It is richly embellished with floral motifs and scenes from the Ramayana, considered one of the great Hindu epics. 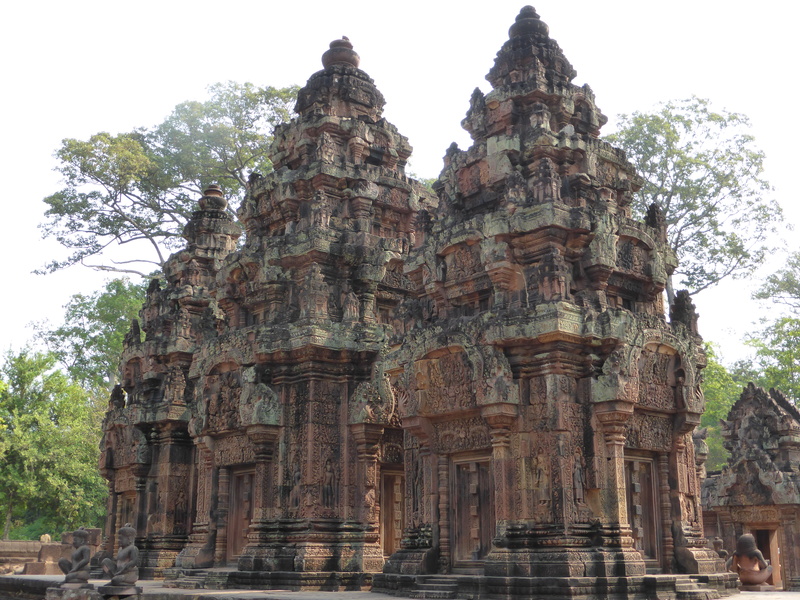 The temple itself was originally dedicated to the Hindu god Shiva in 967. 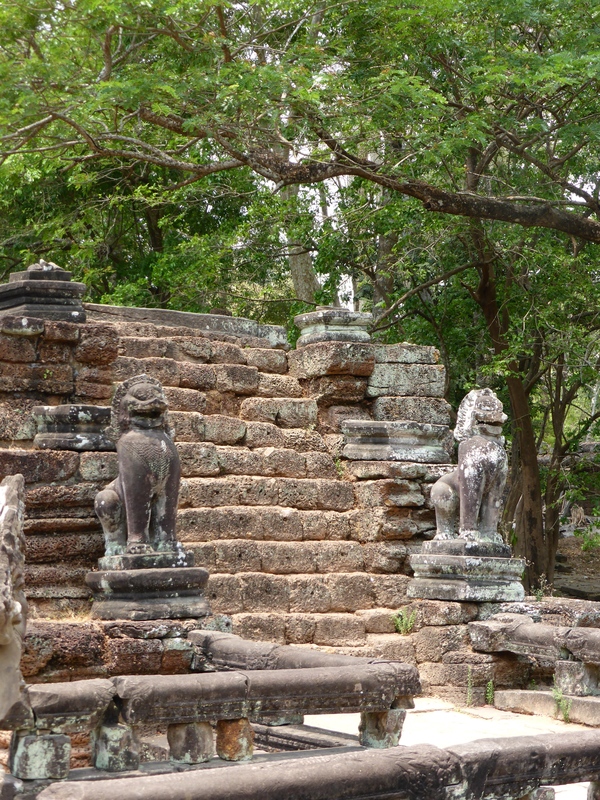 Mythical beasts with monkey’s heads and human bodies guard the temple steps. 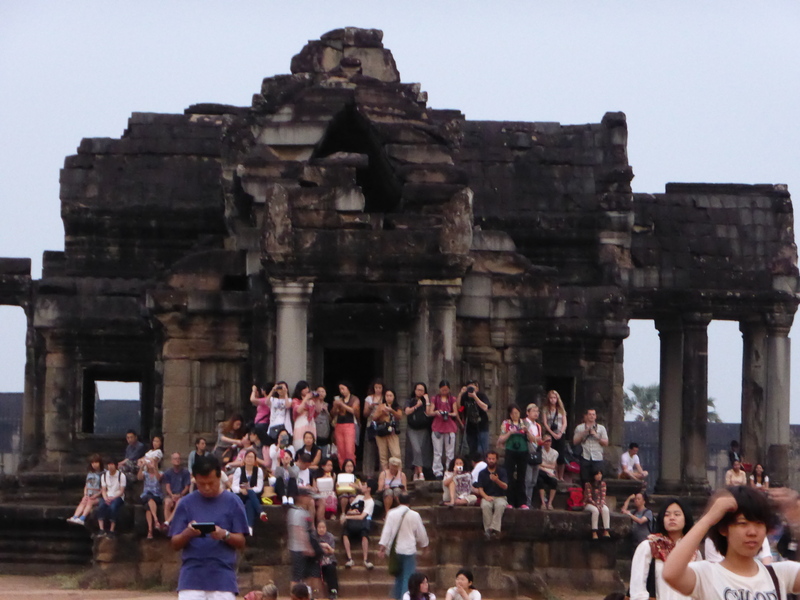 It’s a popular spot despite the 25km schlep from the main drag of Angkor Wat, so it is not conducive to linger here and the flow of visitors kind of carries you aloft towards the western exit. A local band of musicians raising money to support those affected by land mines plays us out with a beautiful soundtrack. 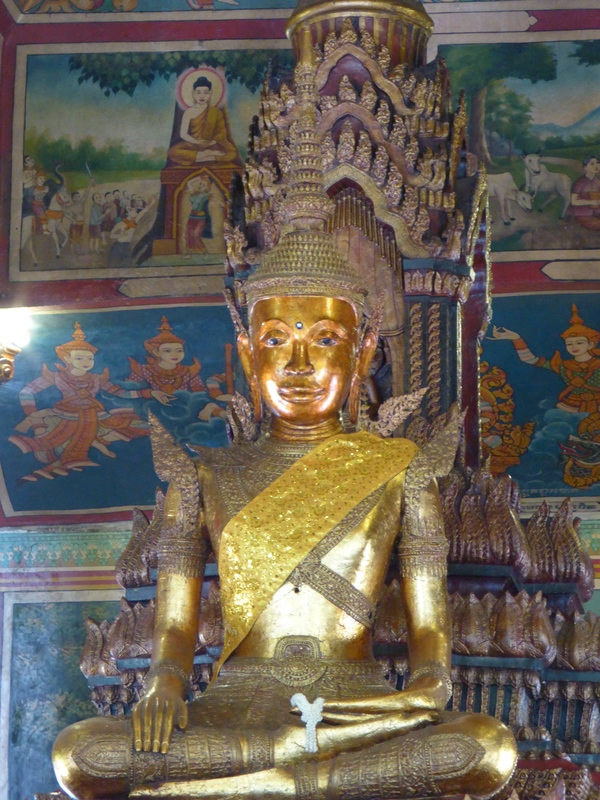 It’s worth stealing one last glance over your shoulder at the resplendent temple before the off. 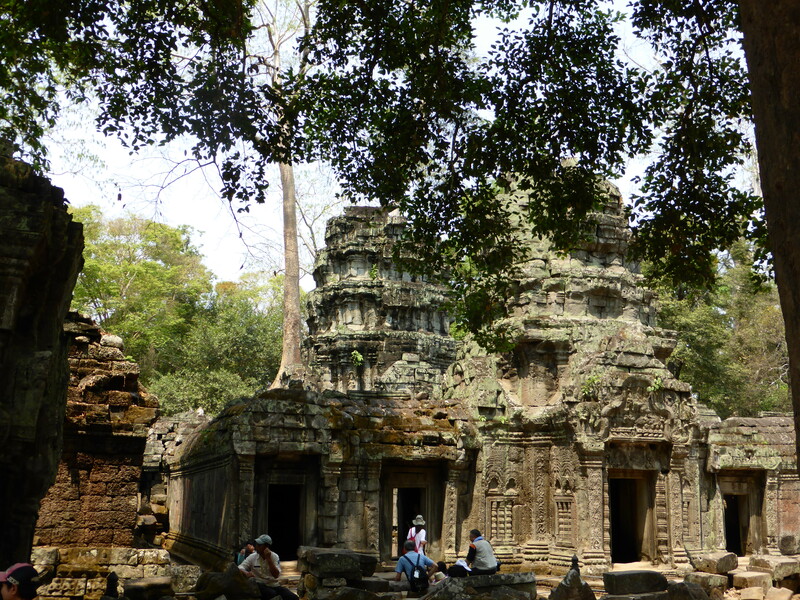 Our penultimate stop is Ta Prohm, made famous by a lycra-clad Angelina Jolie in Tomb Raider. 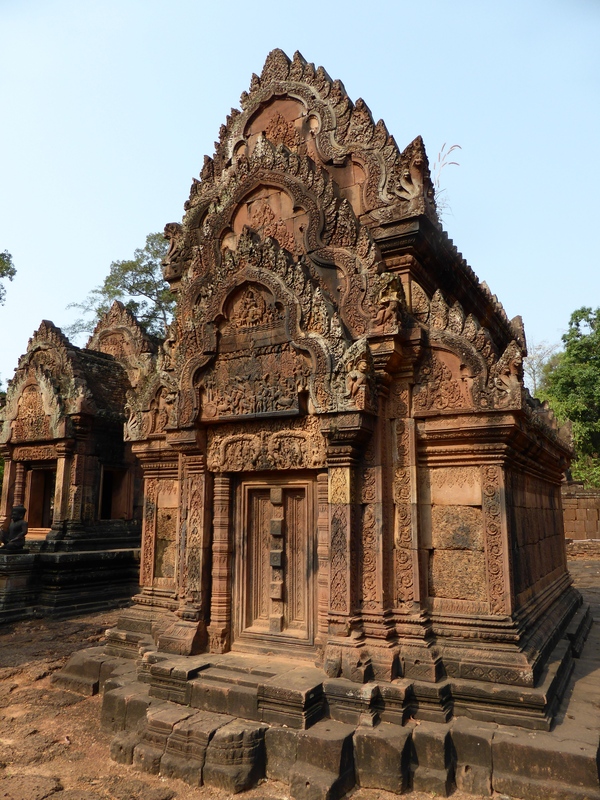 It was built in 1186 as a monastery dedicated to the deity Prajnaparamita. 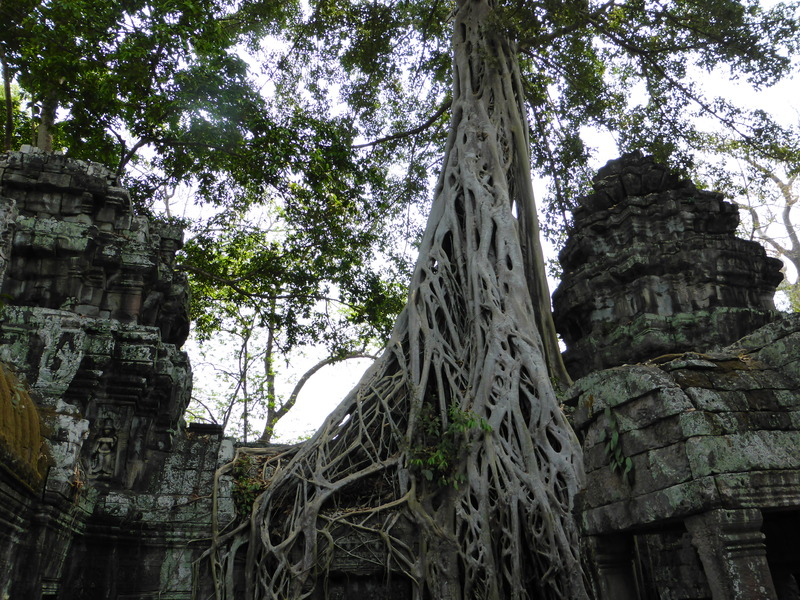 Over time, nature has battled with it and in this case, won. 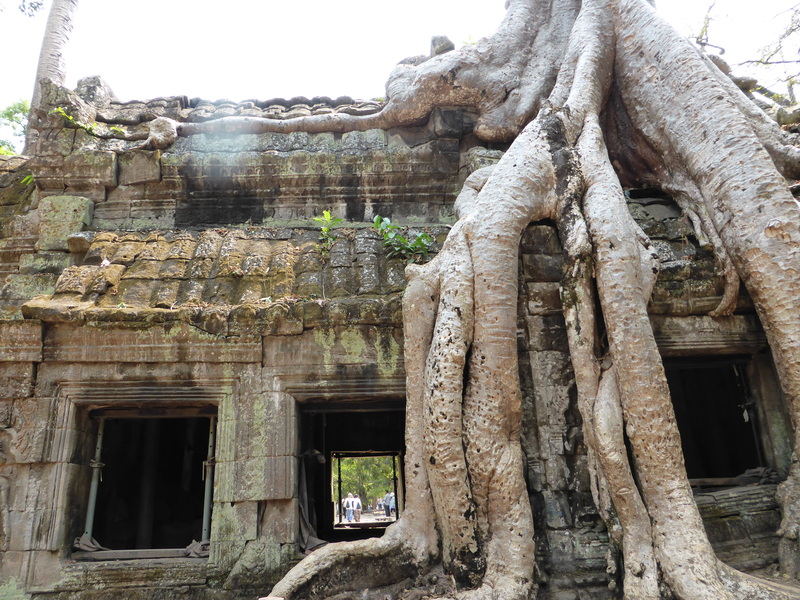 Enormous kapok trees wind their way over, above and through the terraces and walls. Wandering around it feels like walking down London’s Oxford Street though, it’s overcrowded and mostly shrouded in scaffolding. 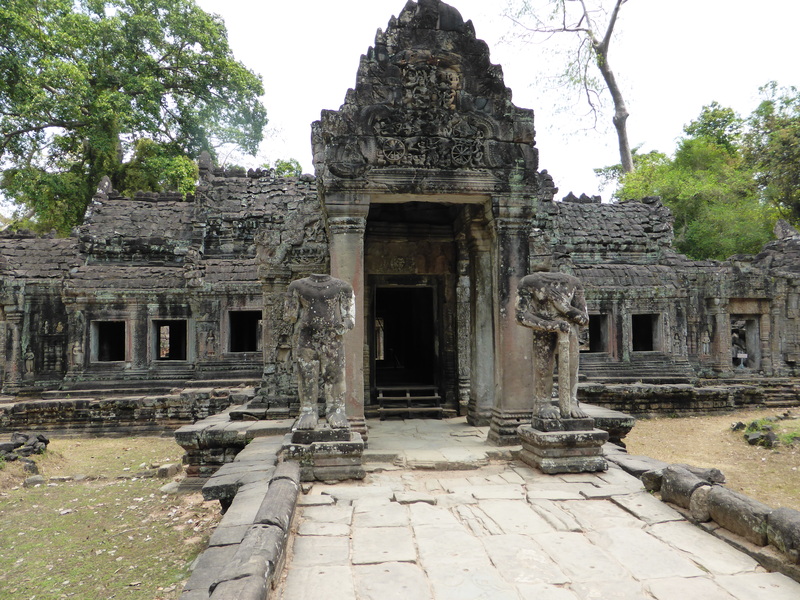 We make a very sharp exit and head for Preah Khan. 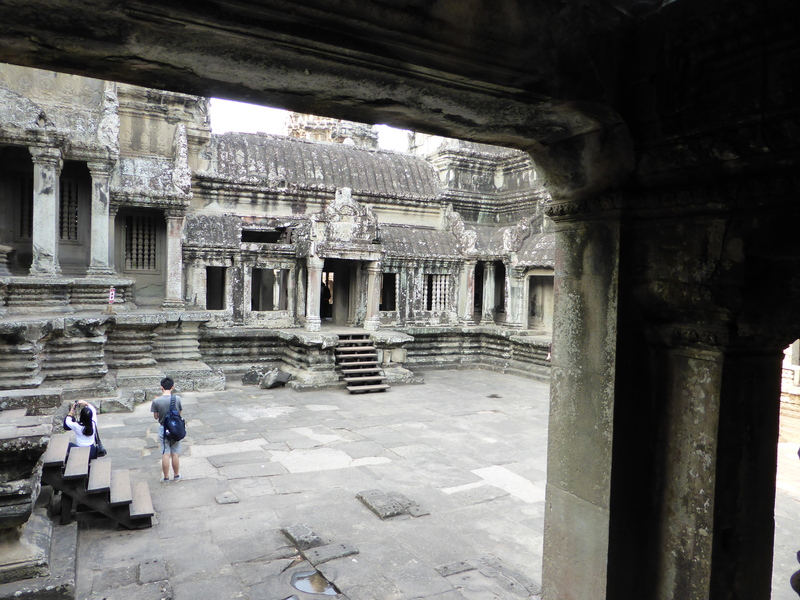 Here, we find something unique to Angkor Wat…peace. It starts at the processional way entering the western gate. 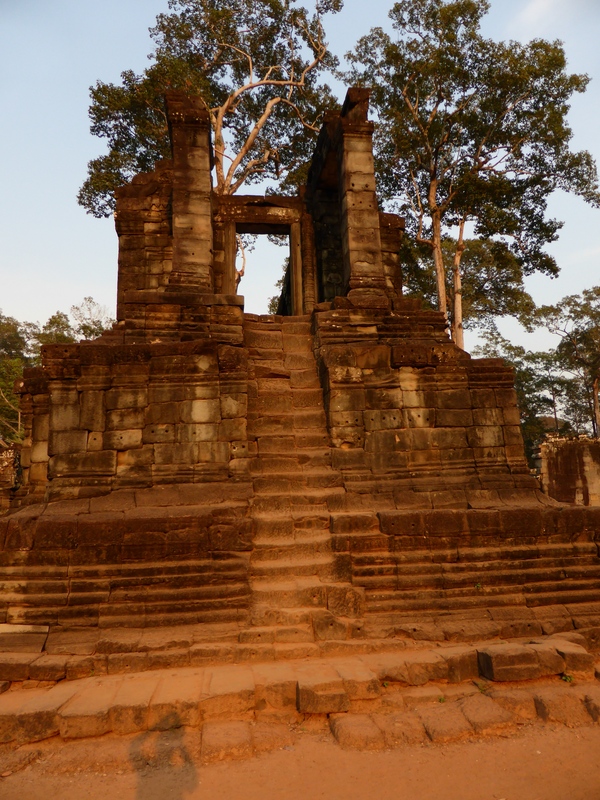 Preah Khan was built by Jayavarman VII on the site of a former royal city, and it was here that the king lived whilst he was overseeing the restoration of Angkor Thom. 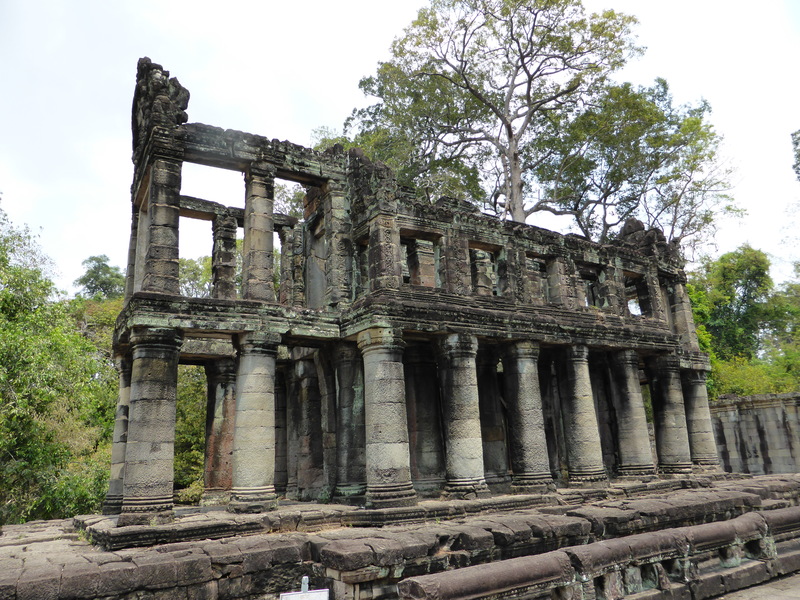 The name Preah Khan means ‘sacred sword’ is said to be a weapon that was ceremonially gifted by the king to his heir, so the person holding the sword hold’s the throne. Soon I’m clambering through the halls and corridors of the temple which once served as both a monastery and university. Nature has also had its way here and lichen encrusts the sandstone giving it a very ethereal feel here. 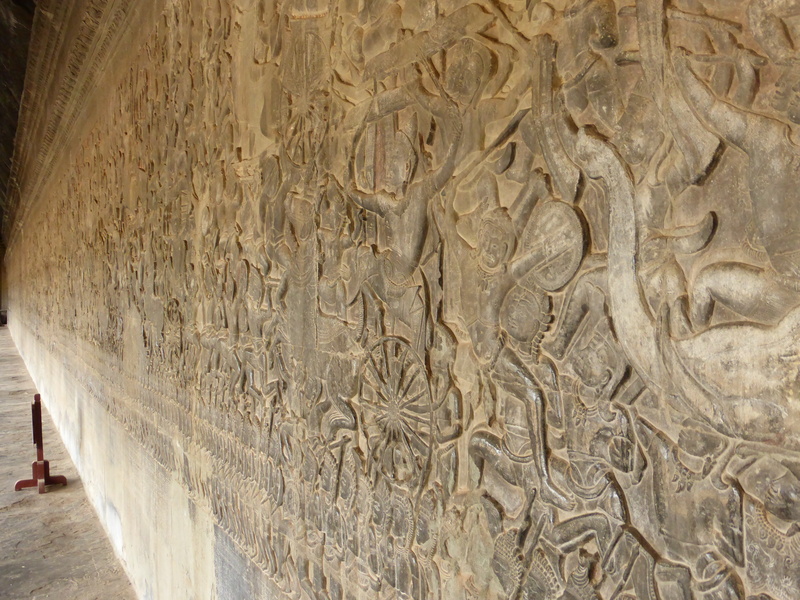 The walls are graced with yet more eye-catching carvings. Taking respite from the sun, I grab a seat on the stairs facing one of the library buildings. Right at this point I feel a calmness descend over me. 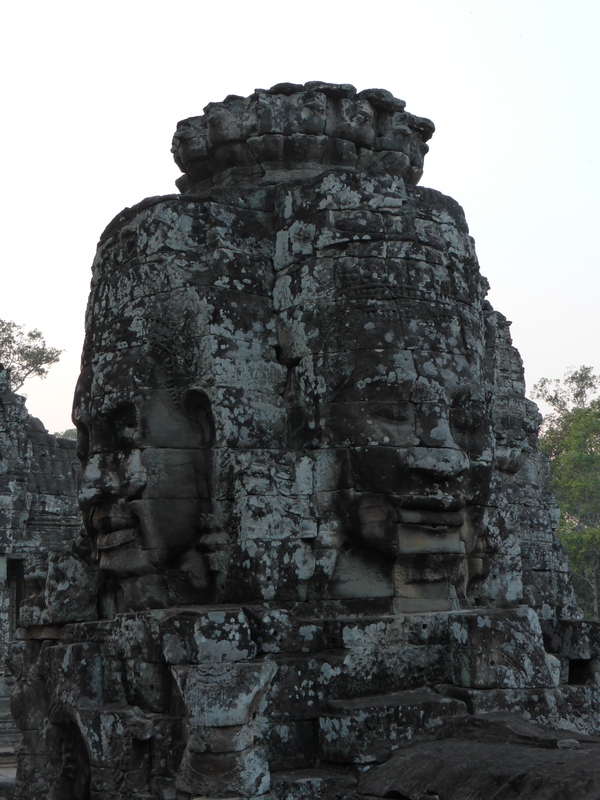 The beauty of the temples hit me over the head from the moment the sun rose over Angkor Wat on the first day but it’s not until now, away from the bartering Lady Gagas and 007’s, that the serenity takes hold. Maybe it’s the yoga, maybe it’s the full moon, maybe I just utterly love being back on the road again. But a switch flicks today for sure. It seems like the right thing to do to pay my thankful respects at the stupa of Buddha on the way out. 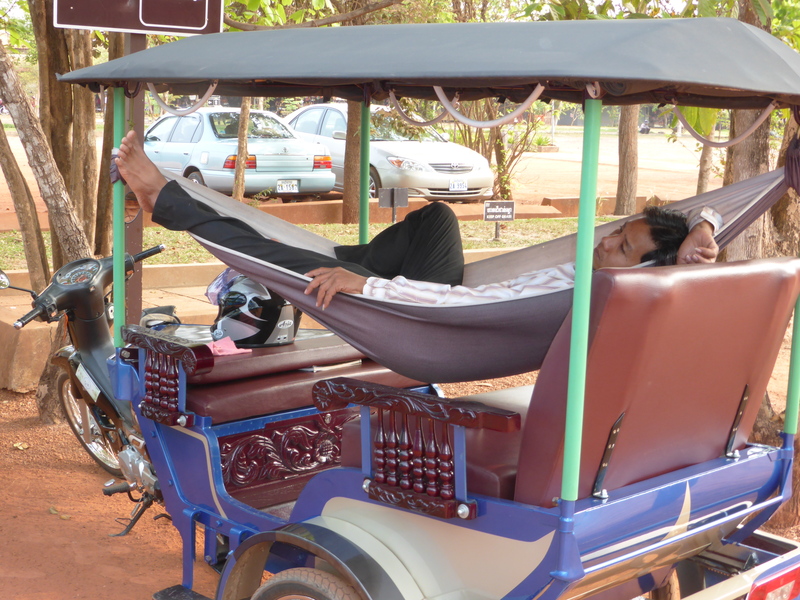 Our tuk tuk driver looks as knackered as us by the time we’re ready to traipse home. 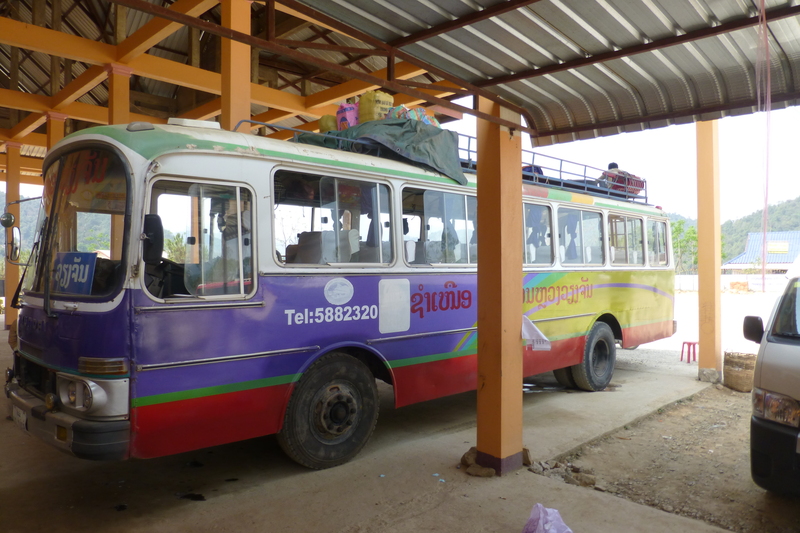 After another hugely entertaining bus journey, this time from Phonsavan (via Paksan) to Tha Khaek a burgeoning town on the east bank of the Mekong river. Its literal translation is ‘guest landing’, thought to be a nod to its original role as a stopping point on the river for foreign traders passing through with their wares. There are multiple selling points for this stunning beautiful central region of Laos, but it is also fair to say that there are two lead reasons that time-poor backpackers swing their rucksacks through this town. 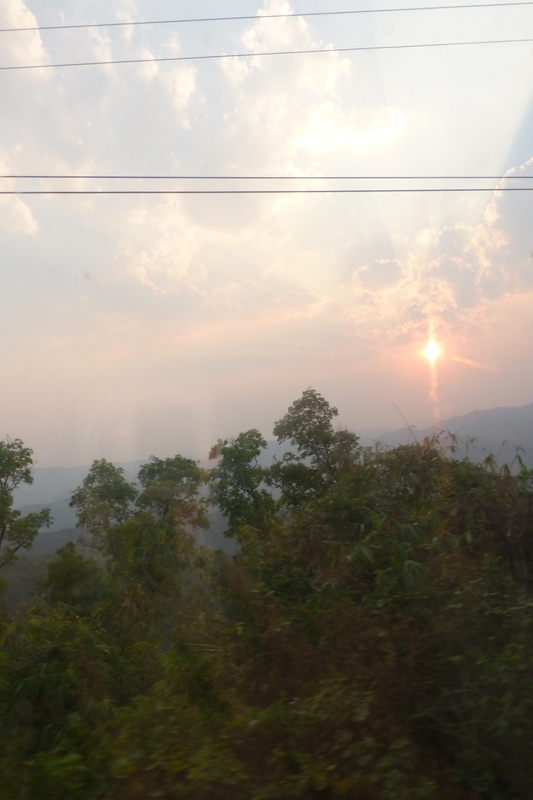 The first is to merrily motorcycle ‘The Loop’, a three day off road experience round a circuit of the more remote parts of Khammuan and Bolikhamsai provinces. 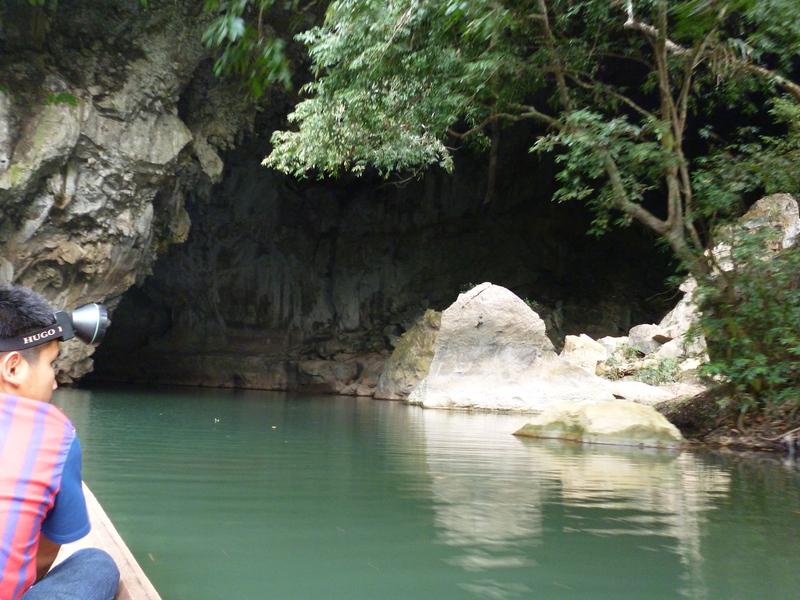 The second is to spend a day’s merry motorboating through Tham Kong Lo, a 7km long cave through a limestone mountain in the nearby Phu Hin Bun national park. 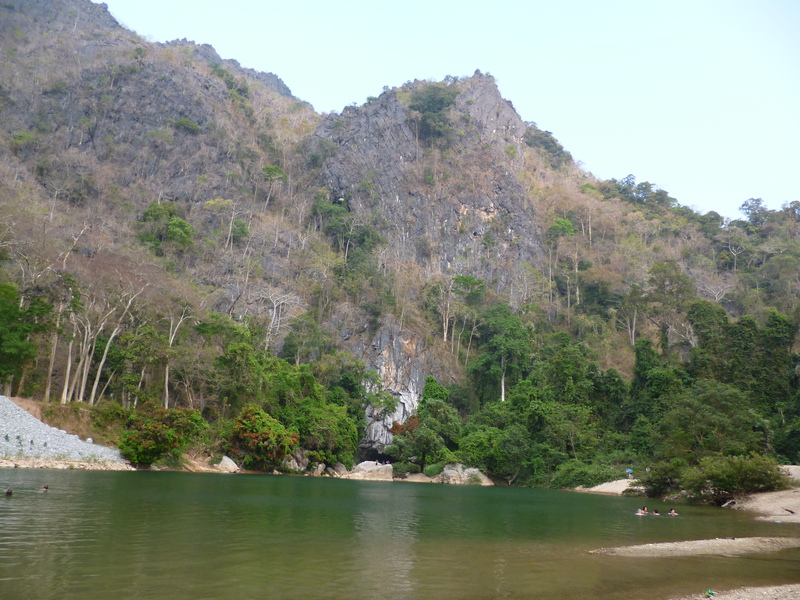 Unfortunately, I am one of those time-poor backpackers so it is Tham Kong Lo that draws me here to Tha Khaek. As we exit the bus, there are quite a few of us headed towards the most popular budget choice in the area, a hostel called The Travel Lodge. Our game driver packs up the heavily laden tuk tuk, and deposits us (two Swiss, two Americans, one English and the standard solus Scot) at the hostel. 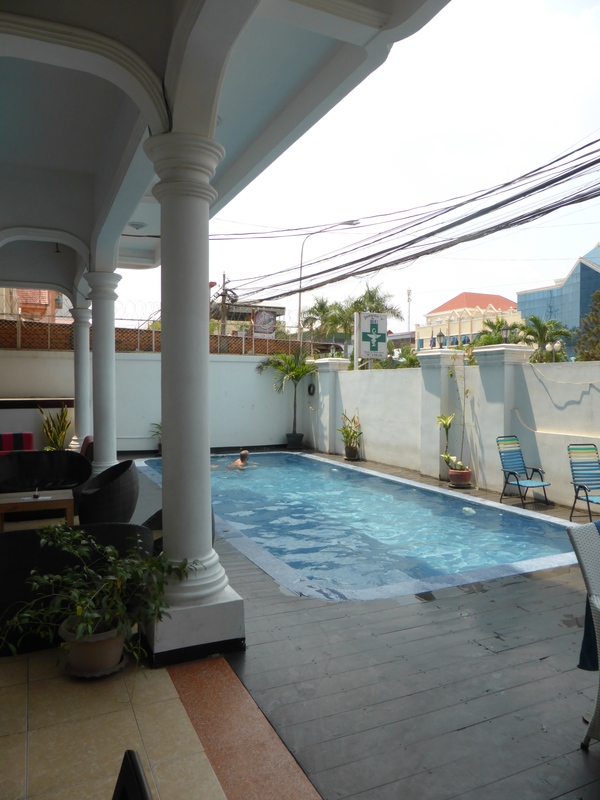 The Travel Lodge is to Laos hostels what, well, Travelodge is to UK hotels…basic, wildly overpriced for its standards and vaguely uncomfortable. Thankfully for me, nobody has a booking…and I watch politely as everyone else checks in to the available rooms. 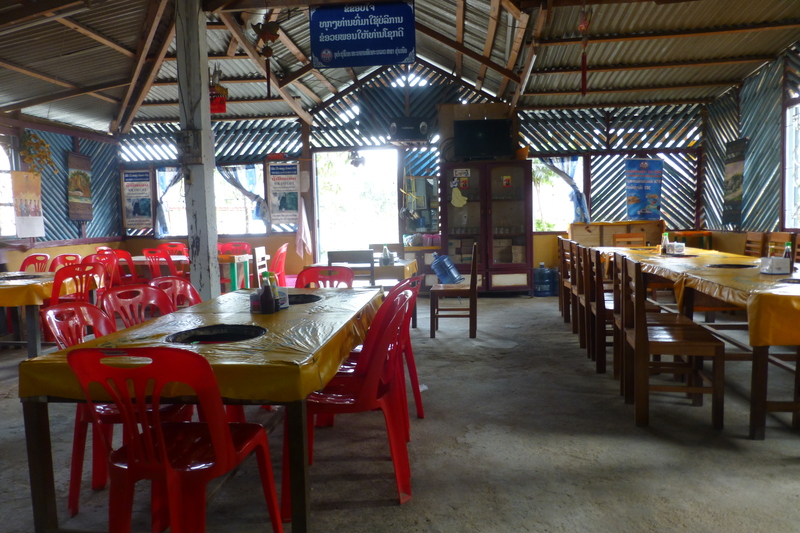 By the time myself and travel buddy Jackie get to the front…there is only one room in the Lodge rather than the hostel, which is finished to a significantly higher standard, ant free and positioned round a little courtyard about 100 metres along the pathway. It is still only 12 pounds like…but it feels like walking into Malmaison. Result. 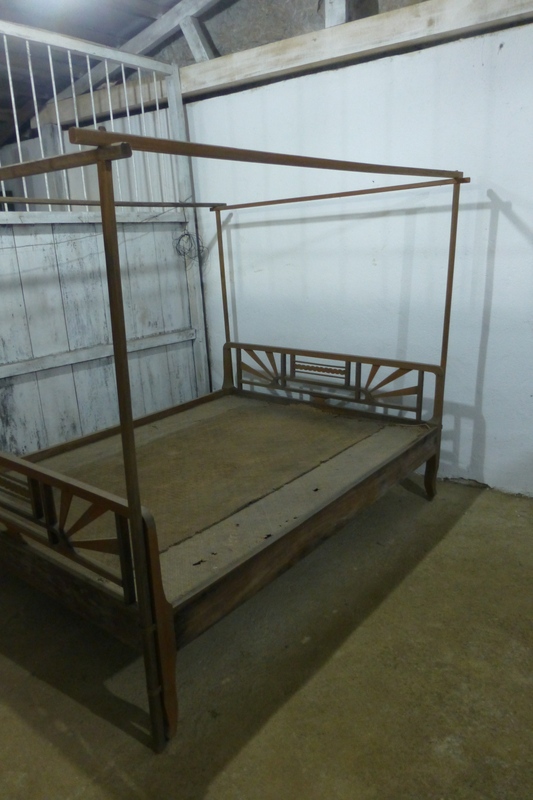 Having been poorly for a day or so back in Phonsavan, this is the (relative) luxury I have been craving. The next day, after a momentous sleep, we wave our compadres off on their dollar-a-day rented motorbikes to do ‘The Loop’, equipped with minimal safety features and maximal smiles. I’ll admit to a sharp pang of jealousy and a subsequent internal vow to return one day with ‘The Loop’ in my sights. For now, it’s time to explore the small, sleepily relaxed town. 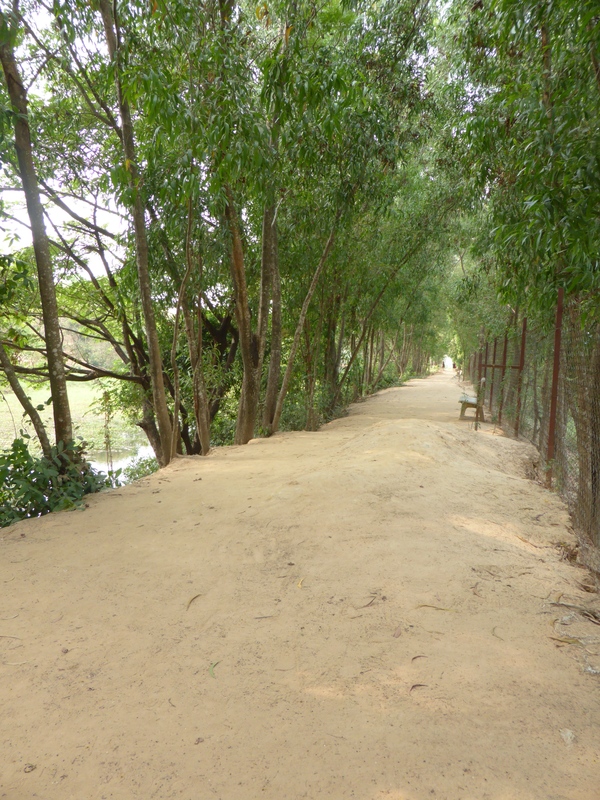 Franco-Chinese architecture and tall trees line the streets all the way to the riverside, its natural centre, which is a pleasant 1.5km walk from the hostel. 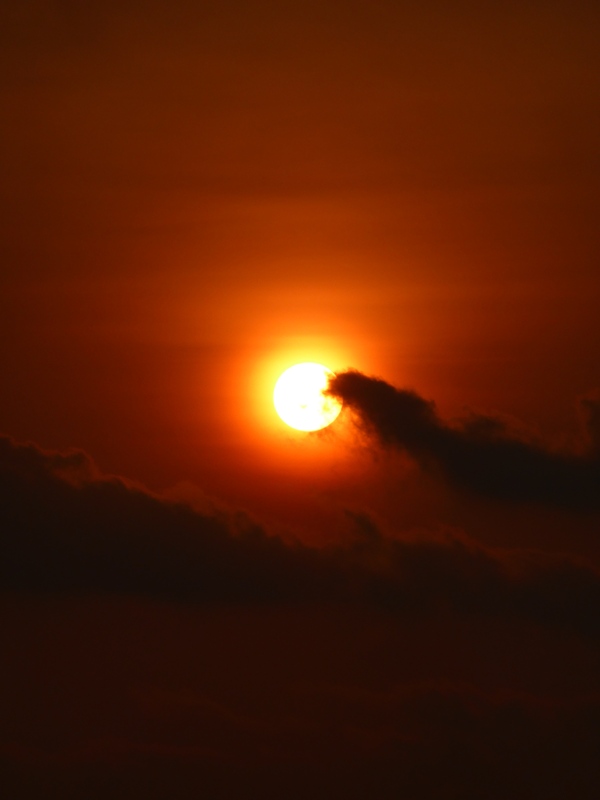 Again, the sun here disappears into the haze before it hits the horizon. Yet it is still a sight beautiful enough to stop the locals in their tracks. 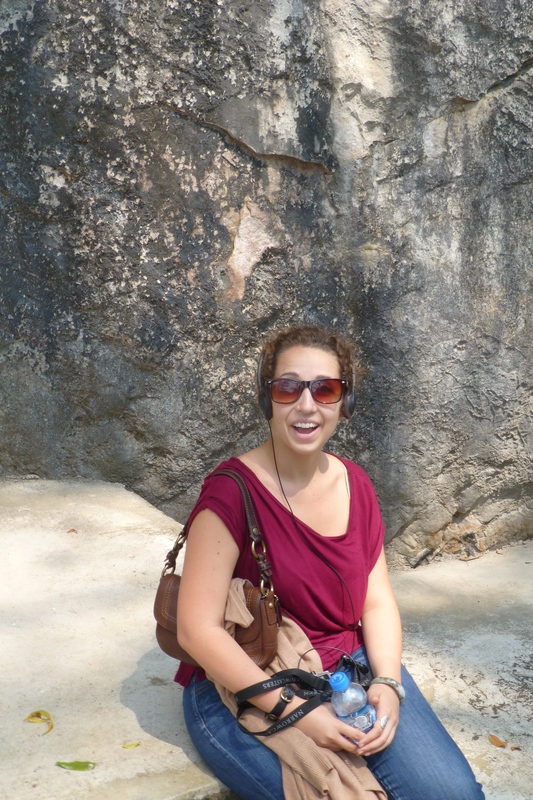 We bump into two travel pals from the bus, Spanish Berna and French Audrey who teach English in Beijing, and settle into Inthira for a beef and cashew stir fry with sticky rice. We tried for a sundowner by the river, but approximately 6,000 large river flies had the same idea so we escaped inland. It is here where our story saddens. 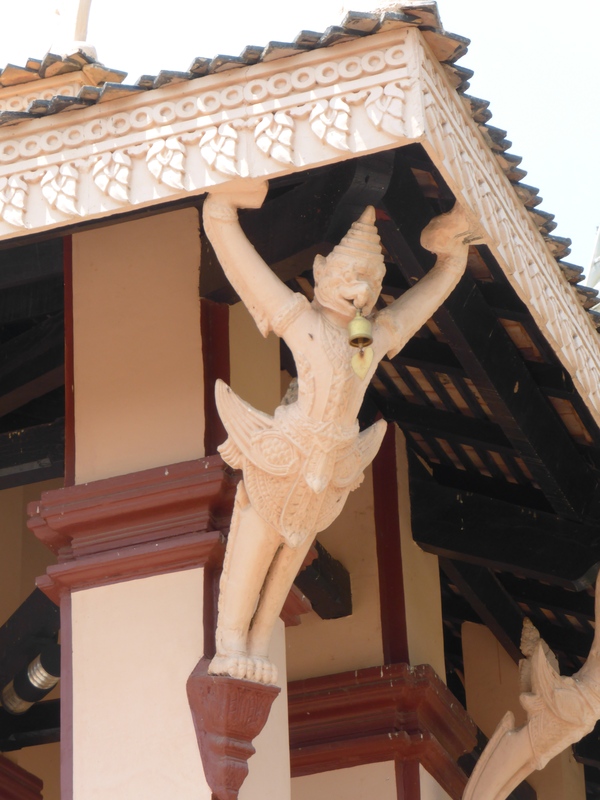 Fans of Same Small World (both of you) will know that I’ve never had the greatest luck with cameras whilst travelling. My blog post from the stunning Galapagos Islands was cut short by the introduction of an impertinent wave to my unsuspecting camera. 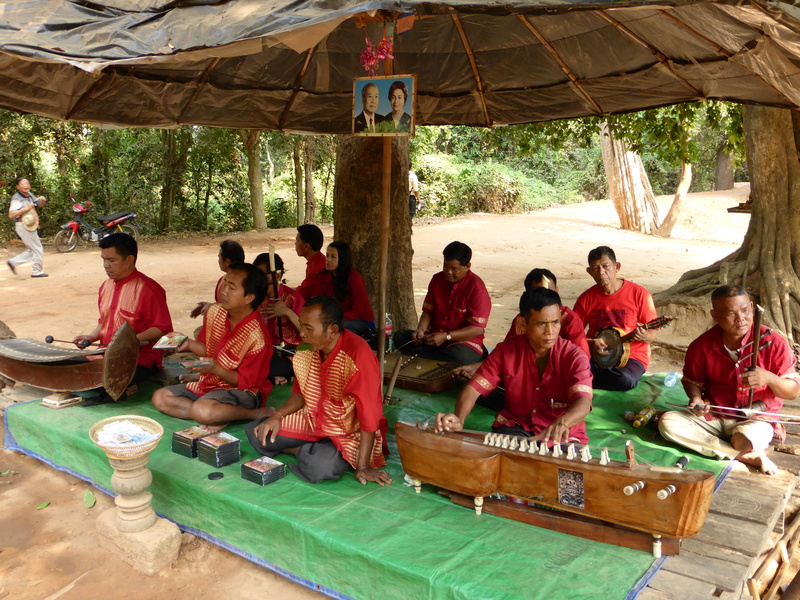 This time, here in Laos, the unfortunate meeting was between a large pothole in a Tha Khaek road and the wheel of the tuk tuk ferrying us home. 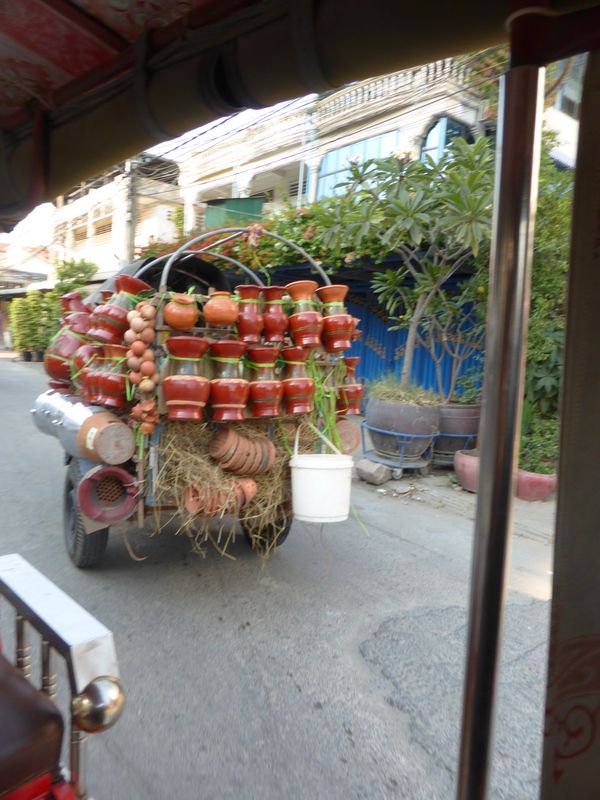 It set off a chain of events including my open bag being airborne for less than a second, choosing to execute a mid-air spin and landing indelicately, contents first, on the floor of the tuk tuk. The camera doesn’t make it through the night, and I contemplate the onerous thought of a dearth of beautiful images to reflect on after this trip. The next day, Jackie and I head out to Tham Kong Lo with Brit brothers Sam and Harry and students Shoya and Maren from Japan and Germany respectively. Lucky for me, Maren is something of a photography whizz and kindly offers to share her shots with me. So you can thank her for the following contributions. 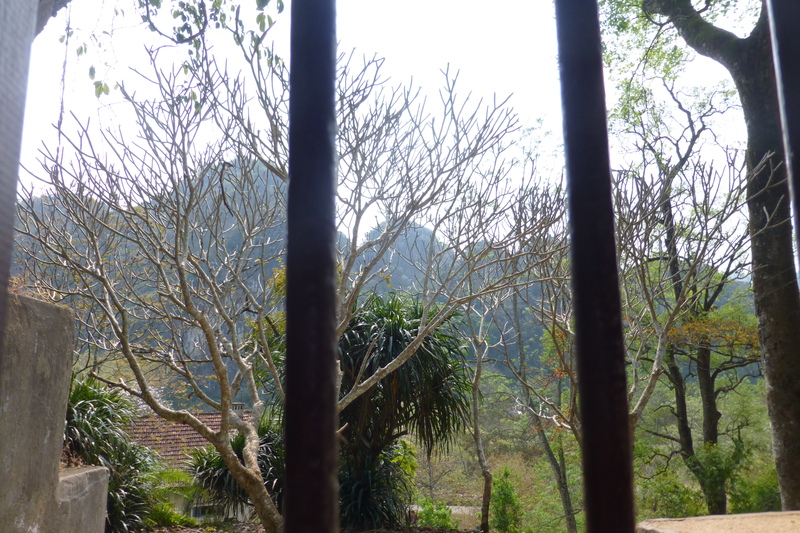 Having spent many an hour staring out the window at the Laos scenery, the sights which await us en route to the cave are the standard to which we’ve become accustomed. Gothic mountains darkly preside over verdant landscapes below. 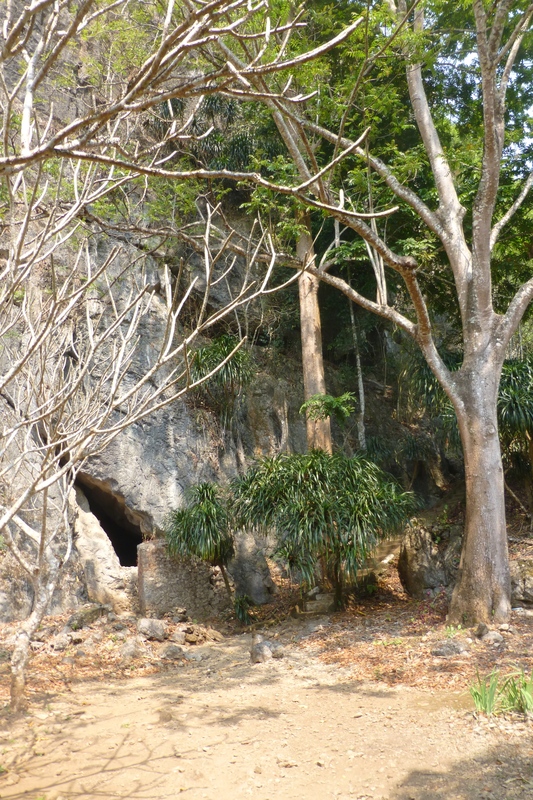 But when we reach the monolithic mountain that hides the cave itself, a beauty not yet seen starts to reveal itself. 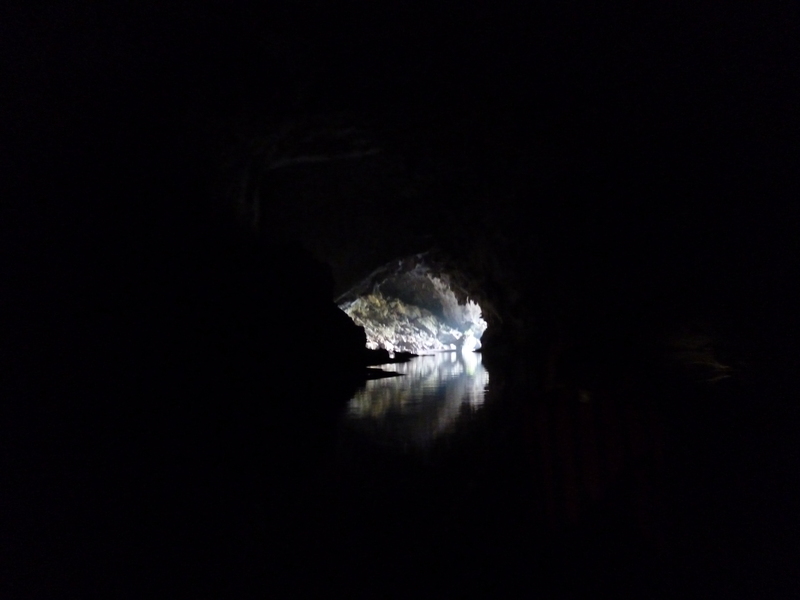 We’re kitted out with headlamps and wisely relieved of electronic devices, then we meander through the rock paths to the mouth of the cave. 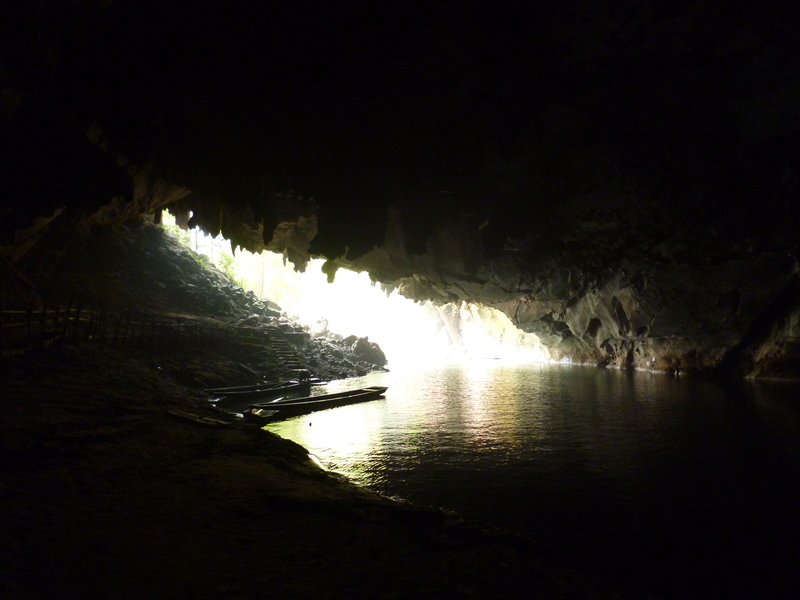 With boatmen at the top and tail of out motorised longboats, we set off into the cave which is 7km long and up to 100 metres at its widest point. 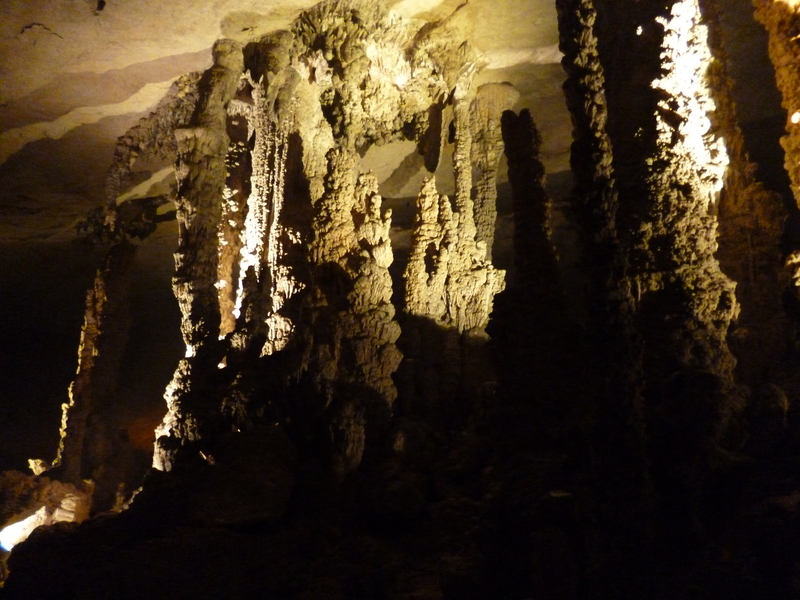 Its a natural wonder which meanders nonchalantly through the karst limestone mountain, its vastness revealing glittering stalagmites and veiny walls. 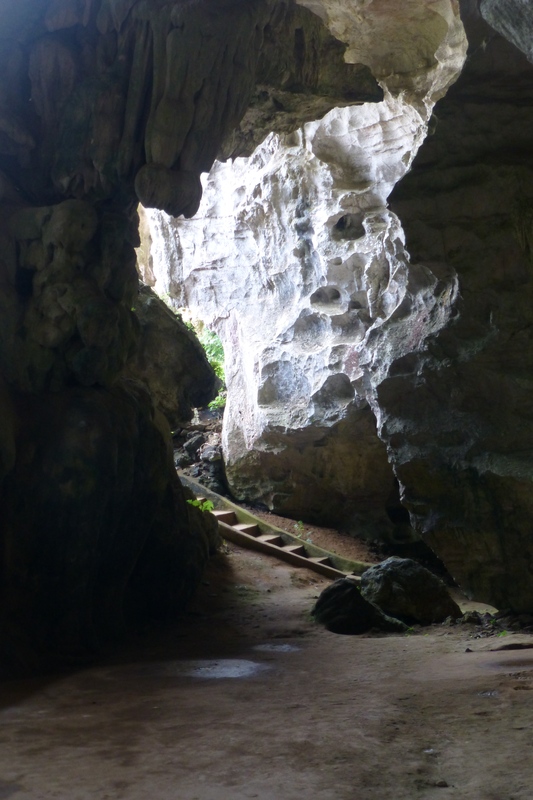 There are several lighting projects within the cave, mostly funded by New Zealand according to the signage. But much of it naturally attacks the senses, low lighting adding to the majesty and curved stonework which sonically turns our engine into a chopper at fleeting points. 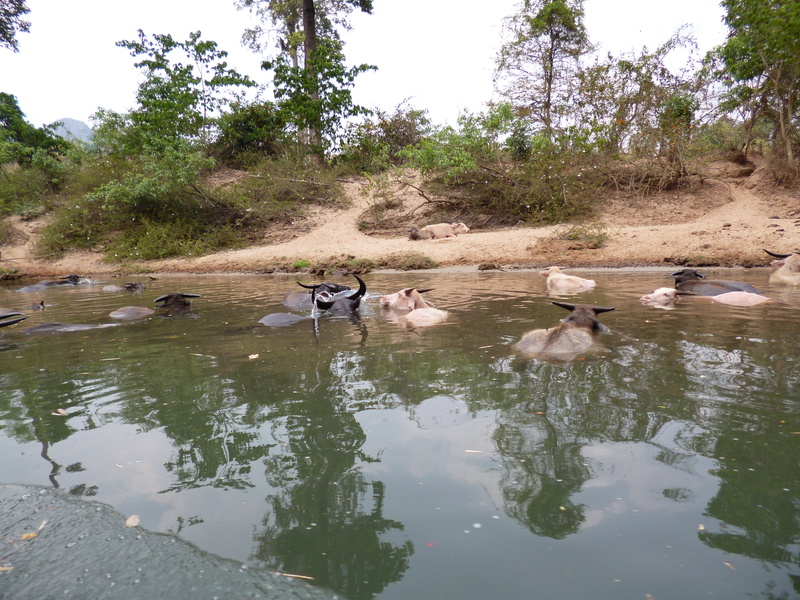 We alight at various points for further investigation or to outfox the water, especially at the effusive Muang Houng rapids. 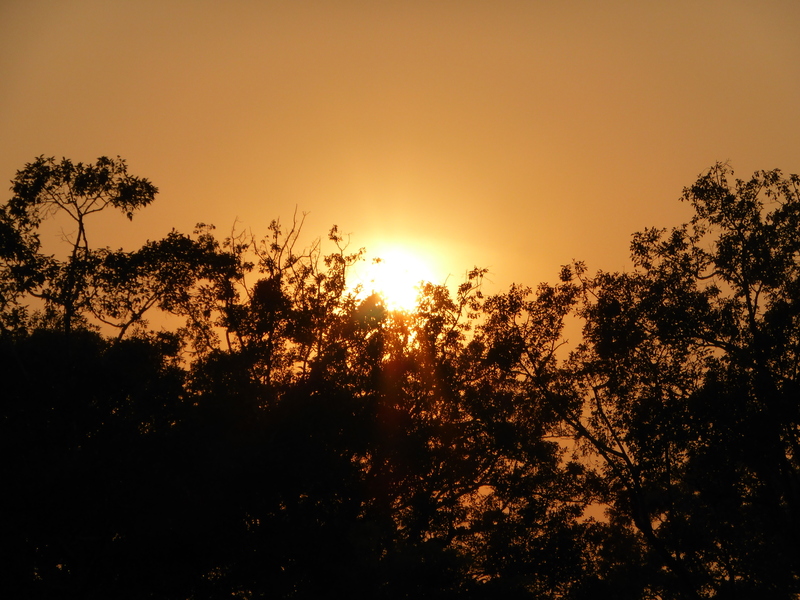 Slowly, we start to emerge into the sun. 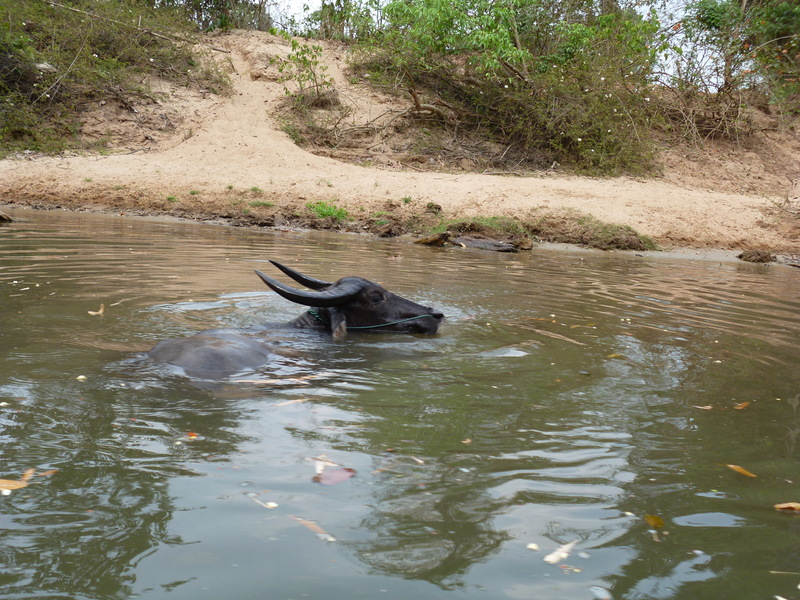 We’re greeted by bathing water buffalo. 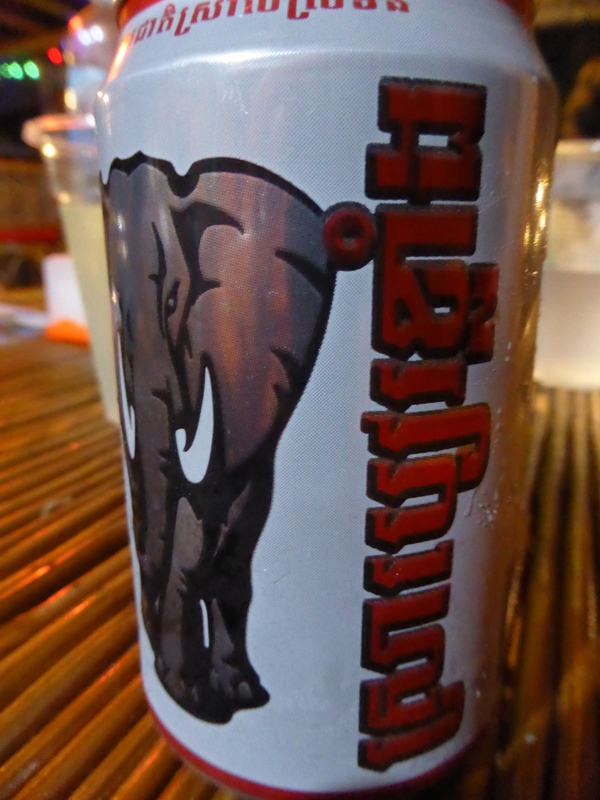 There is time for a swift Beerlao on the riverbank before we volte-face and take the return leg of the 90 minute journey. 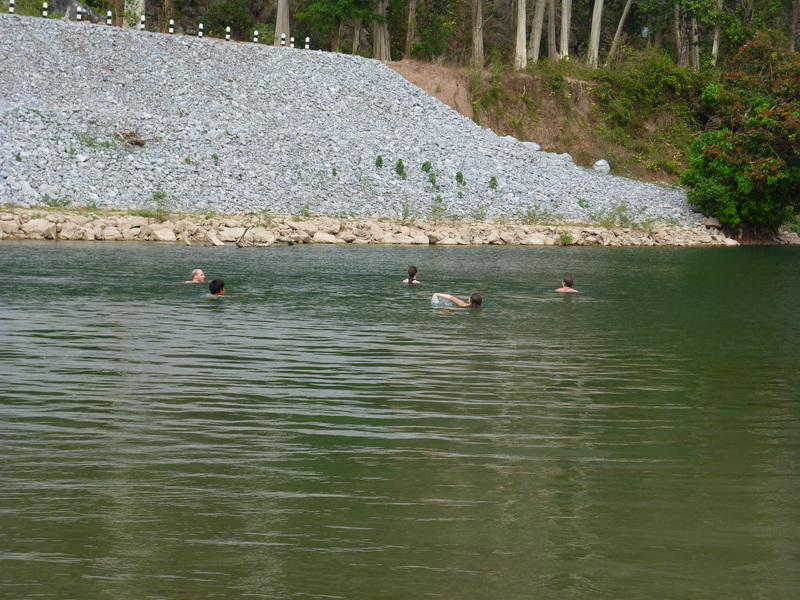 We all cool down with a dip in the clear pool at the base of the cliff, before snoozing all the way home. Starved after all of the excitement, we pile out to the riverside and spot a nameless but bustling Thai restaurant just around the corner from Inthira. It is utterly ace, take a left exiting Inthira then the first left and it is four doors up. 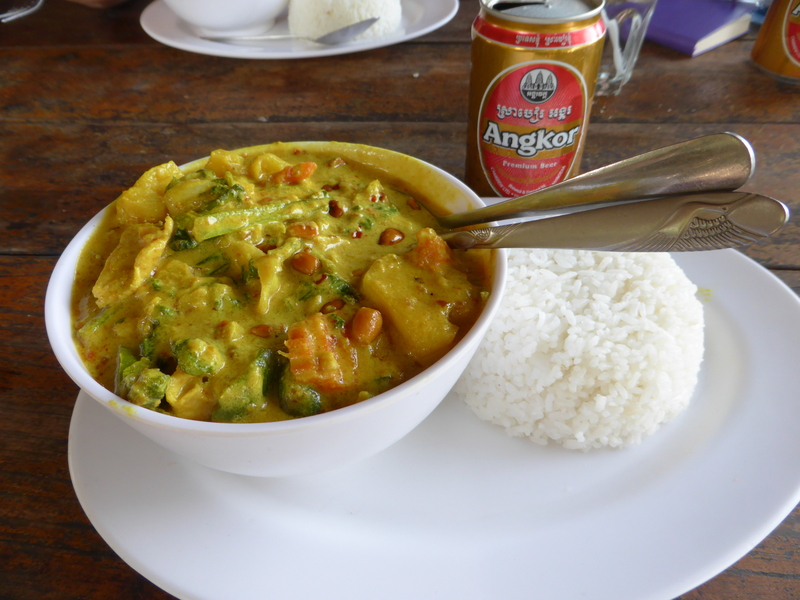 Green curry, sticky rice and Beerlao cap off a very respectable day of misadventuring. 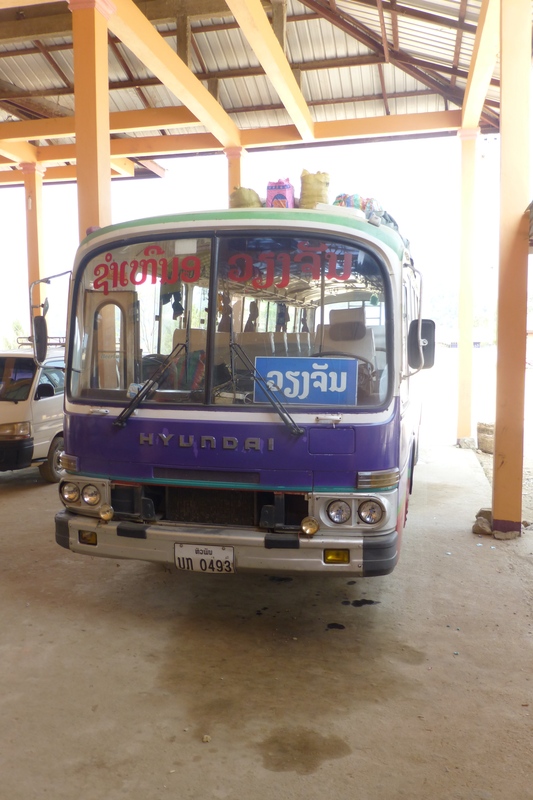 Here in Tha Khaek, it’s time to bid Jackie farewell as she travels onwards to Vietnam and I catch another bus to Pakse then (four hour) tuk tuk to Ban Nakasang on the banks of the Mekong. 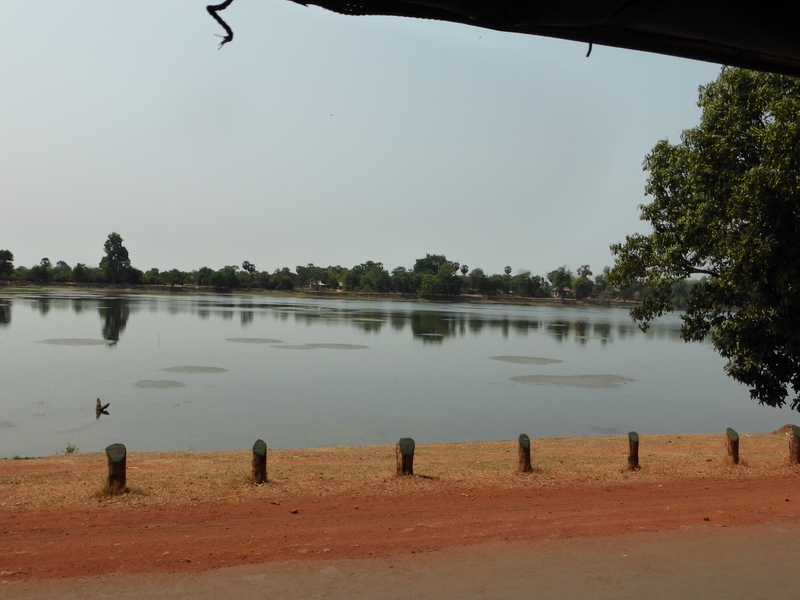 Here nestles Si Phan Don (Four Thousand Islands) just a hop, skip and a jump from the Cambodian border. It’s a long and laborious journey on a dusty road. When we arrive at the shanty port town under cover of darkness, it is closed and there are no scheduled boats. 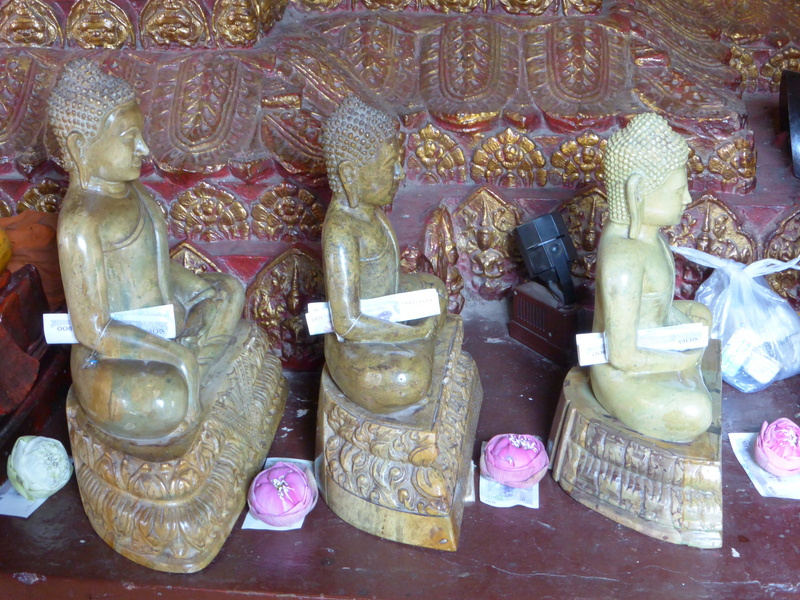 Of course, everything in Laos is available for a price. 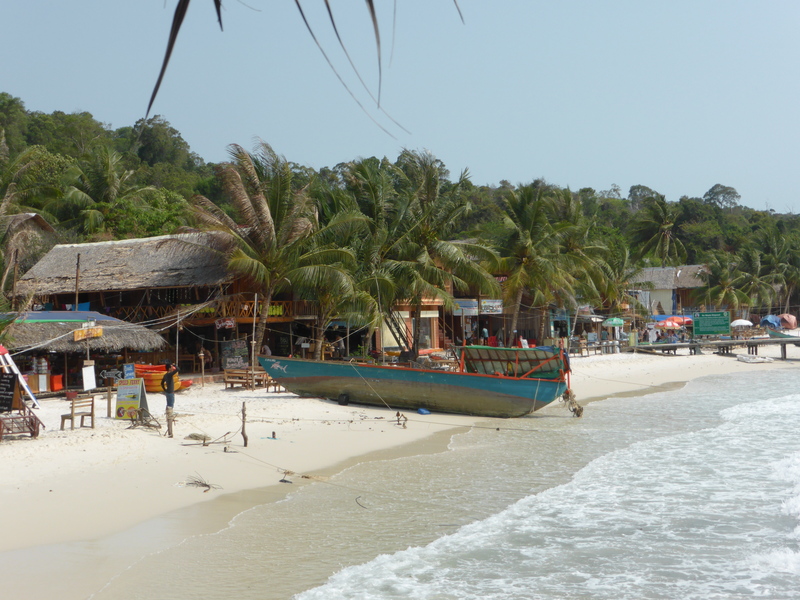 Before long the tuk tuk driver is hollering through the window of a house calling out a boatman to take us the twenty minute scoot across to Don Det. 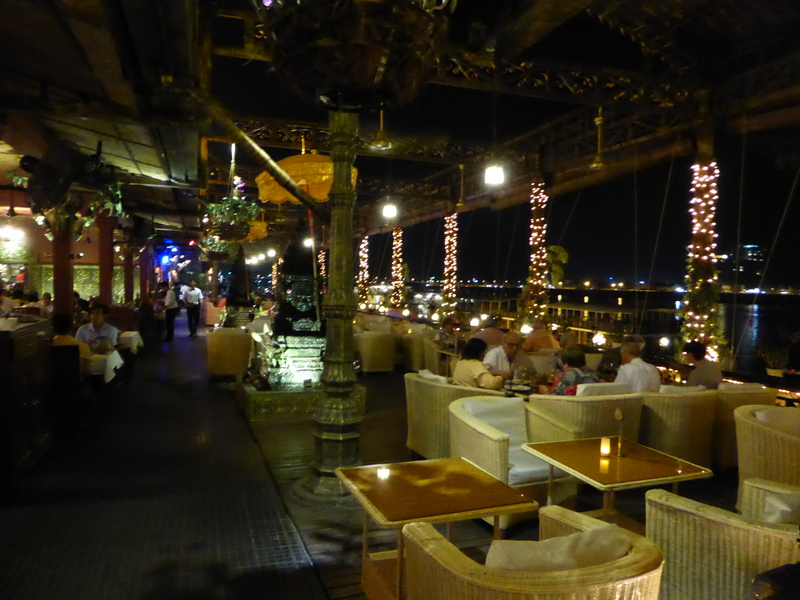 We glide noiselessly across the Mekong under the pale moon light – it was a pretty special way to arrive. Before long I’m checked into Little Eden on the Northern tip of the island and sound asleep having suffered my last bus journey on this side of the border. 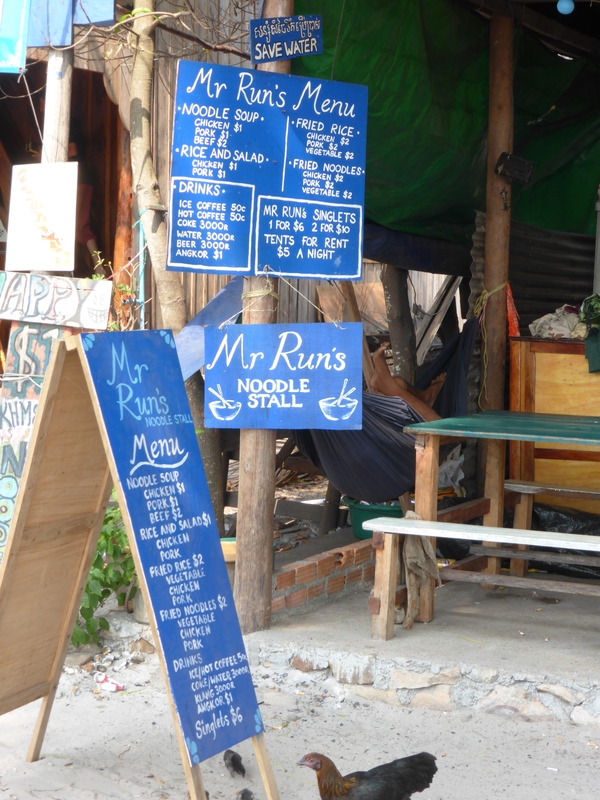 Whilst there is much to explore in and around the islands, two of the favoured pastimes by backpackers here are floating down the Mekong in a rubber ring and enjoying pizzas and milkshakes with ‘happy’ added as a precursor. Contrary to popular belief, this is not because Pharrell Williams wrote his critically acclaimed chart-topping and mind-numbing hit here, but instead denotes the addition of cannabis. Many backpackers do these activities together, creating the kind of sunburn that only an utter imbecile would inflict on themselves. The unfortunate by-product of this, is that there ain’t much authentic about this paradise. 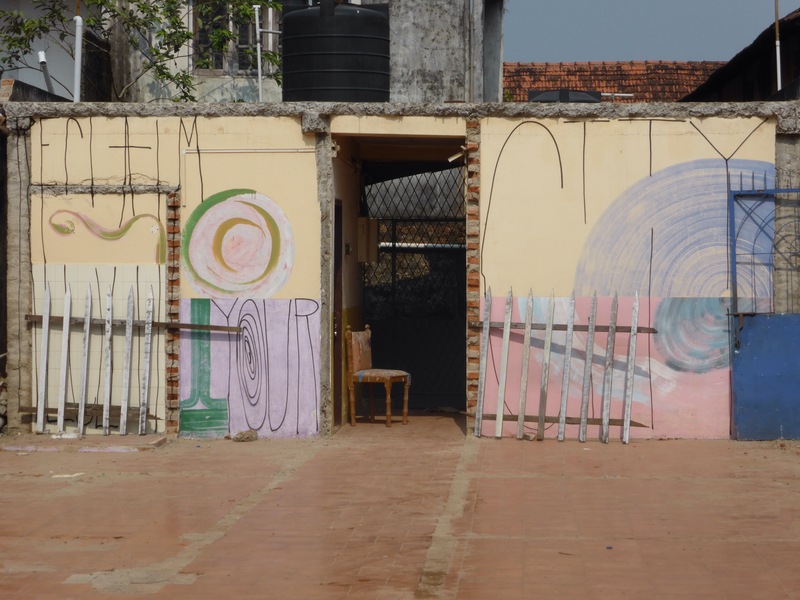 You’ll be lucky to find a word written in Laos or a two yard walk where you won’t be touted at. It becomes abundantly clear that one man runs almost every business on the island, from bike rental to stoner cinema and everything in between. 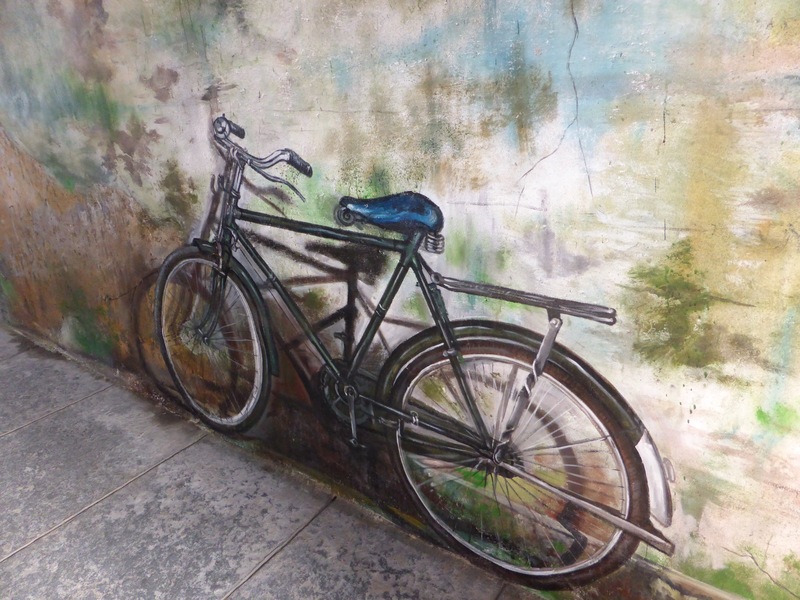 Cannabis has never been my drug (I’m much more of an Ayahuasca girl…) But thankfully, there is plenty to see if you hire a bike for the day from Mr Mo’s and head on over to neighbouring Don Khon. Cycle down Sunrise Street (one of two only roads, both pedestrian, the other predictably named Sunset Street) until you hit the bridge on the left, for which you’ll need to pay for crossing but the fee includes entry to the Khon Phapheng waterfalls to the south of Don Khon. After a hot hour-long cycle down a road named Rocky Shadeless Road (I jest ye not) you loop round to the falls which are just about the most aggressive I have ever seen. I take shelter in the wooden mushroom huts set out over the water, called the Oasis, and read to the thunderous beat of the water before cycling back to base. The views have been really wondrous, but I can take or leave the ‘spring break’ vibe. 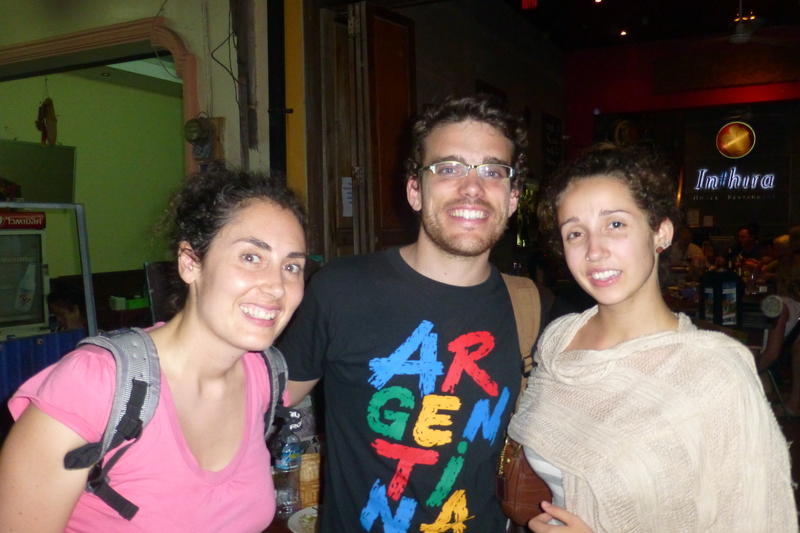 I fall in with Lasse, a German backpacker, just about the only other voice of sanity on the island. Together we hit the culinary high notes of Don Det including the ridiculously tasty Pumpkin Burger at Mr B’s Sunset View (not to mention their stunning Lao Mojitos), and find ourselves to be ‘happy’ enough with the milkshakes. The next stage of my journey sees me steer a little further from the well worn backpacker track. 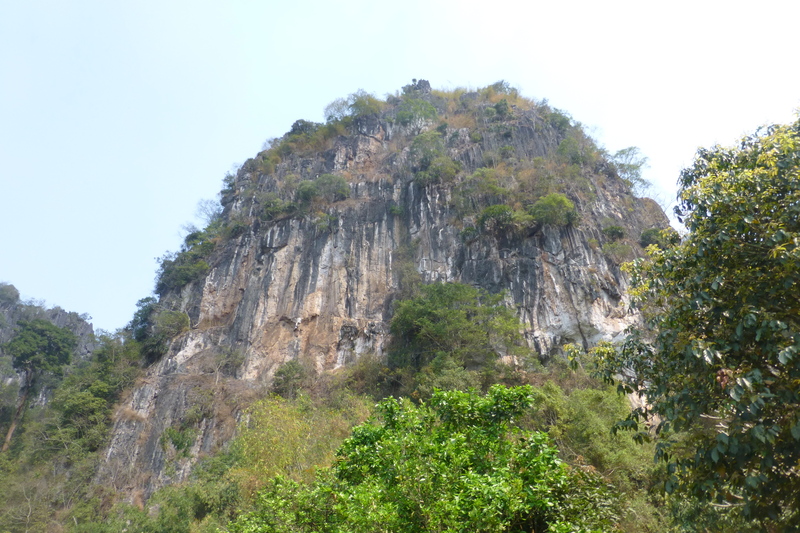 Drawn by the lure of Vieng Xai’s caves in the far northeast of landlocked Laos, I’m headed to it’s nearest neighbour Xam Neua which is a mere fourteen hour bus trip from former royal capital Luang Prabang. 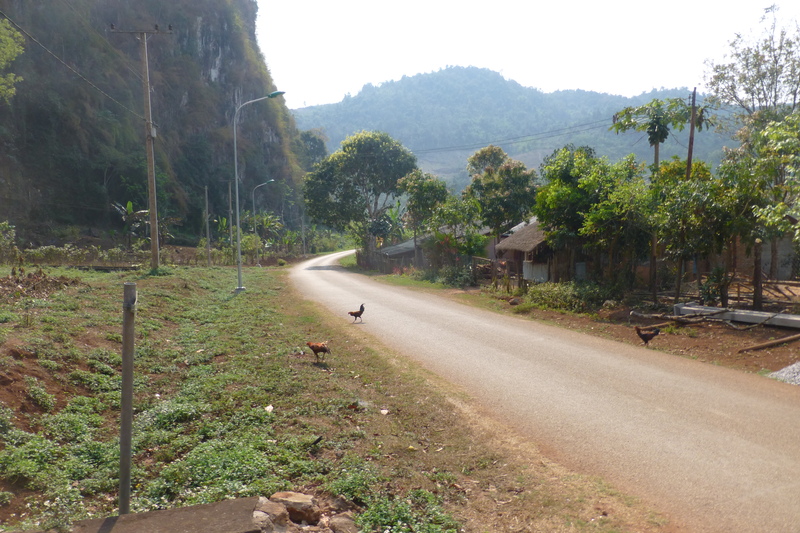 The journey is a variation on a theme which is emblematic of my time in Laos thus far. The decrepit old bus crawls along the mountain roads at a gruelling 40 mph. Hairpin bends punctuate our ascent sending me bouncing left and right sharply on my seat. It’s all too much for the locals in places, and the conductor hands out plastic bags for travel sickness which are promptly filled and thrown out of the window into the cavernous verdant woodland below us. The landscape is utterly beautiful here, but at each turn a glance down into the ravine is rewarded with the deposited loads of garbage trucks below. 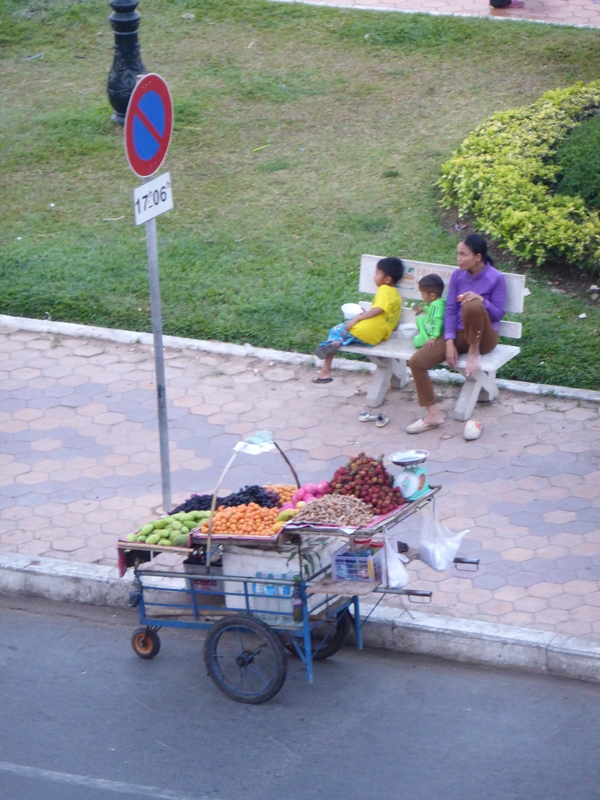 There isn’t an infrastructure in place that can cope with the country’s waste due to pockets of extreme poverty in Laos. Clearly there are higher priorities for local funds. But it does make me so sad to think that education of responsible waste is so non-existent that it is ruining the country’s rugged natural beauty – the very rugged beauty that brings so many travellers and their much needed dollars here. Another shock to the system are the toilet stops, my options are either a) don’t go to the toilet or b) use the roadside. I don’t fancy applying the ‘when in Rome’ mantra here and circumvent the issue by near dehydration. We do however stop for food; me and my travel buddy Jackie (who has joined me for this leg of the trip after our hang time in Luang Prabang) buy bags of sticky rice to keep us going on the last leg. The lowlights were plentiful but the highlight was the drive over the bridge at Nong Khiaw in the Muang Ngoi district where you have the chance to gasp at the languid Nam Ou river below. 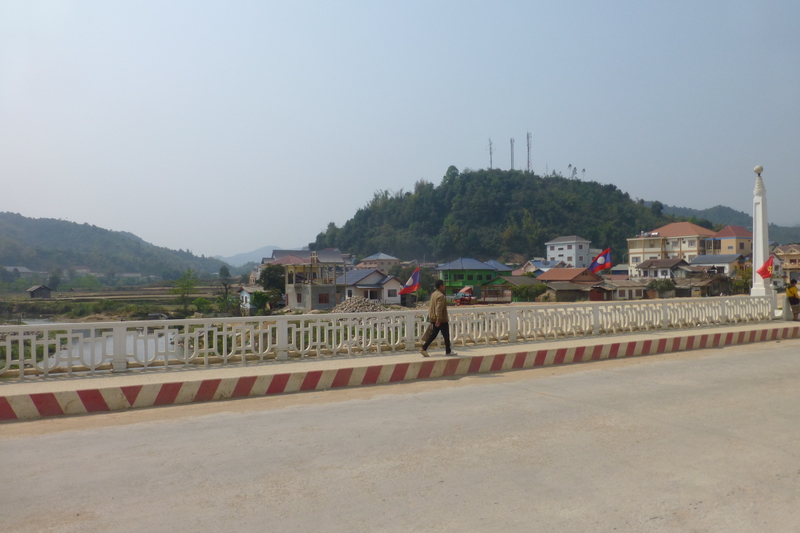 We venture out into the town foraging for breakfast the next morning, and find a very pretty industrious town set against yet more of those eye-catching karst limestone mountains. 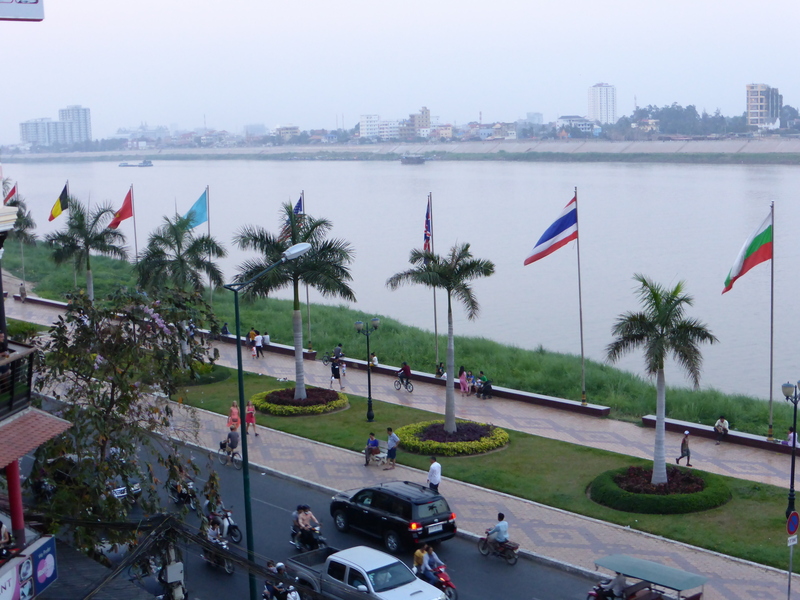 It feels like it is probably the laborious journey to get here that makes it Laos’s least-visited provincial capital. It’s a logical transit point for Vieng Xai, and the very reason that we have ventured here so we hop in a tuk tuk (this one complete with souped up stereo) for the 60 minute journey. The area here is truly fascinating, but as much for what we can’t see as what we can. 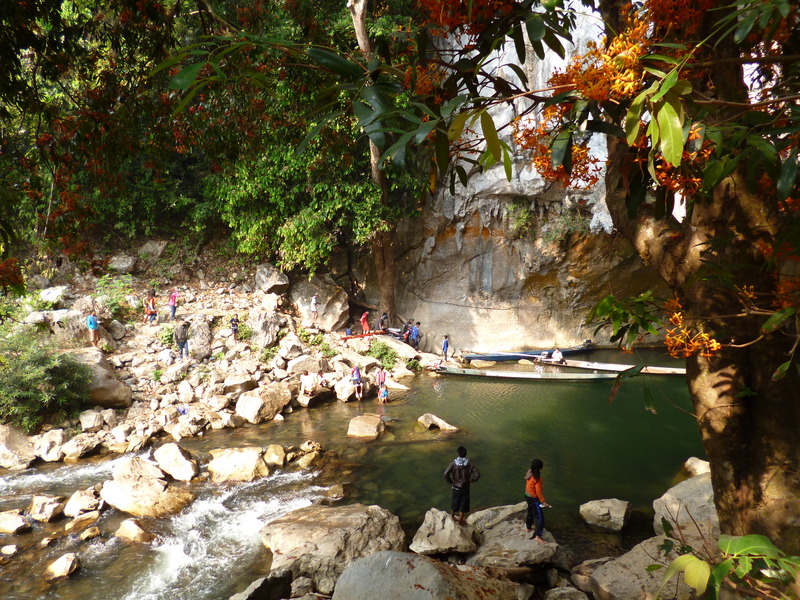 The mountains hold the secrets of a vast network of caves to which nationalist movement the Lao Patriotic Front, eventually known as the Pathet Lao, fled in 1964 to shelter from the bombs that were falling on Laos. Global politics changed dramatically after the second world war, and were broadly defined by anti-colonialism and the Cold War. 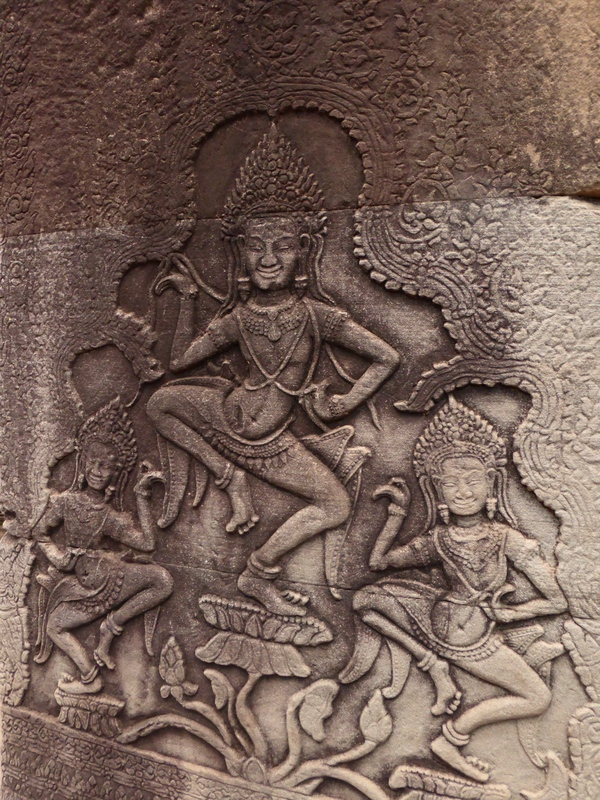 Both of these ideologies had their own profound effect on Laos. 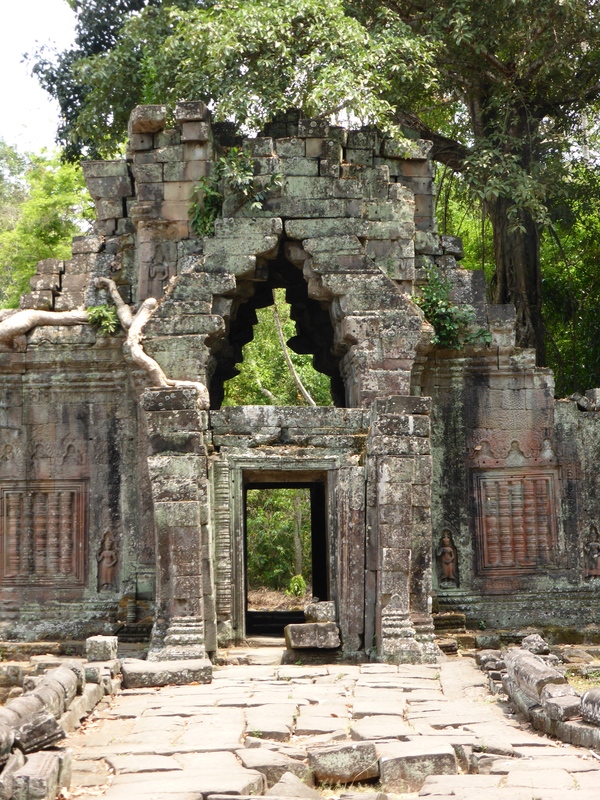 It was formerly part of French Indochina, a colonial empire since 1893, along with nearby neighbours Vietnam and Cambodia. When that was formally disbanded in 1954, many political activists in the country began a movement toward independence. The US feared that communist governments would add weight to the Soviet Union, their already formidable Cold War opponent. 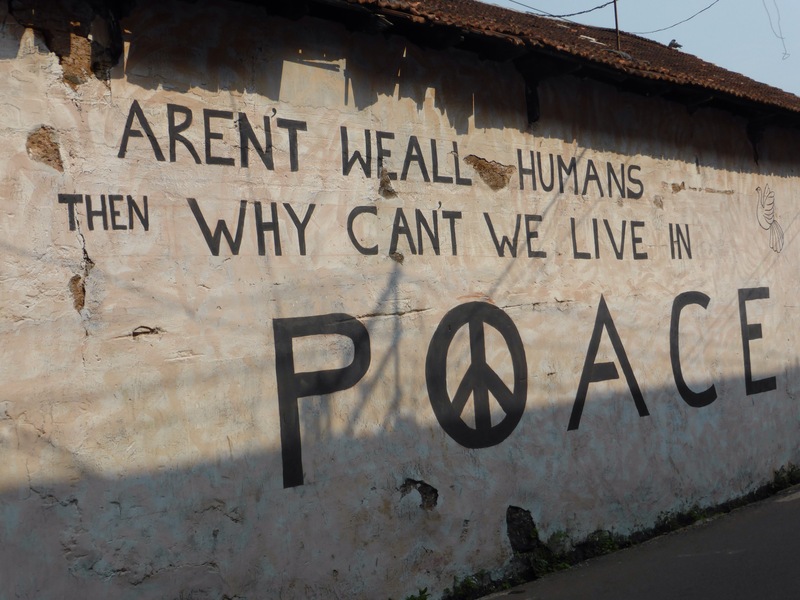 This was evidenced by the much publicised war they were waging in Vietnam. So, they started investing heavily in Laos and tried to write its role as that of a buffer between communist northern Vietnam and the rest of the region in South East Asia. To that end, they did everything from basing fighter planes there to undermining local elections. At this time, Laos’s population was a meagre 1 million, predominantly farmers living in regions of the country that US money never reached. The corruption witnessed gave strength to the independence movement as they realised that they were no longer masters of their own destiny. 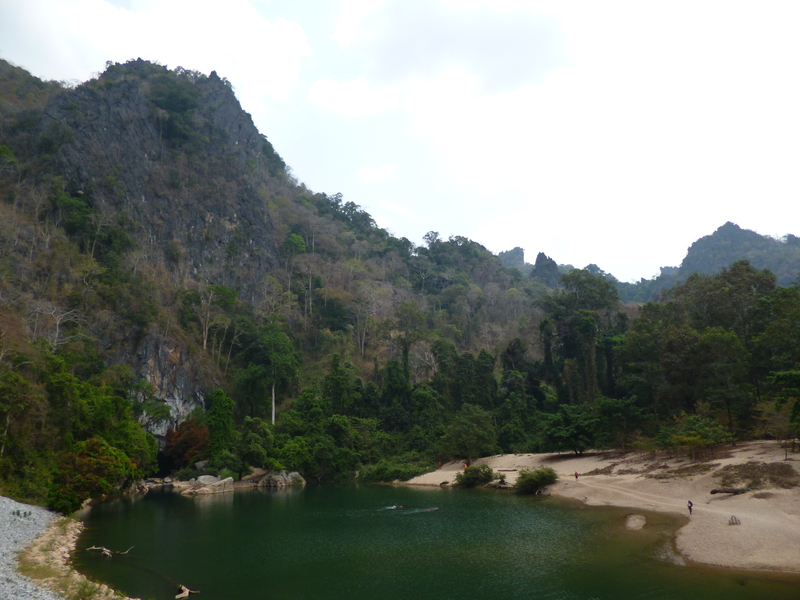 Laos became an unfortunate victim of its own geography, and of the US’s paranoia, and a much more ‘secret war’ was fought for its control with the nationalist movement having to flee to these caves in the Vieng Xai province to protect themselves from the US bombings. For 9 years, this was the command centre for the resistance and thousands based themselves here, from where they ran their operation. 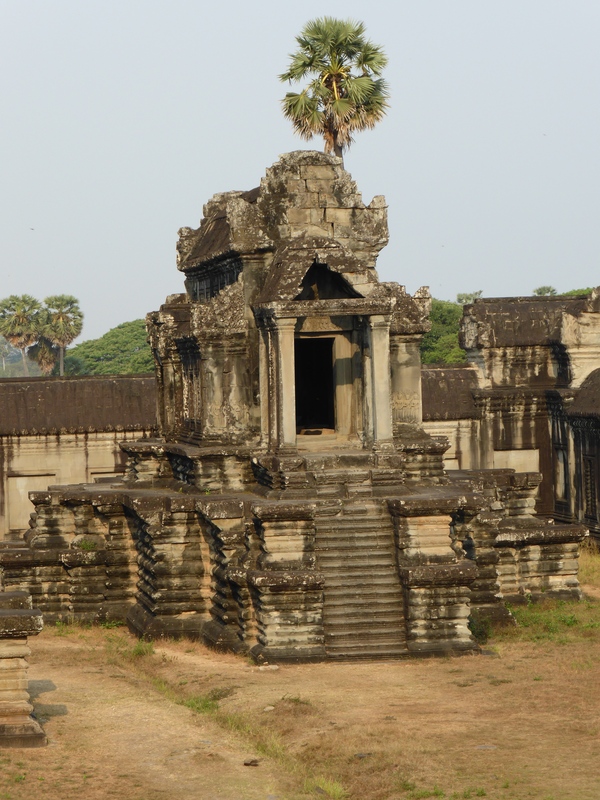 It was at this time that Laos picked up the dubious and since unmatched accolade of becoming the most bombed nation in history. I don’t think there could be a sadder or more surprising statistic. 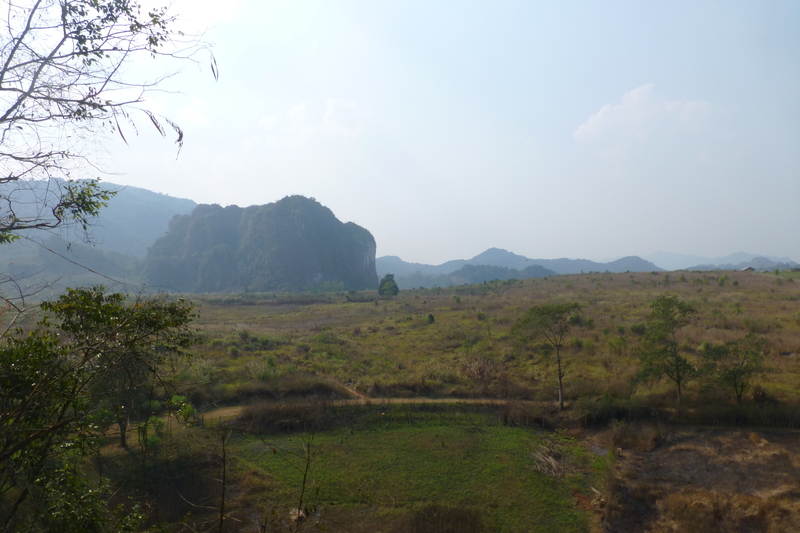 From 1964 until 1973, over 2 million tons of bombs were dropped on Laos. That’s two tons per person and at a cost to the US of $2 million dollars per day. A full head count of the dead could never be done due to the remoteness of the area and its weakened infrastructure, however 3,500 villages were destroyed and hundreds of thousands were forced to flee their homes. 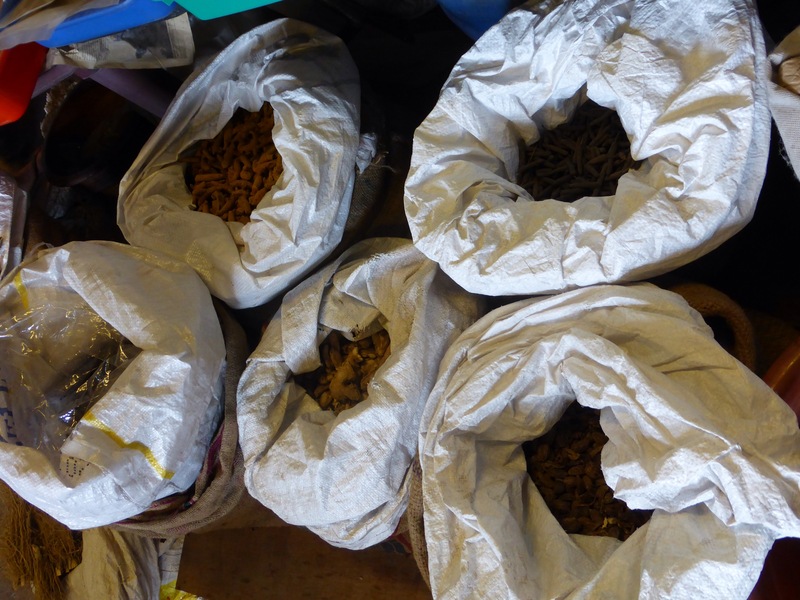 Even now in 2014, this most unwelcome legacy continues to affect everyone in the country with unexploded ordnance (UXO) a real issue in the northern region. 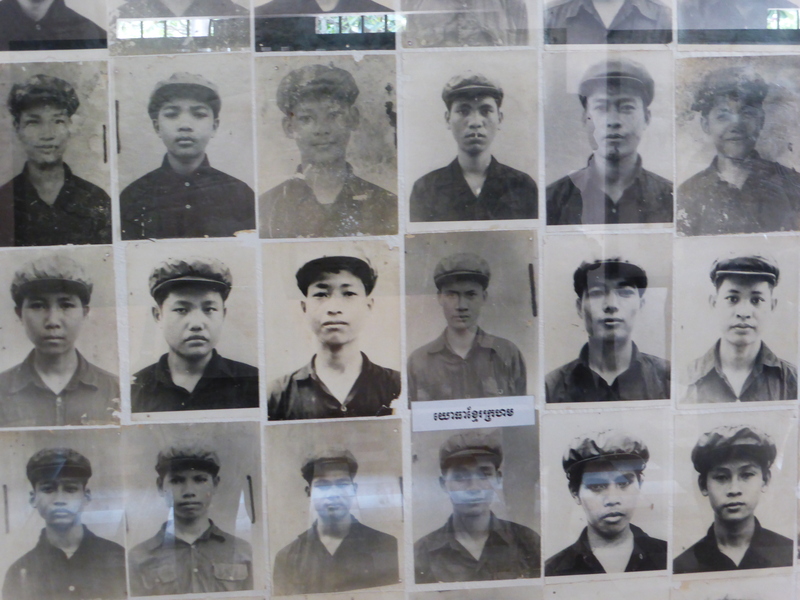 Having been schooled in a western democracy, unsurprisingly I was never taught too much about the Second Indochina War, aka ‘Nam, the one that many would like to forget. So the scenes brought to life here by the wonderful Narrow Casters audio guide are news to me. 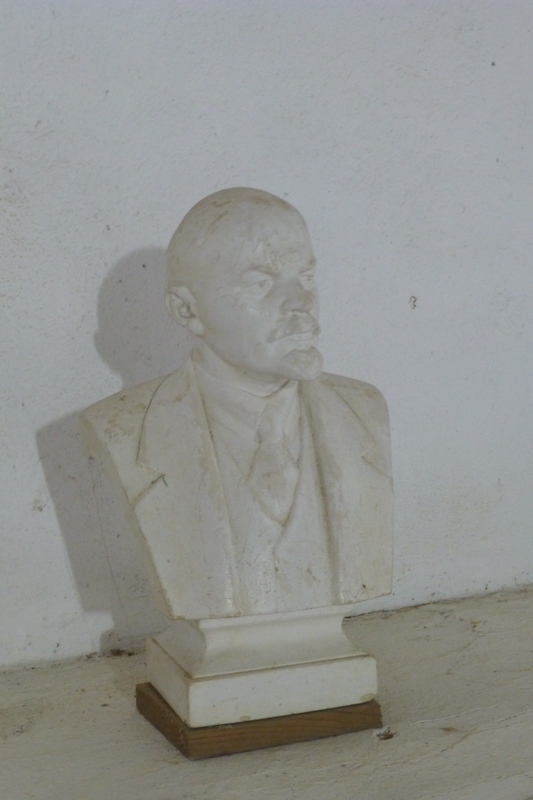 …complete with original political paraphernalia. All are linked by passages just like the one above, with stunning views out over the forest. 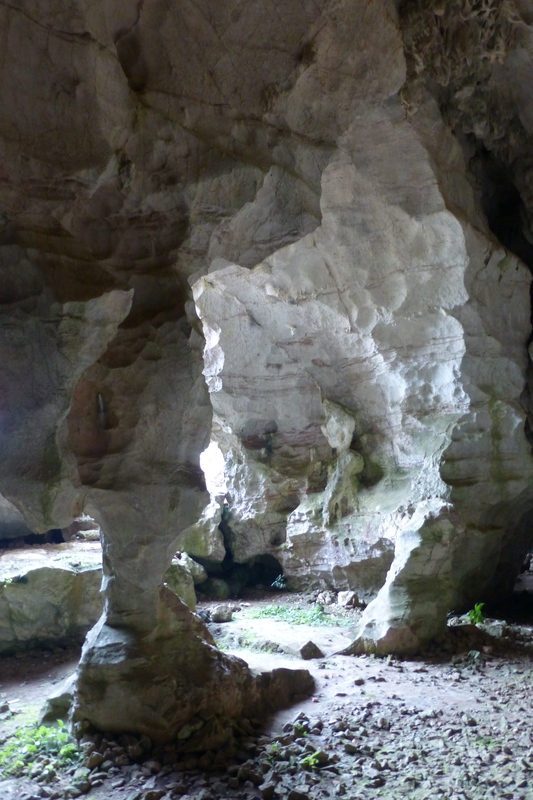 Whilst you might feel exposed inside the caves, the outside reveals just how invisible you are once inside. President Phomvihane was born in 1920 to a civil servant father and a farmer mother. 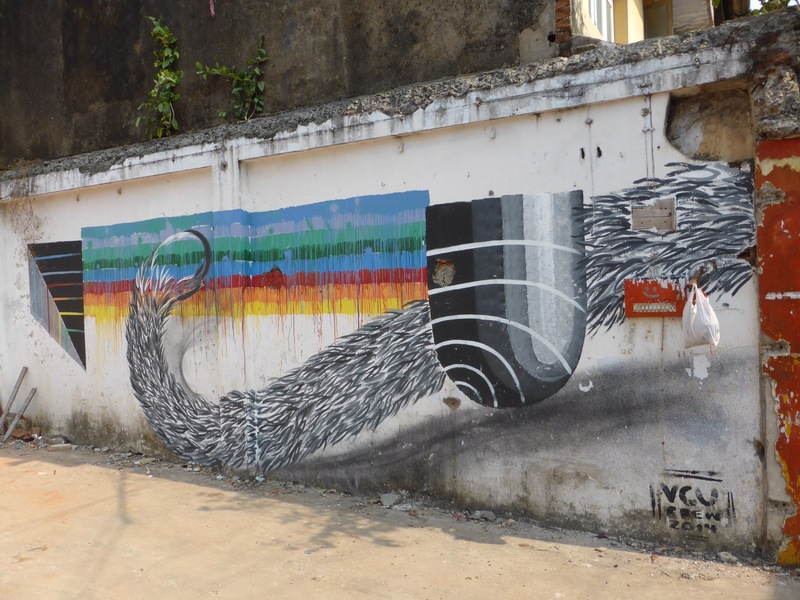 He studied at the University of Hanoi in Vietnam, which became a meeting place for like minded political activists. He was a very well educated man, speaking many languages including English, Vietnamese, French and Russian, and he brought his political ideals for an independent state back to Laos founding the Lao People’s Party in 1955, who would later come to be known as the Lao People’s Revolutionary Party. They were to be at the core of the movement for over 20 years. 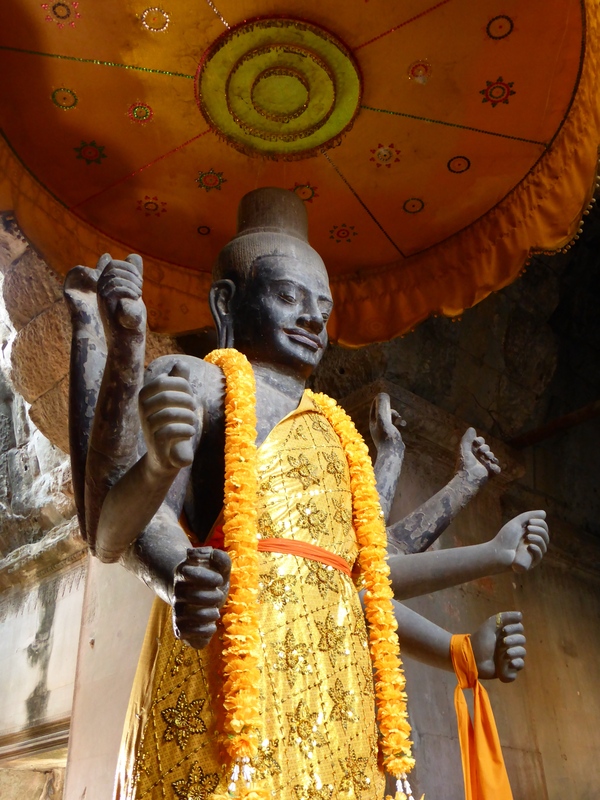 …we tuk tuk onwards to the cave of Prince Souphanouvong, one of the founding fathers of the Pathet Lao. 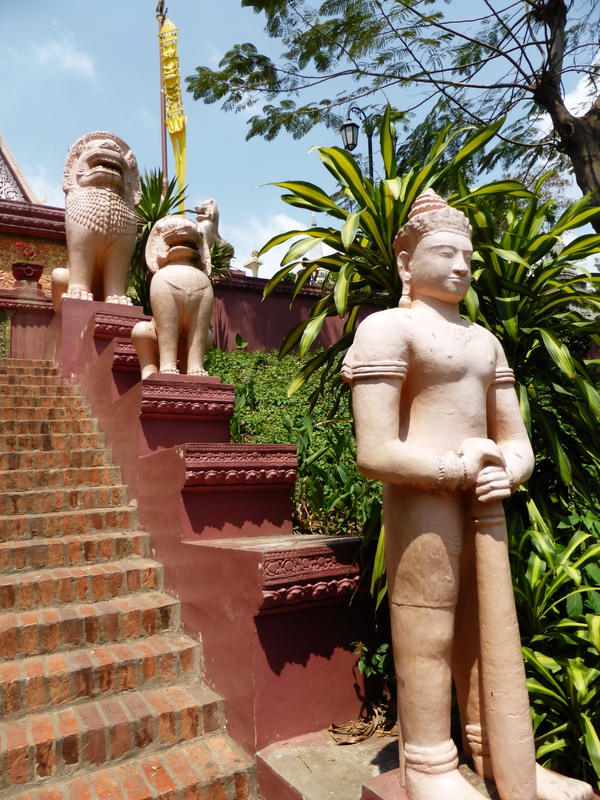 He was known as the ‘Red Prince’, born into royalty in Luang Prabang but turned visionary by the education he received at the University of Hanoi. Having spent a great deal of time in the company of Ho Chi Minh, he met Kaysone Phomhivane in 1950 and the building blocks of their movement were in place. Here we are struck by the peacefulness and the beauty of the gardens that the Prince personally tended during their captivity. 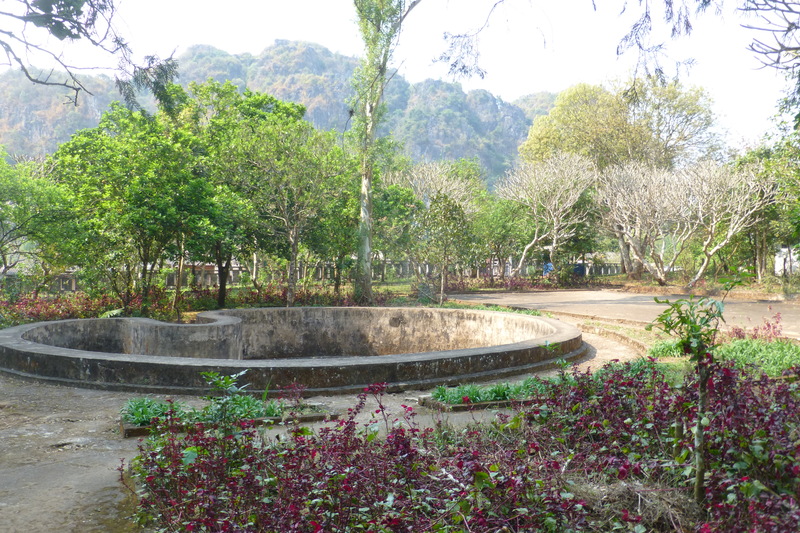 There is also a stupa dedicated to the life of his son which was taken by enemy agents. You can almost feel the swell of power that this anger must have given them. 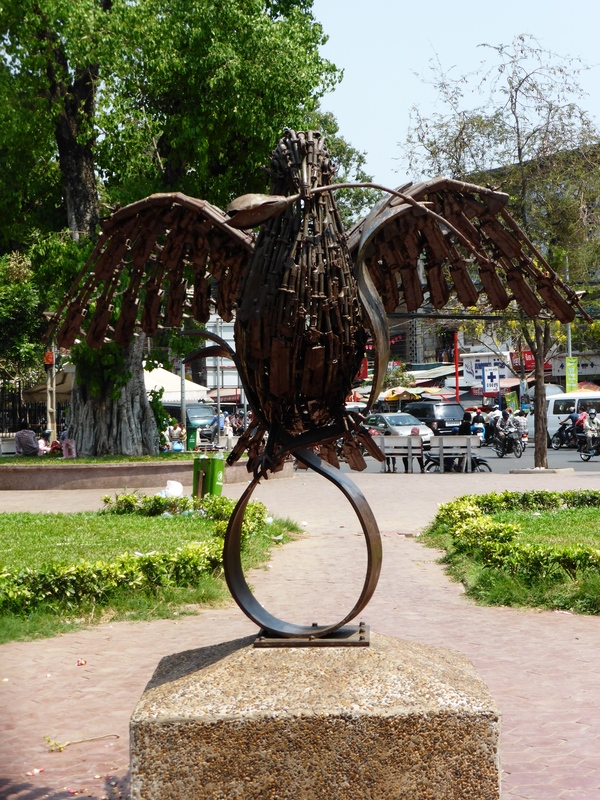 Vivid descriptions from eye witnesses on the audio tour talk of US spotter planes flown by a group of pilots known as the Ravens, who were employed by a private company called Air America that ran a transport service throughout Southeast Asia. They delivered aid and ammunition to the US effort, carried spies and refugees and flew reconnaissance missions to identify air strike targets. If caught, they would not be publicly acknowledged by the forces that gave them their orders. It later turned out that those orders were given by the CIA who owned and operated Air America. 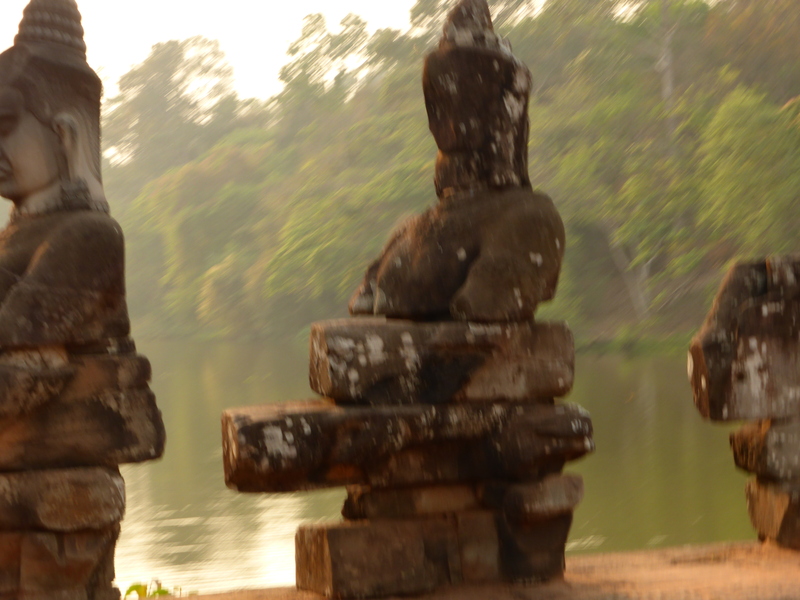 Throughout the region, the resourceful nature of the Laos people is on display with many bomb craters since being transformed into water troughs, swimming pools and cultural landmarks. 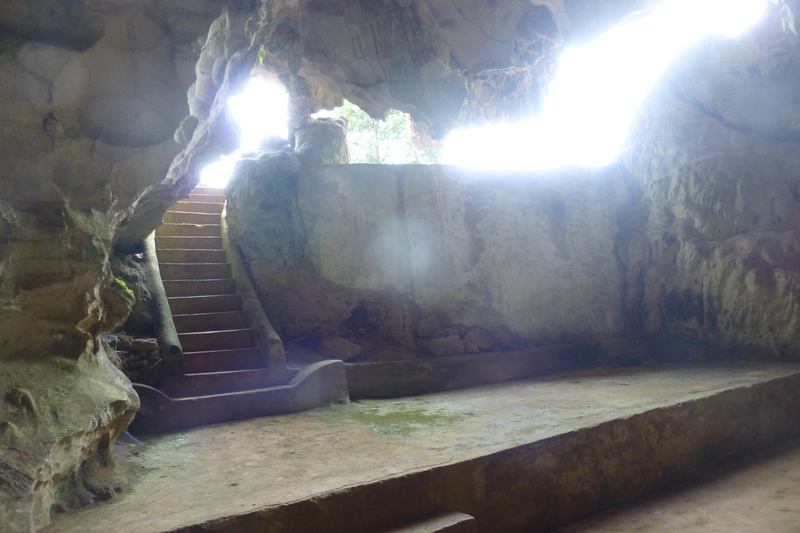 Finally, we end up at the cave of Khamtay Siphandone which also doubled as the headquarters of the movement, from which all communications were run. And by communications, I mean the daily newspaper and radio station they produced broadcasting to the network of 450 caves and throughout the country. 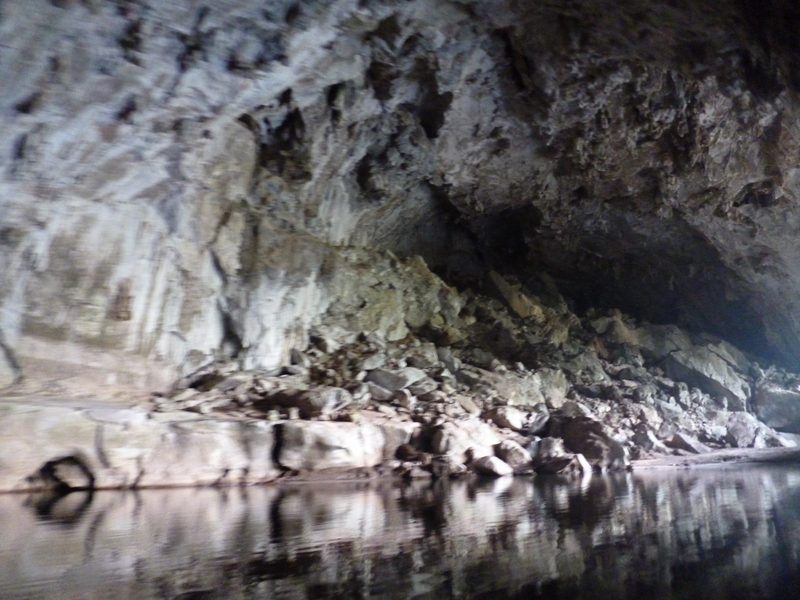 I’m wonderfully mind-boggled by this…and by the impressive array of caves within here. …complete with dressing room yo! 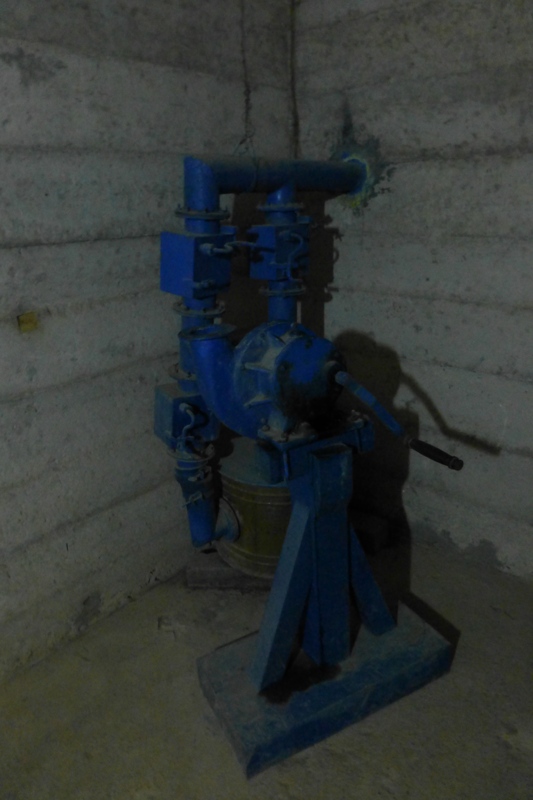 …with handpump installed to ensure that uncontaminated oxygen could be drawn into the room to keep them alive. 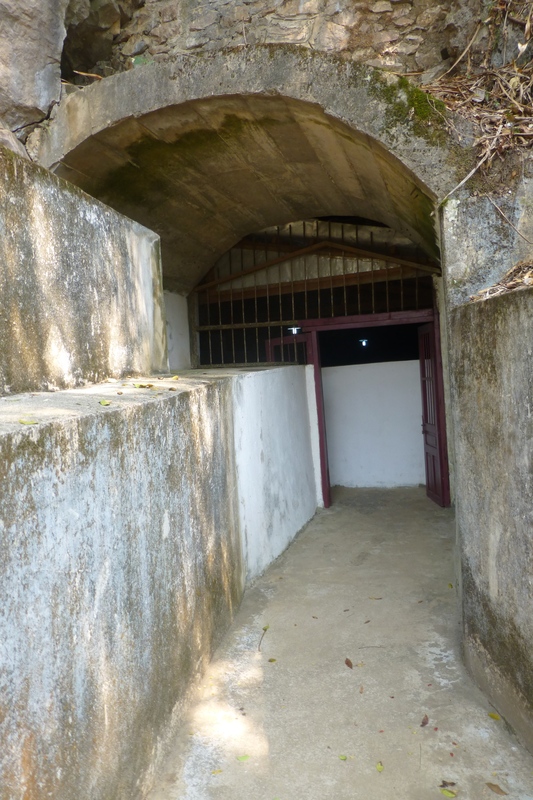 The final stop on the tour is at the artillery cave, from which, after a climb, you can look out over the landscape from the spot the Pathet Lao used to scan the skies for enemy aircraft. It was one of the safest areas because it was situated at the top of the mountain (therefore no falling rocks or rubble could harm you) plus the area was loaded with anti-artillery guns that shot down US bombers. …and the still and rolling hills below set the unlikeliest of scenes for the pictures being described. 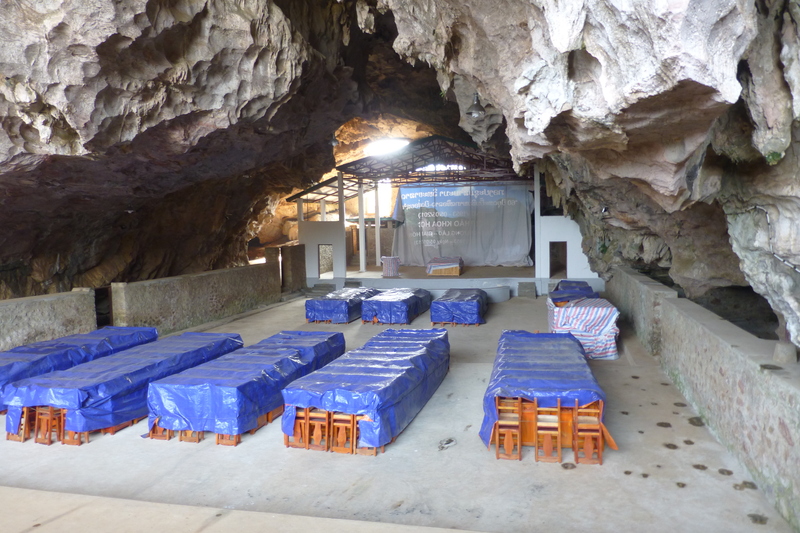 A ceasefire came to pass in January 1973 at which point the Pathet Lao could leave the caves and move back into their desecrated villages to rebuild what was left of the country. 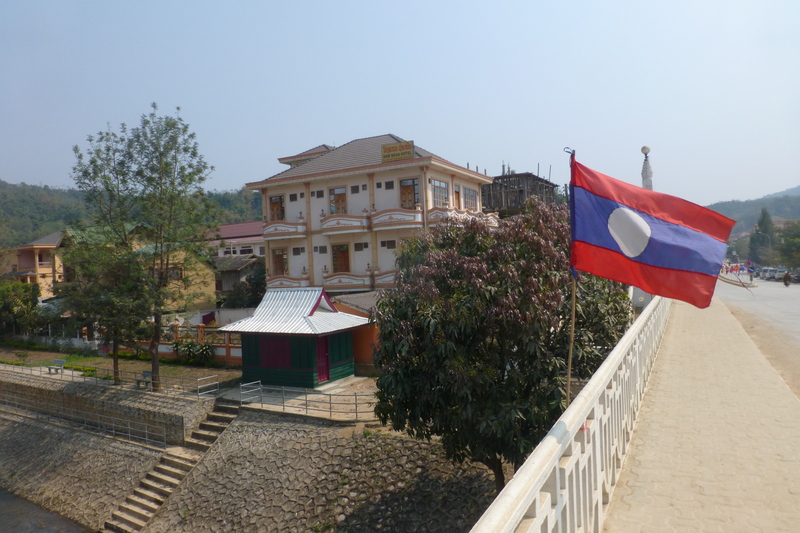 It took nearly another three years for the complete independence of Laos and the abdication of the King. 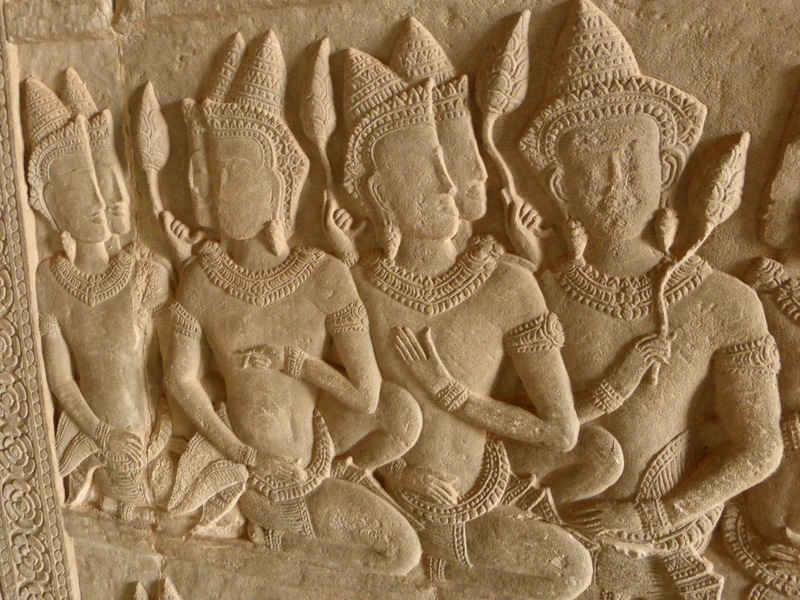 At this time, Phomvihane and Souphanouvong took lead roles in the government which continues to rule present day Laos. This conflict, albeit secret at the time, has unmistakably shaped this nation. 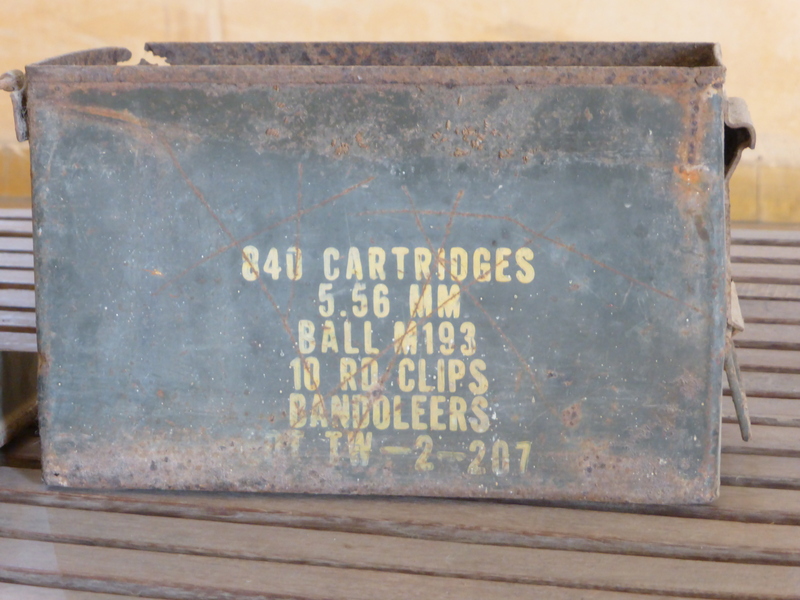 In 2008, a convention was signed in Oslo by 94 governments banning the use of cluster munitions and committing to help those nations contaminated by them. Notably, the US did not sign this convention. 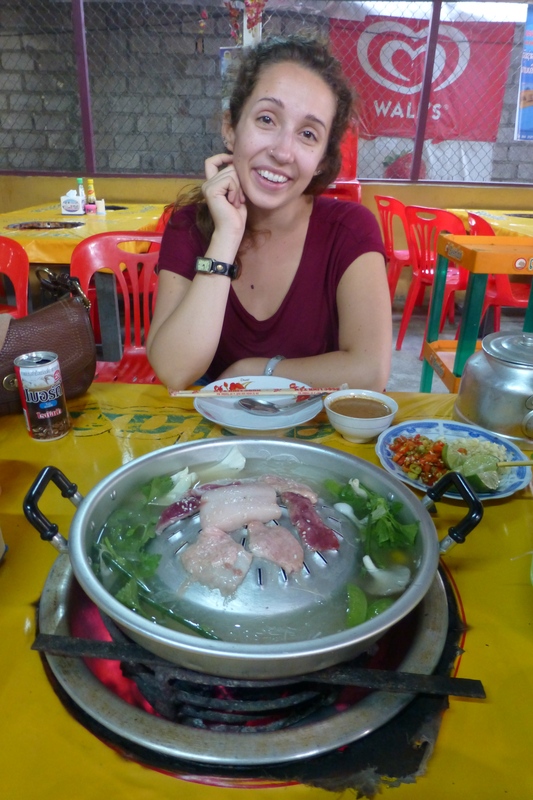 There is plenty to think about on the way back to Xam Neua where we delve into our first Lao fondue experience! 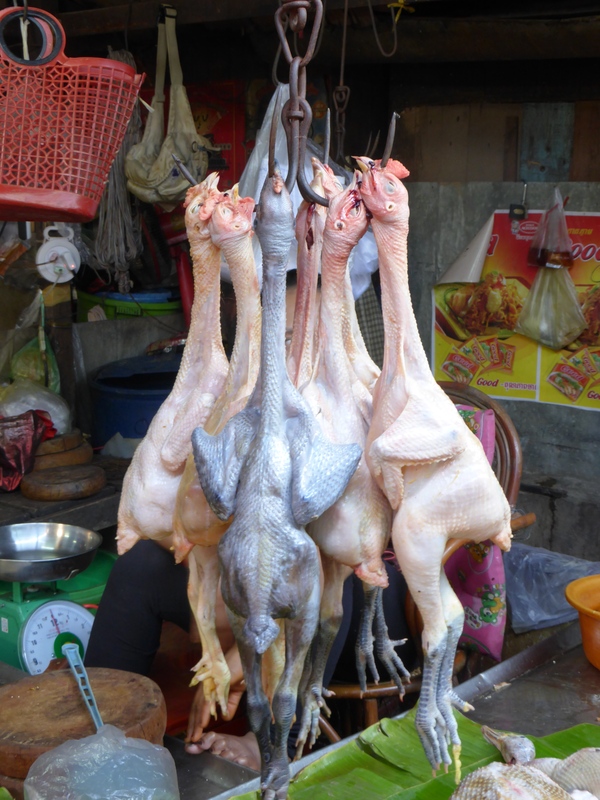 Having been recommended a restaurant called Mrs On’s BBQ, we settle down to the Lao speciality. 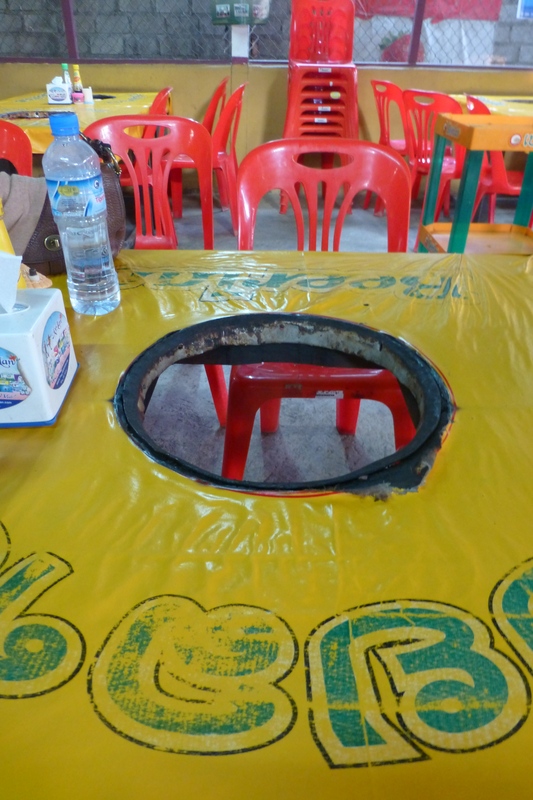 A wrought iron bowl is placed in the hole in the middle of your table with coals burning. On it a spherical dome is placed with a ‘moat’ surrounding it. 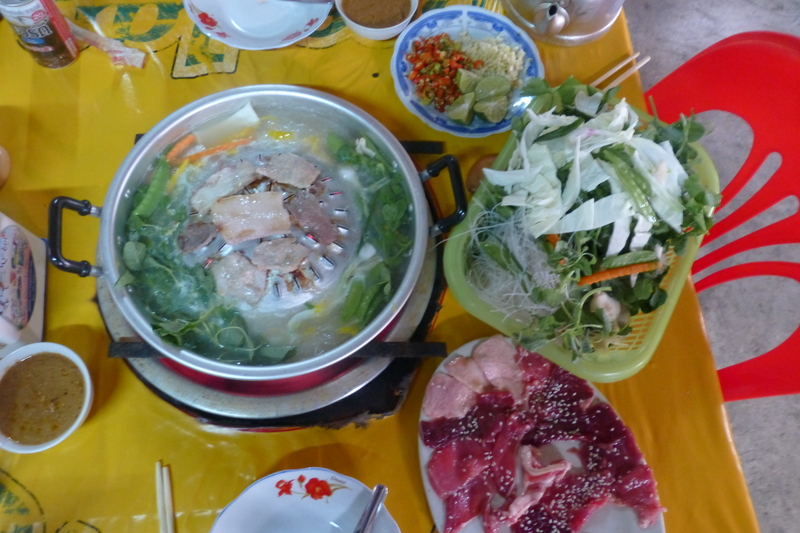 It is very much a DIY approach.You’re given a plate of raw meats, a selection of glass noodles and vegetables and huge kettle full of stock. 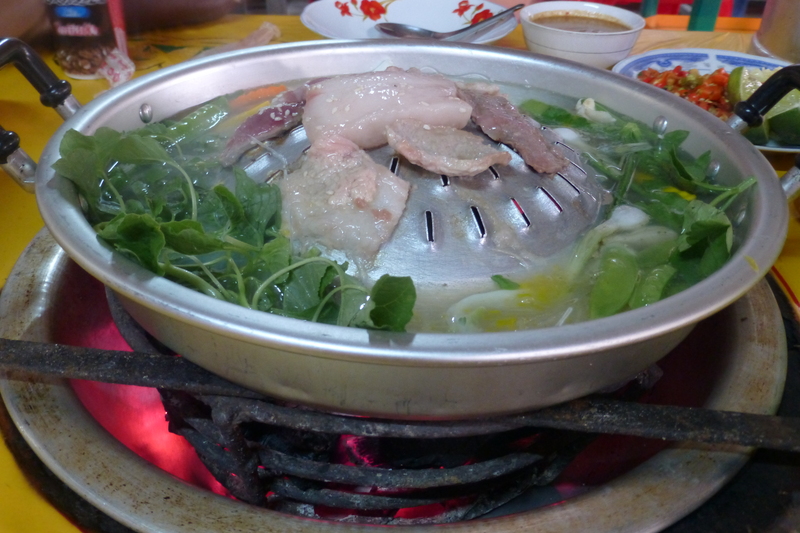 You place the meat in the middle to cook whilst filling the ‘moat’ with stock and your selection of veg. It’s really rather brilliant. 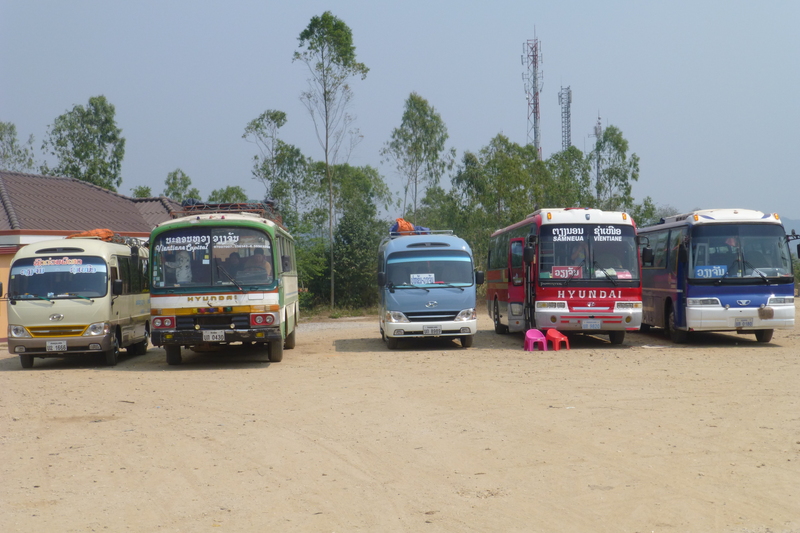 And because we’re a game couple of travellers, we decide to take on yet another bus journey the next day…this time an easy peasy ten hours from Xam Neua to Phonsavan. The former doesn’t have enough to pique our interest for another day, so we’re on the move again. Back to the bus station we go, this time in daylight. 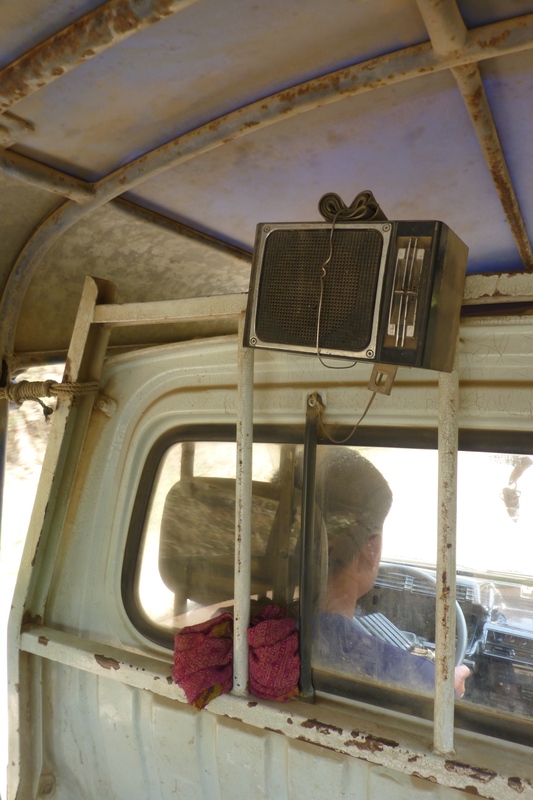 This was an incredibly unique journey, in that the battered bus had rusted holes in the floor so we can see the road moving at breakneck speed below us. We can also add spitting to the soundtrack of vomiting we have become accustomed to. Only the music and the view out the window makeup for what is absolutely the worst bus journey I have endured in any country.